BondCam MilCam Multi. Swatch 100 cm x 50 cm from a full design 150 cm by 100 cm, repeating. 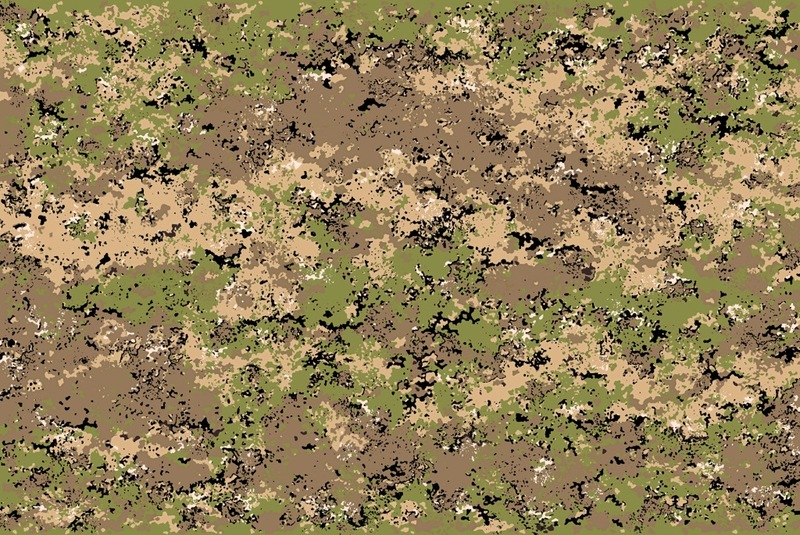 A multi-terrain camouflage design by David Clode. 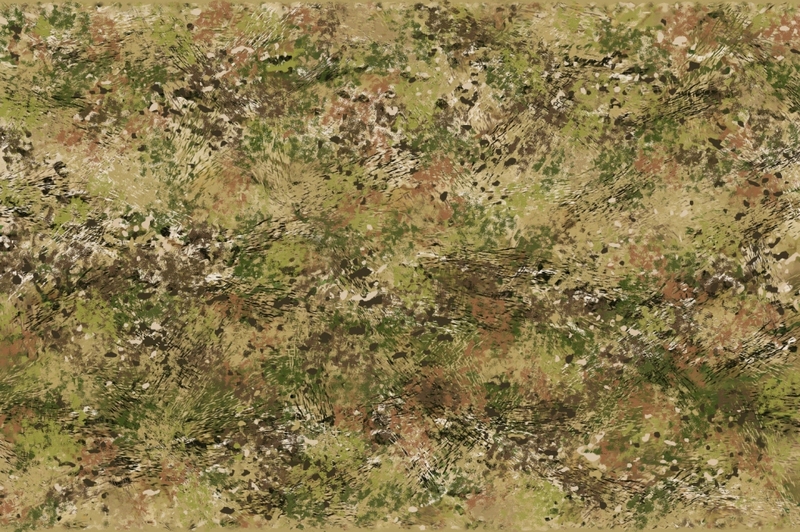 Camouflage designs by David Clode for sale for multiple terrains and purposes. Email: daveclode@hotmail.com. 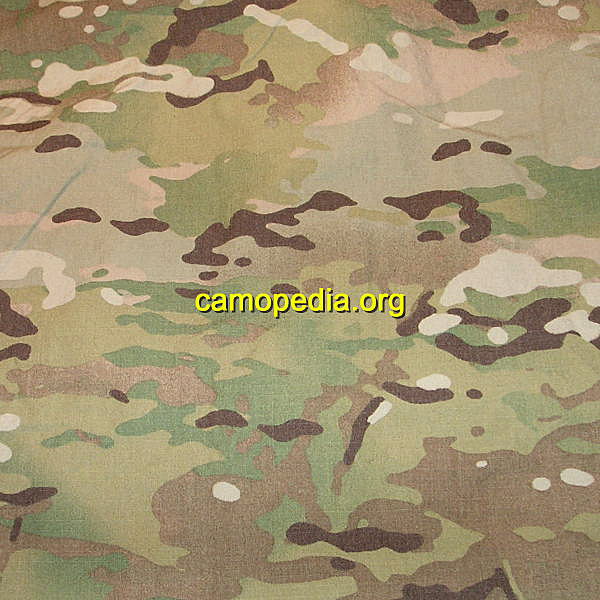 Click on the menu bar buttons at the top of the page for a choice of camouflage patterns for various terrains. I can modify tones, colours, layout etc., for specific purposes or terrains. Some designs are still a work in progress, and many still need a seamless join, all of which I can do quickly for a purchaser. 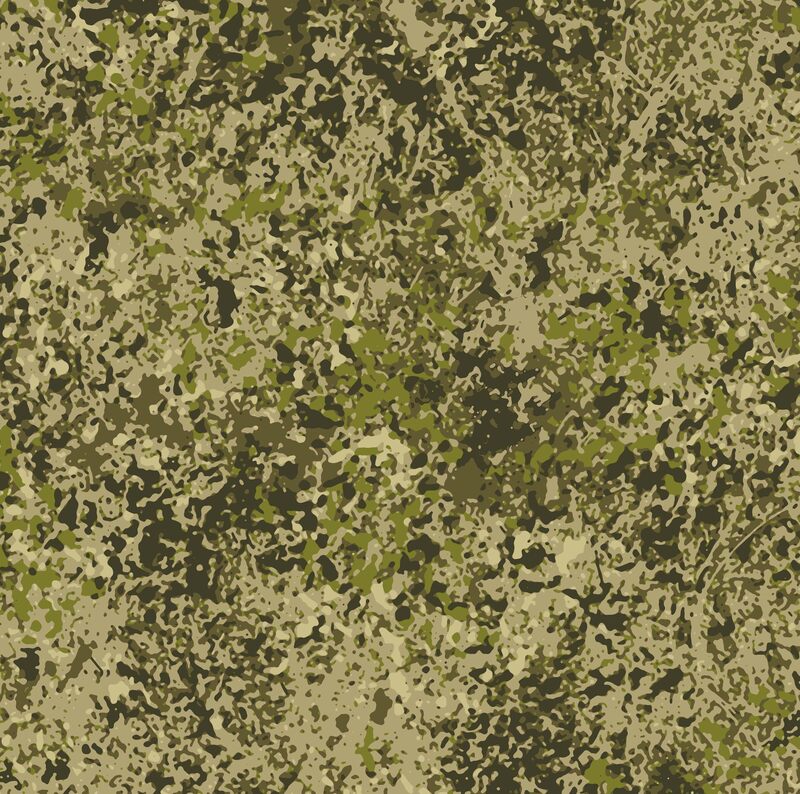 My camouflage designs are called BondCam because my middle name is Bond. 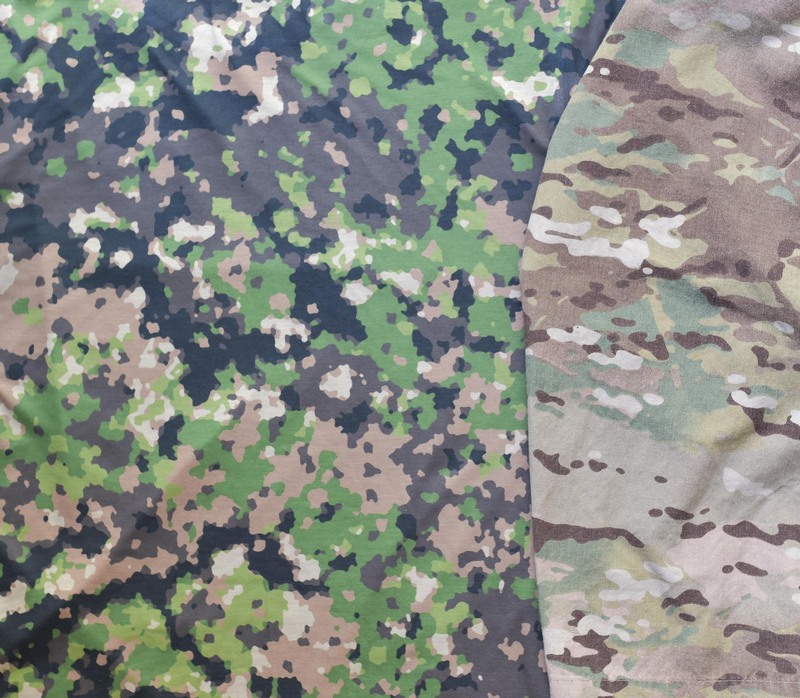 My aim is to help heroic soldiers of democratic countries and heroic anti-poaching rangers, by providing them with camouflage which gives them a qualitative edge, so I have kept my prices low. 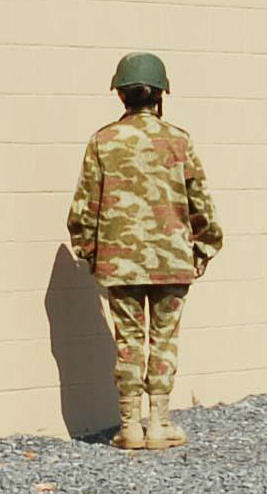 Appropriate and well designed camouflage should reduce casualties by about 15 – 20%, and also help soldiers or rangers to be as effective as possible in performing their missions. 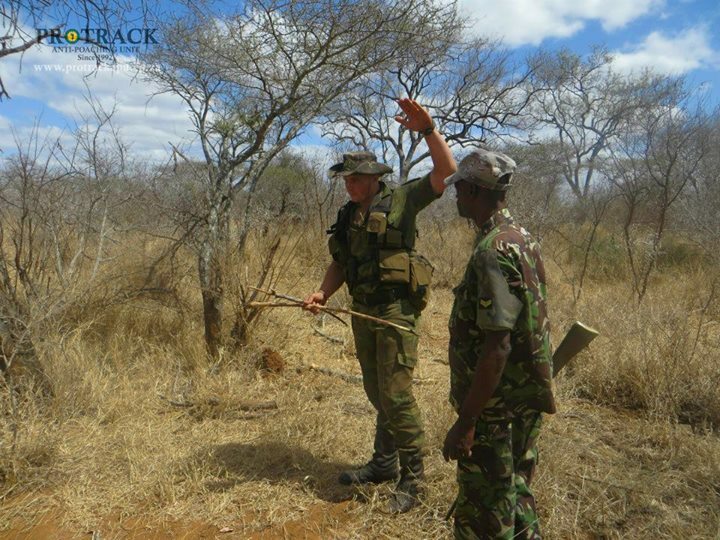 Anti-poaching rangers need camouflage suited to the terrain. Most camouflage designs do not work well. Photo: ConservationTravelAfrica. BondCam Broad Spectrum 3 M2. 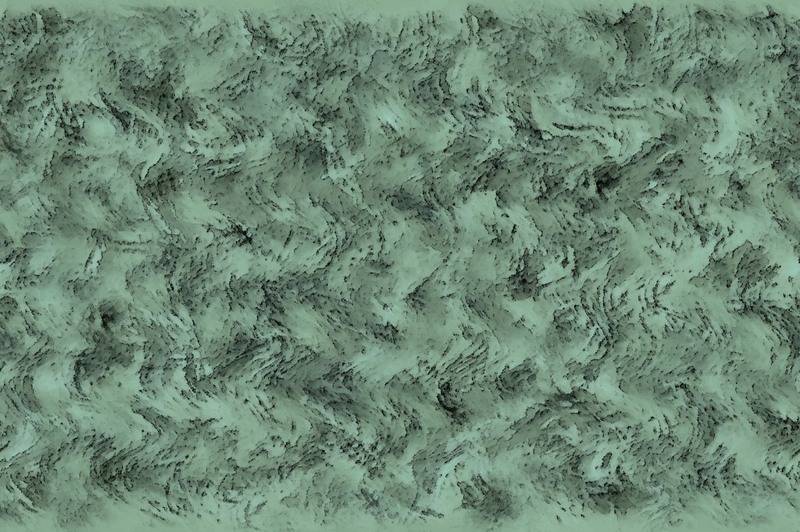 Multi-terrain pattern. 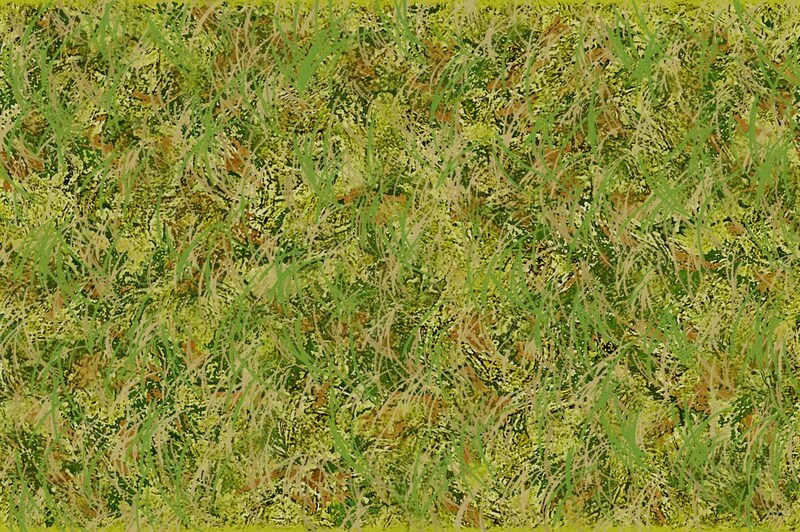 One metre by 1.5 metre camouflage design by David Clode. New – October/November 2018. 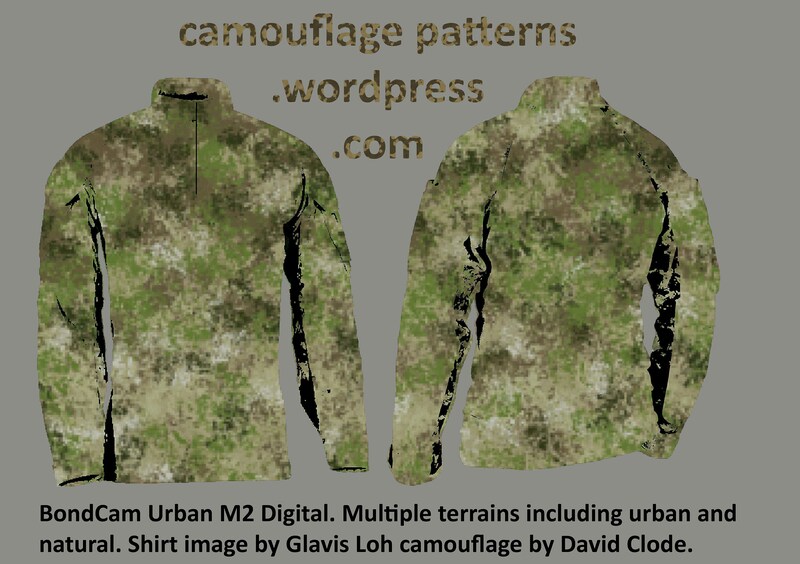 Please see the new MilCam (short for military camouflage) designs on the pages: desert and urban, Mediterranean and semi-arid, forest and woodland, and multi-terrain camouflage pages (MilCam Dry Light, Dry, Multi, Wet, Urban). 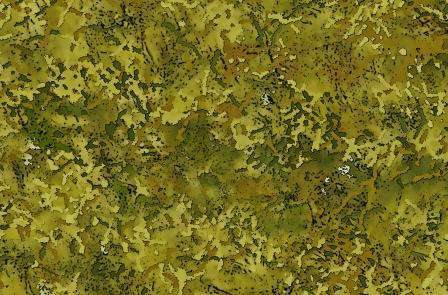 Please see the new RangerCam Mid, Light, and Wet designs on the “Anti-poaching Camouflage” page. October 2018. For a quick impression of some of the hundreds of designs available, see the “Camouflage Mockups” page. 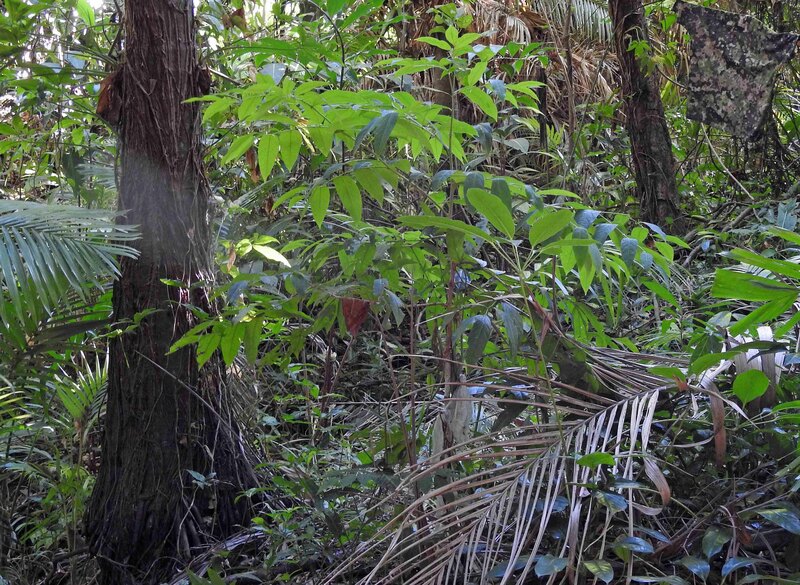 Person wearing a t-shirt of BondCam Defender M3 Greener in a tropical rain forest. Camouflage design, test and photo: David Clode . For anti-poaching purposes, I will happily donate one design per organization free of charge (non-exclusive use). US$4000 per design for exclusive use. US$40,000 per design for exclusive use. 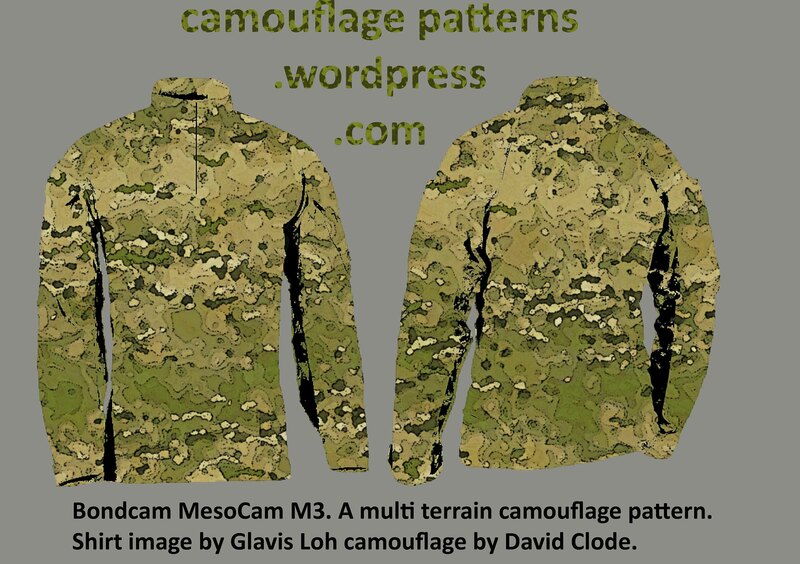 This is an exceptionally good offer, considering that some of my designs have been tested and shown to be better than MultiCam, in some terrains, for less than a tenth of the price of MultiCam. 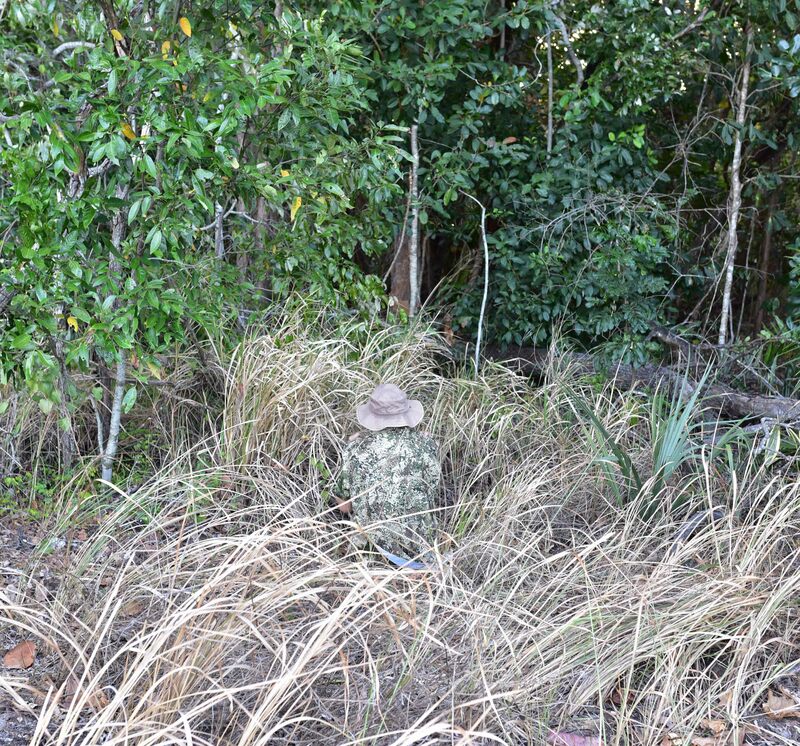 Camouflage tests on this site have been carried out in various terrains in England, Australia and Canada. Many of the designs tested very well, however, being something of a perfectionist, I plan to continue making improvements. 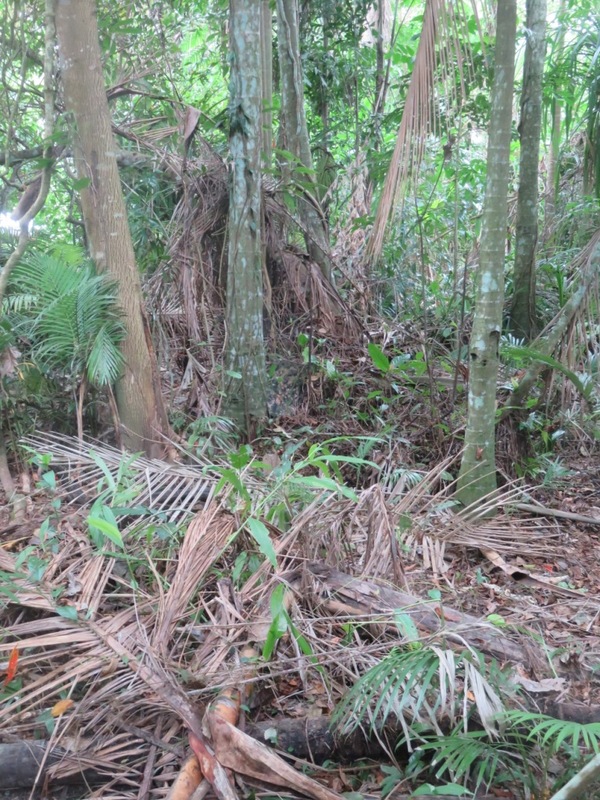 An example of a tropical rain forest test photo below, with other photos throughout the site, and on the “Testing Camouflage” page. 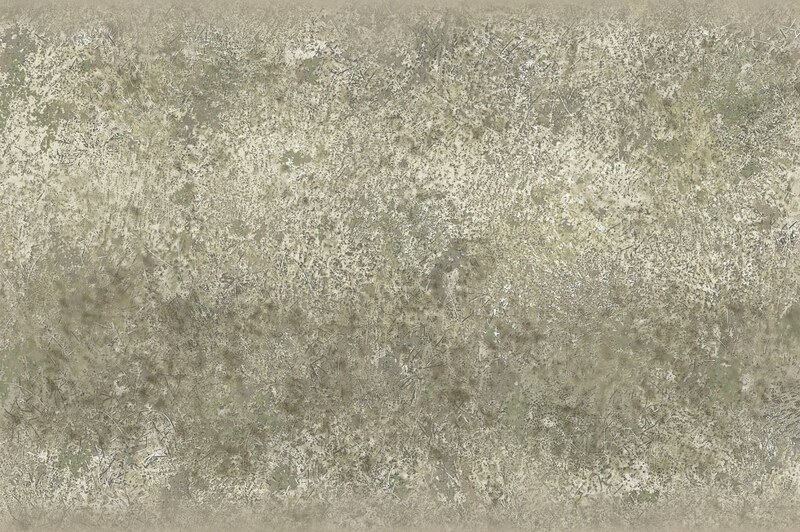 Camouflage test. Hanging T-shirt of BondCam Rain Forest 2 M1 S Super Digital 2. 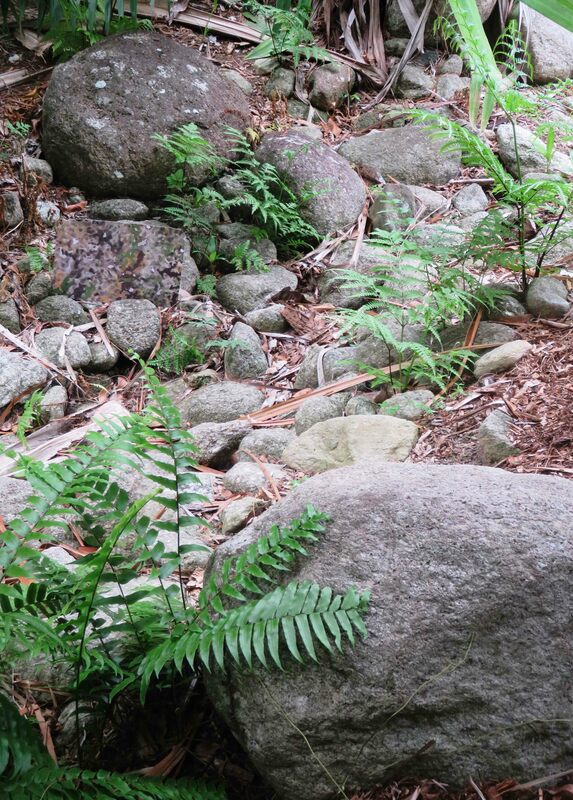 Tested in a tropical rain forest in Australia. Top right hand corner. Camouflage design, test and photo by David Clode. Super Digital camouflage design in the above photo. My Super Digital designs are intended to be the best of both worlds (analogue and digital). 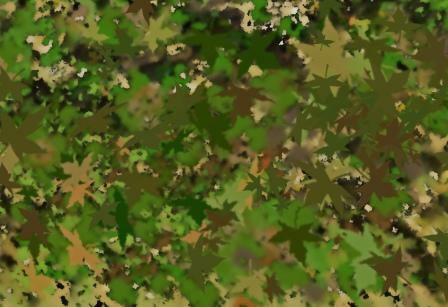 See the page “Digital Camouflage and Super Digital Camouflage”. 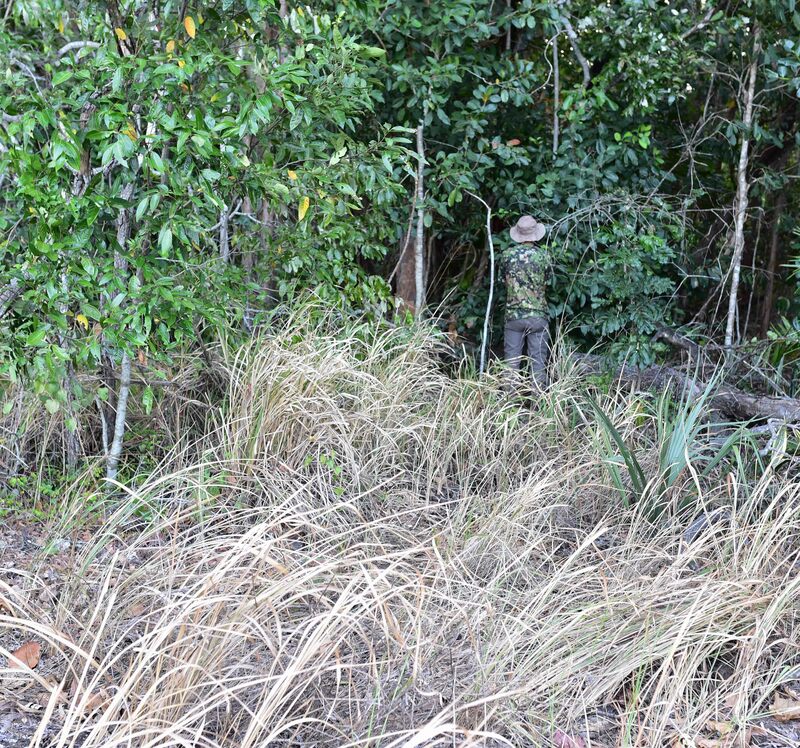 Person wearing a T-shirt of BondCam Defender M3 Greener next to elephant grass in tropical Australia. Camouflage design, test and photo: David Clode. 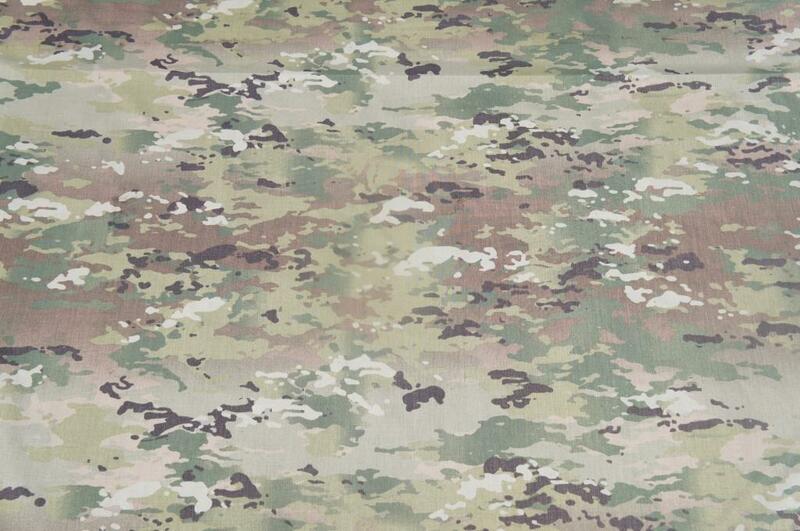 Defender M3 Greener is slightly better than MultiCam (see photo below) in this terrain. MultiCam next to elephant grass in tropical Australia. 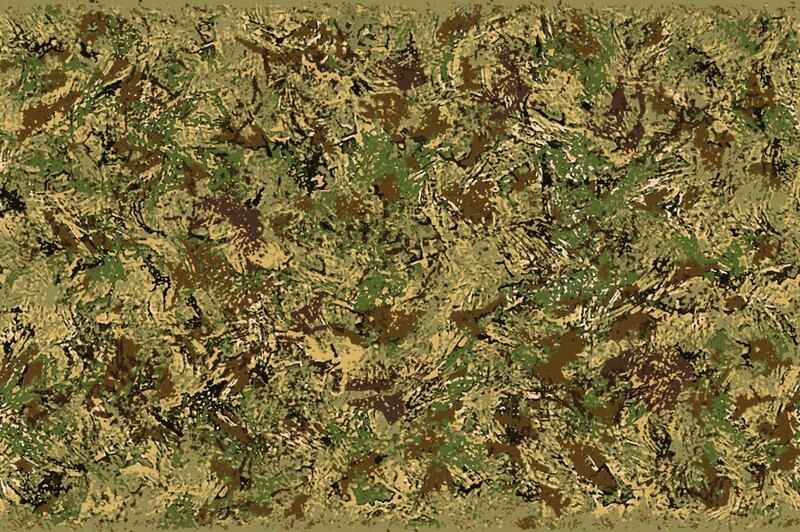 Camouflage design: Crye Precision. Test and photo: David Clode. New and improved versions of BondCam Defender M3 are now available. MTD2 Dry Light warmer is surprisingly good for a semi-arid design in this dark and wet tropical forest. Camouflage design and test: David Clode. My business philosophy, in addition to personal integrity, is “quiet professionalism”, where I strive to provide excellence at a very affordable price. I also endeavour to be creative, innovative and original, to “be daring, be first, be different”. My design philosophy is borrowed from an old Dunhill advert “It must work, it must look good, it must be the best of its kind”. Well, hopefully the first two at least. For more about me, see the “About” page. The letter M after the name of a camouflage design means that I have made additional modifications or improvements (M1 = first modification, M2 = second modification, etc. ). The letter S means simplified (overall), but also usually including simplification to as few colours as possible to make traditional printing of textiles cheaper. So a design which has M3 S or similar at the end of the name, means there have been 3 revisits to modify it for a specific purpose, and then simplifying it to a minimum number of colours. The names are not that important: for example, if a design is called “Pasture Beige”, and it works not only in pasture but also urban terrains, then it is a non-issue if it is used for urban terrains. BondCam Multi Terrain Five Col Digital 2. A multiple terrain digital/pixelated camouflage design by David Clode. Swatch of Multi Terrain Five Col Super Digital showing details of the design. Camouflage design by David Clode. 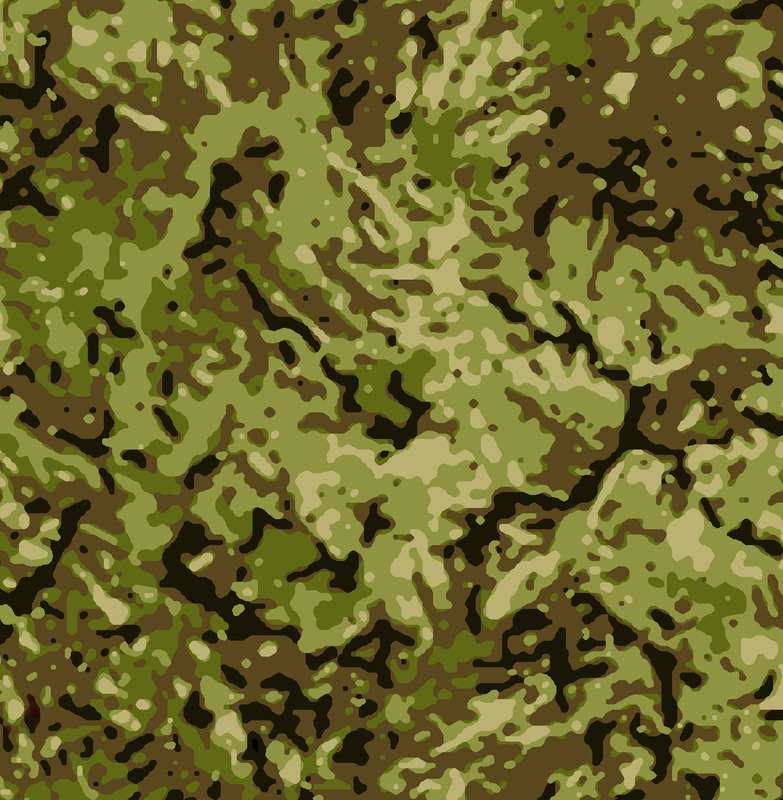 African Bush Camouflage M1 Super Digital Wet Season swatch. Camouflage David Clode. 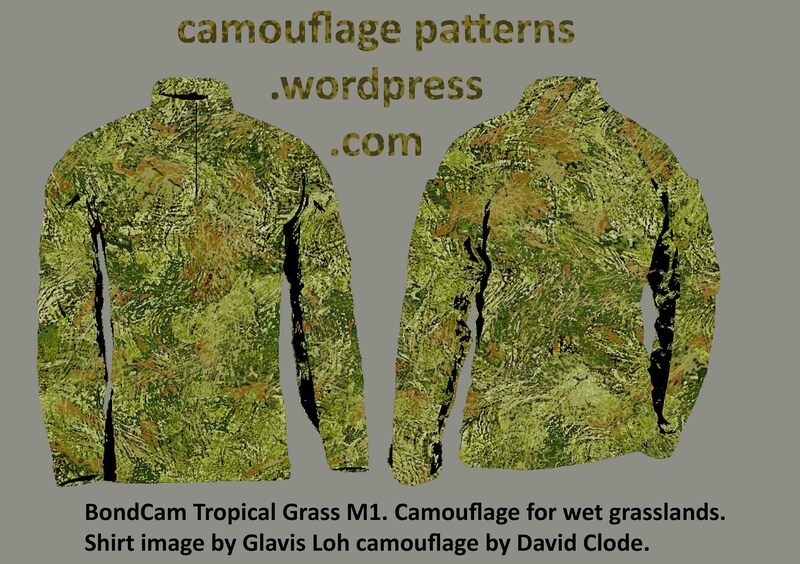 BondCam African Bush Camouflage M1 Super Digital Wet season Dull. 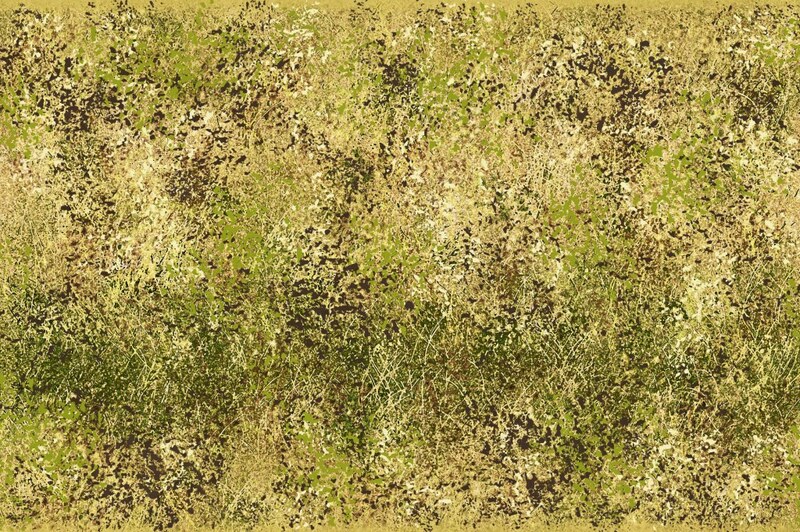 75cm x 75cm portion of a 1m x 1.5m design.Camouflage: David Clode. BondCam Contender Super Digital M1 Darker. For grassy woodlands and woodlands. 75cm x 75cm portion of a 100cm x 150cm design. Camouflage by David Clode. BondCam Contender Super Digital M1. 75cm x 75cm portion. For grasslands and grassy woodlands. Camouflage design by David Clode. 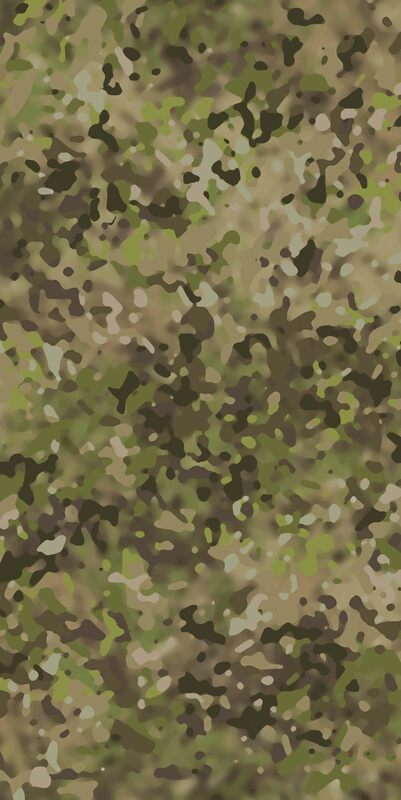 Some more improved designs on the “Anti-poaching Camouflage” page. BondCam MultiOps 2 M5 S, showing a 75cm x 75cm portion of a 100cm x 150cm design. 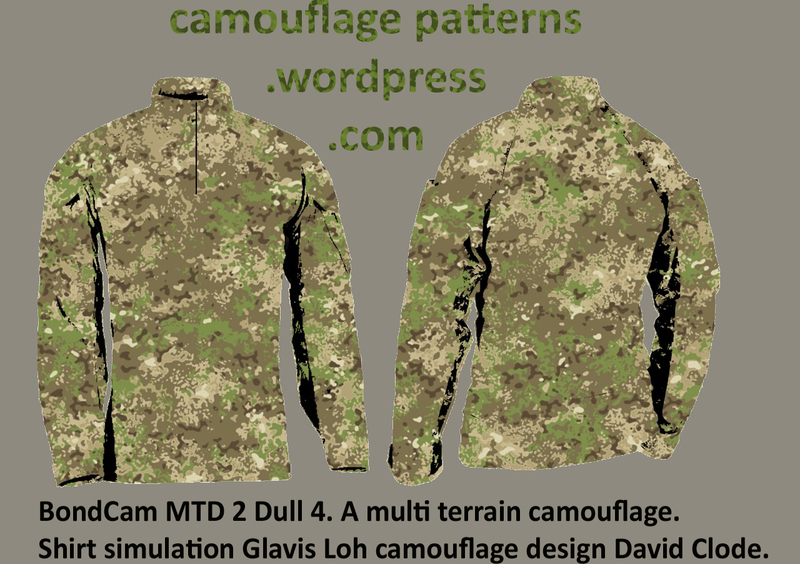 Multi-terrain camouflage pattern by David Clode. BondCam MTC Five Col Dull M4 Warmer swatch (approx. 50cm x 50cm). 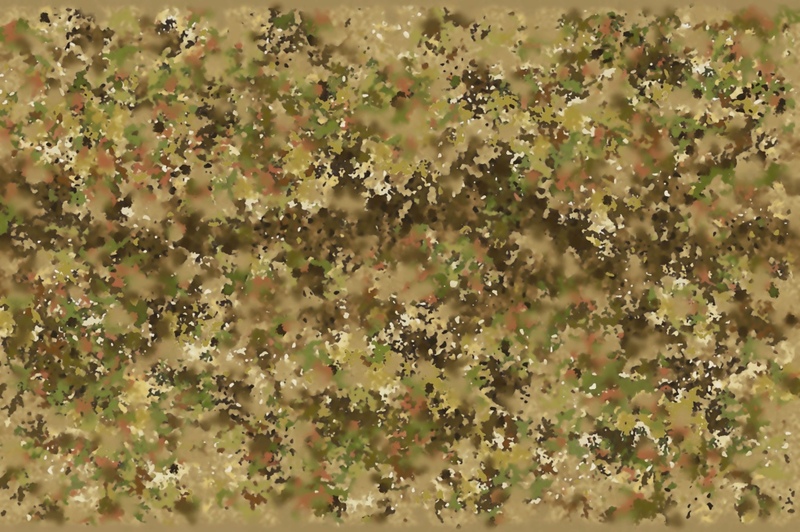 A multi-purpose, multi-terrain camouflage design by David Clode. BondCam Mediterranean Scrub Dry Season M3. For dry grassy woodlands and Mediterranean climate vegetation. Swatch 50cm x 100cm. Camouflage design by David Clode. BondCam Mediterranean Scrub Wet Season M3 Darker. 50cm x 100cm portion of a 150cm x 100cm design. For grasslands and grassy woodlands in the wet season. Camouflage design by David Clode. BondCam Pasture Beige M3 Lighter. 50cm x 50cm swatch. A design which should work reasonably well in both wet and dry seasons in grasslands and grassy woodlands, as well as semi-arid terrains. Camouflage: David Clode. 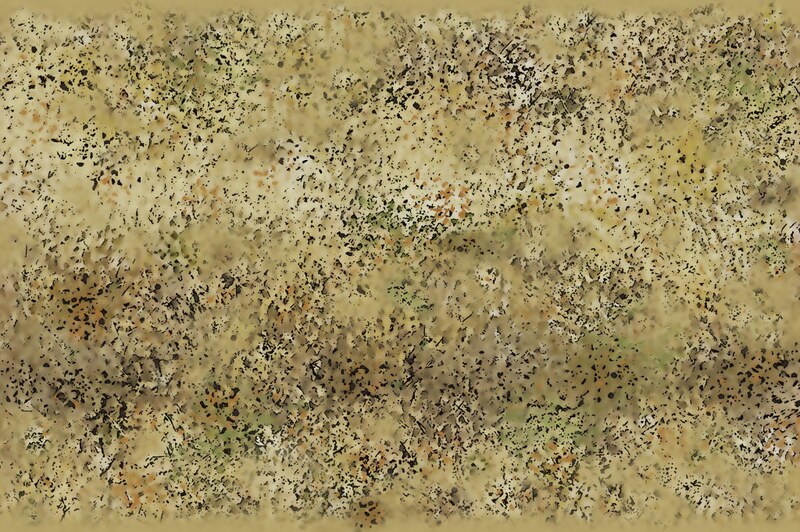 BondCam Temperate Desert M2 Super Digital (1.5 metres across by 1 metre repeating). 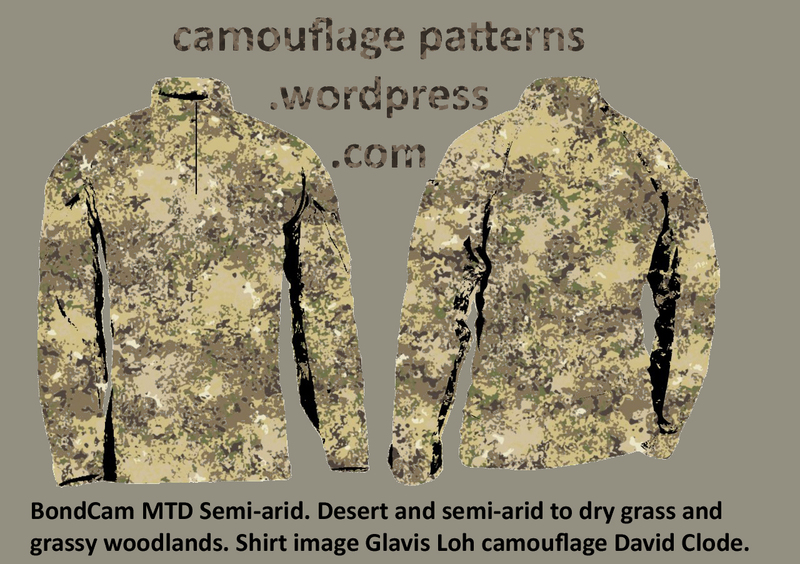 Desert camouflage pattern by David Clode. 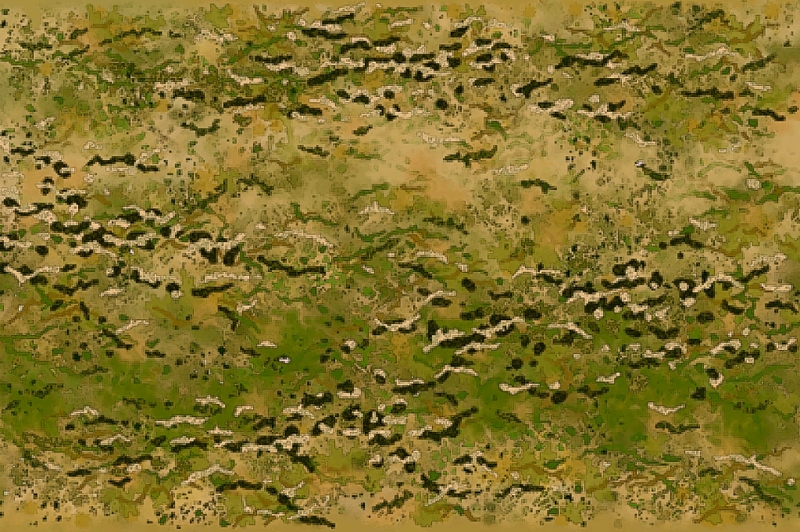 A desert design, but also suited to some semi-arid terrains, dry grasslands, and dry grassy woodlands. 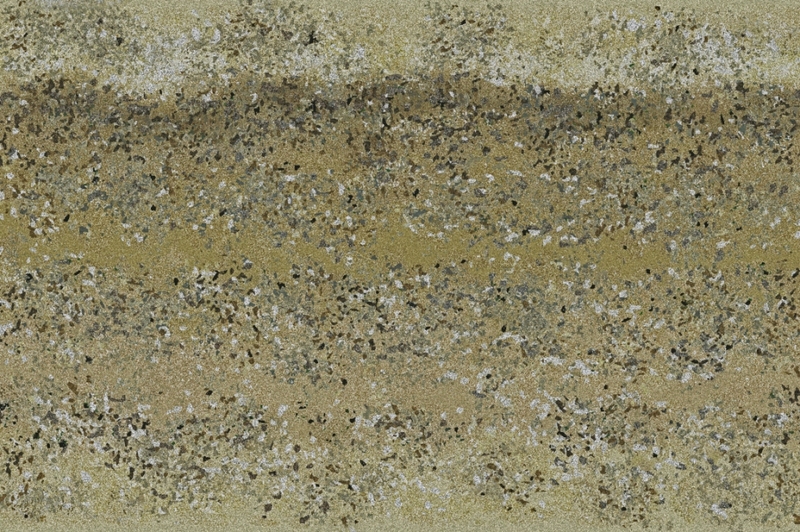 A slightly yellowish overall colour cast to suit yellowish deserts and dry grasses, but this can be made duller, or more pinkish, or whatever is needed to suit a specific terrain. BondCam African Bush Camouflage Super Digital. Camouflage: David Clode. 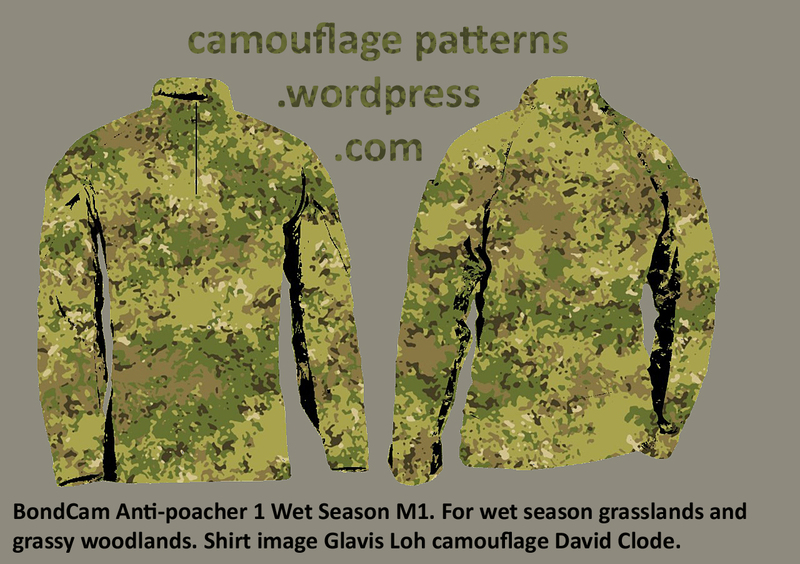 Small detailed swatch of Anti-poacher Wet Season M1 Digital. Camouflage design by David Clode. Bondcam Anti-poacher 1 Wet Season M1. Camouflage design by David Clode. 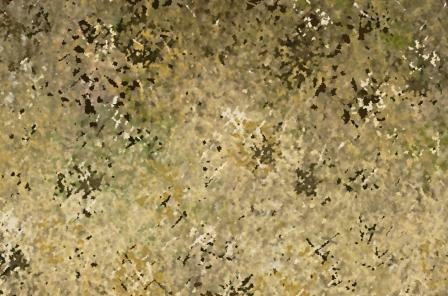 See the Anti-poaching Camouflage page for more, and the Digital Camouflage page. BondCam Temperate General Purpose M2 Super Digital. Camouflage design by David Clode. This camouflage should be similar in effectiveness to British and New Zealand MTP, making it a good multiple terrain alternative. The design should work reasonably well across a range of grassland, grassy woodland and woodland terrains, and some urban terrains. Colours and tones can be adjusted for specific purposes. BondCam Temperate General Purpose. Camouflage David Clode. Matthew Dermody – I like to call him the “The Ghillie Suit Guru”, in the USA (now in Australia) – see the page “Ghillie Suits”, and buy his excellent books. Allan Osment – an exceptional camouflage designer, tester, and military camouflage expert, in England – see the page “Allan Osment Camouflage”, and visit his site CamouflageGeek.WordPress.com. Thanks to the guys listed above for all their help, and to others who have helped in some way or another: Sian Butler, Bryan Clode, Laya clode, Robert Michael Clode, Eric H. Larson, Torsten Muller, Nigel Ross. Thanks to Marshall Strowbridge in Canada for making his camouflage test photos available. Camouflage which both works and looks good. “Clothes maketh the man” (or the woman!). 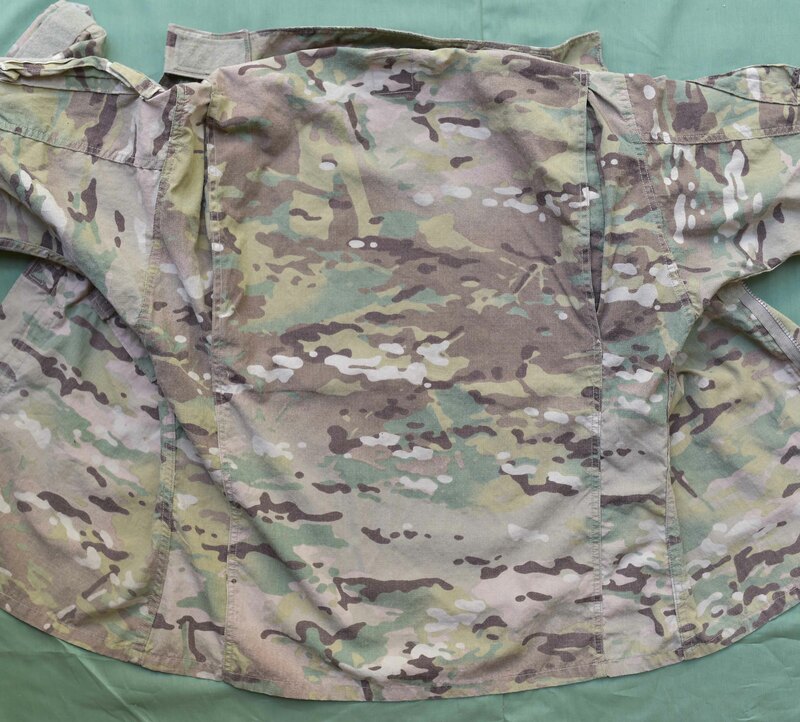 Montenegrin MultiCam, an excellent design. 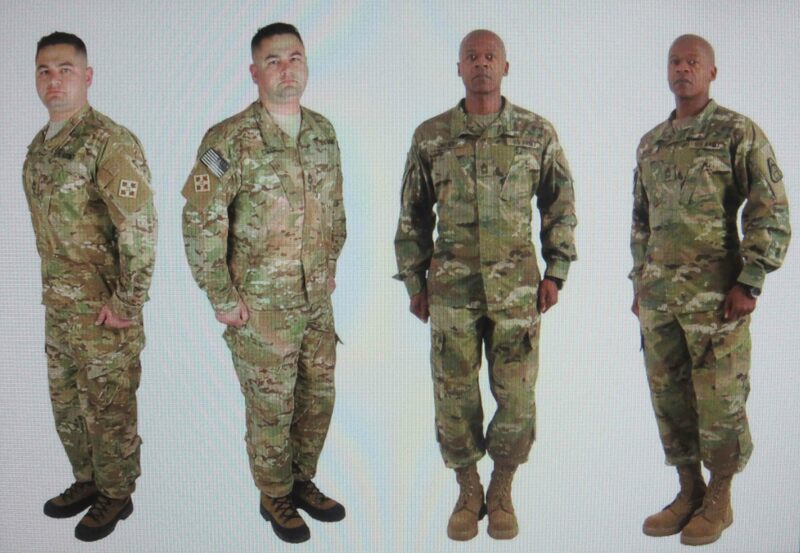 MultiCam is tried-and-tested, and proven to be one of the best designs in the world. Photos above and below kindly supplied by Eric H. Larson, Camopedia.org. Montenegrin MultiCam. Photo: Eric H. Larson, Camopedia.org. BondCam MTD 2 Dull 4. Possibly comparable in effectiveness to MultiCam and OCP/Scorpion W2, with fewer colours and therefore possibly cheaper to manufacture. Camouflage David Clode. 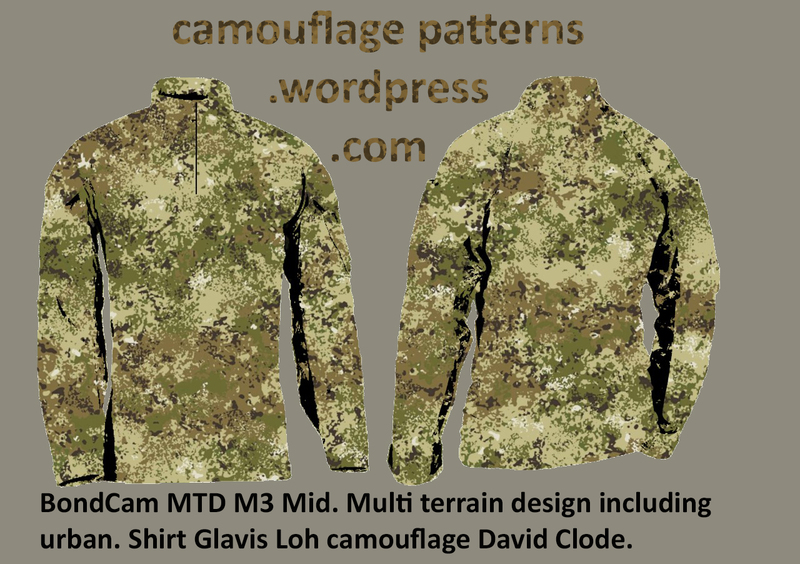 BondCam MTD2 Dry Light Warmer T-shirt compared to a used genuine MultiCam shirt. 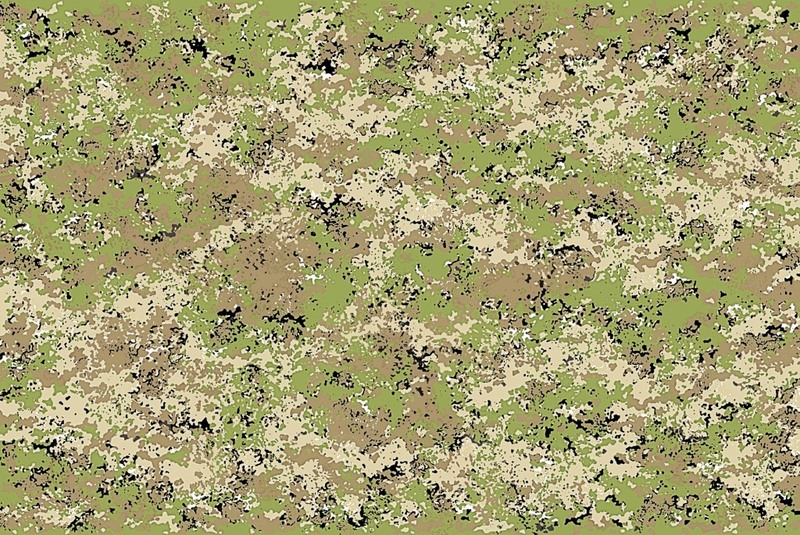 Multi-terrain camouflage pattern designed by David Clode. My new or modified camouflage designs are generally at the top of the pages. 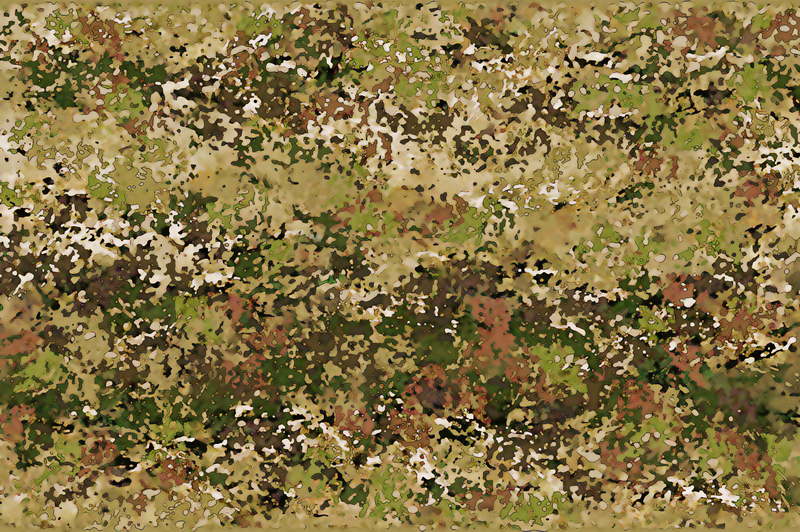 Since some people prefer digital camouflage, I have modified some designs to make them “digital” or pixelated looking, although they are still primarily hand crafted products of human creativity, often inspired by camouflage in nature (along with plenty of computer assistance of course). To copy or reproduce my designs without my permission is an infringement of copyright. 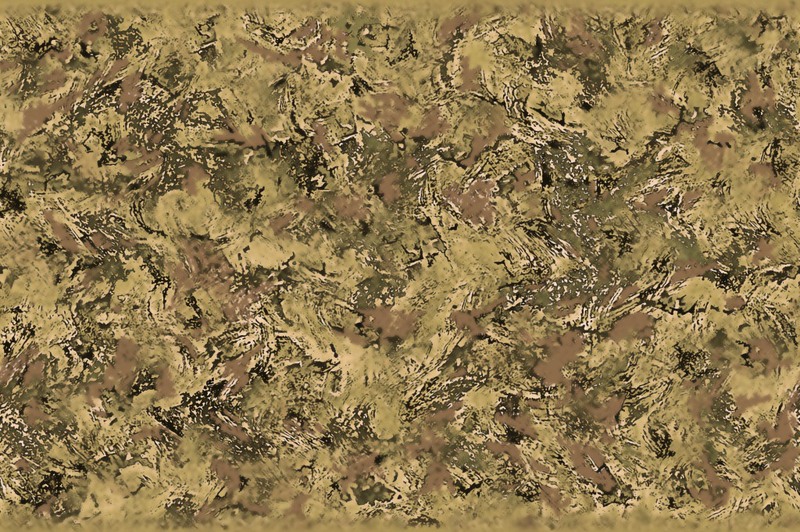 However, I think camouflage designs can make nice computer desk top backgrounds/screensavers, and I am happy for you to freely use any of my designs for this purpose. For free stuff, visit the “Free Military Motto Posters” page (see examples below). Also, if you contact me, I am generally happy to give permission for my designs and photos to be used for non-commercial educational and scientific purposes. Mockup of BondCam Broad Spectrum M2 Improved Dry Light. 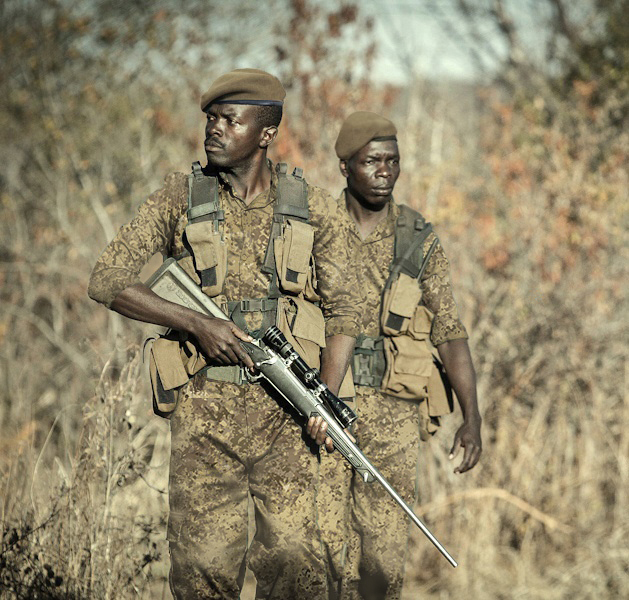 In this photo of anti-poaching rangers, the mockup uniform has been given a faded look to simulate a much-used and dusty look. Camouflage design by David Clode, mockup by Roger Dix, photo by National Geographic. 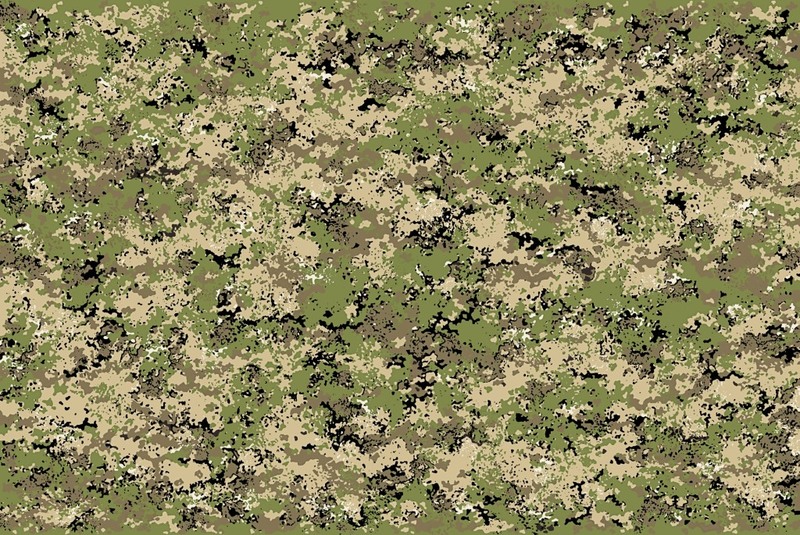 Syrian pattern – the best multiple terrain camouflage in the world? Sumpfmuster swatch (small portion of the design). Good disruption and micro pattern (very small dots and vertical streaks), but the red is too red. Photo: Eric H. Larson, Camopedia.org. 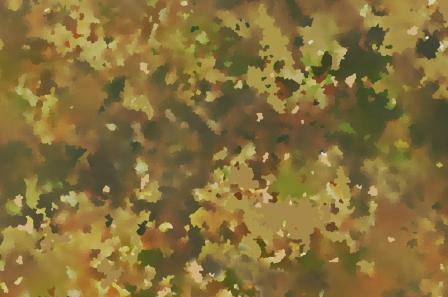 Syrian camouflage (probably a better photographic representation of the colours and tones). Photo: Natick. 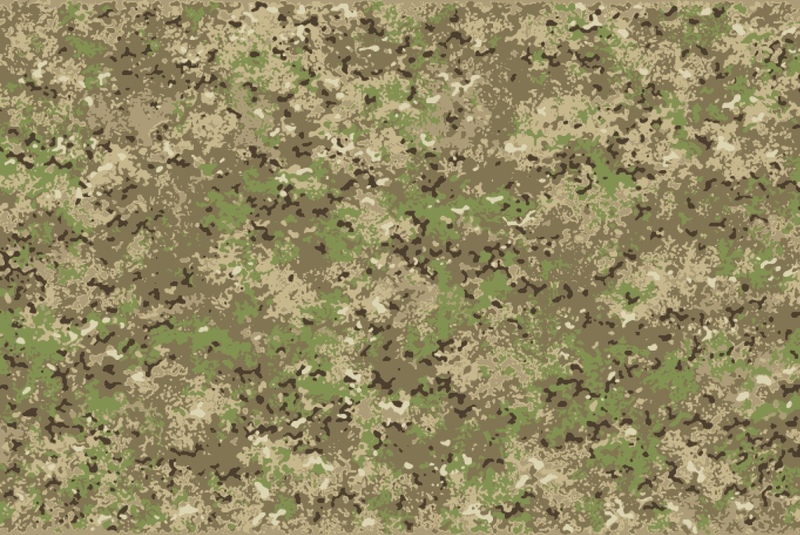 My camouflage designs below should be as good or better than the Syrian camouflage design, which was one of the best overall in Natick tests, significantly outperforming, or coming just behind other good performers such as MultiCam, Desert MARPAT, and many others, in multiple terrains. 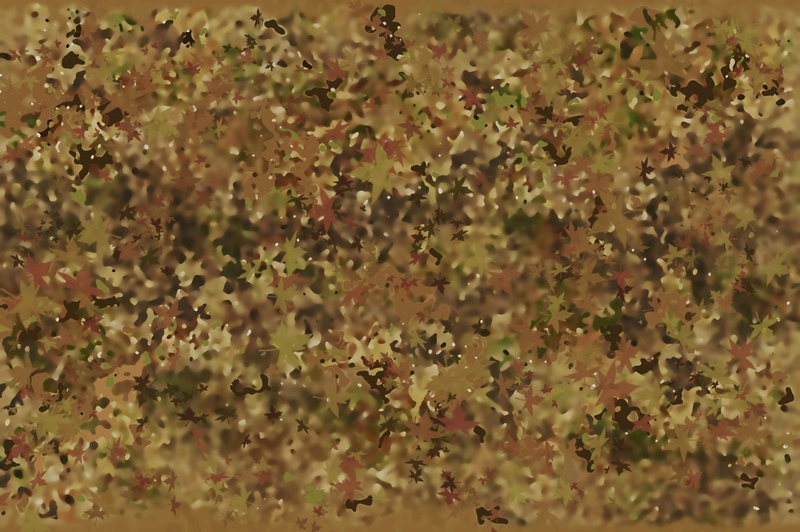 Syrian was therefore the best multi-terrain camouflage performer in this test, followed closely by Desert MARPAT and MultiCam. This South African Police design is similar in colour, tone, layout and micropattern to Syrian. 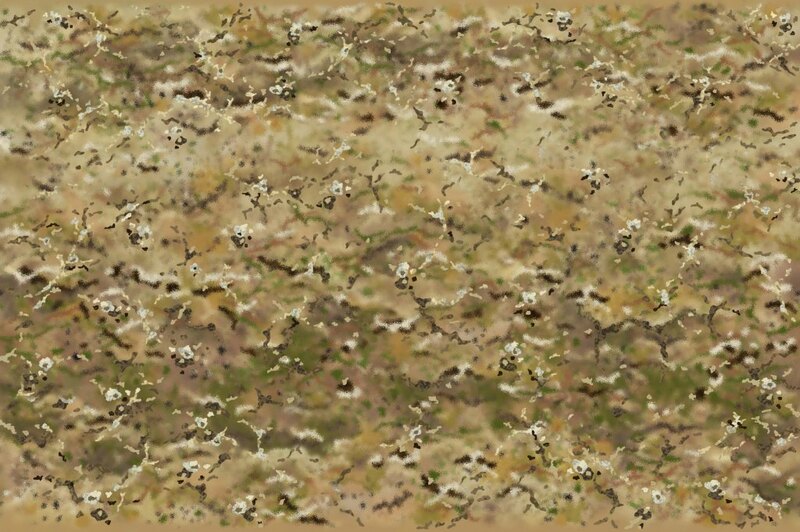 If it had been included in the Natick tests it could have been similar to or better than Syrian, and therefore could be the best or at least one of the best multi-terrain camouflage patterns in the world. BondCam MTD M3 Mid. Camouflage David Clode. BondCam MTD M3. The red colour of Syrian has been replaced with a subtler and much duller brown, while the design is similar in that it features disruptive bands (more disruptive than Syrian) and a micro pattern. Note the improvement gained by the addition of detailed very dark and also very light micro pattern elements. BondCam MTD M3 Light (MTD = Multi Terrain Design). Camouflage pattern by David Clode. BondCam MTD M4. Semi-arid and some urban terrains. Camouflage by David Clode. BondCam MTD M4 Dark compared to Multicam. This design has more in common with the “Syria” pattern that did so well in Natick tests. camouflage design by David Clode. A more omni-directional pattern, the designs above and below could be better than Syrian in woodland and grassy woodlands. BondCam MultiOps Semi-arid M1 Contrasty. overall, the designs are subtler. The designs above largely retain the features which make the Syrian pattern effective, with additional improvements, so it is reasonable to assume that they are likely to be among the best multiple terrain camouflage designs in the world. However, no design is perfect, and it is anticipated that modifications for a particular terrain, or the specific requirements of a purchaser, may be needed. These can be provided. 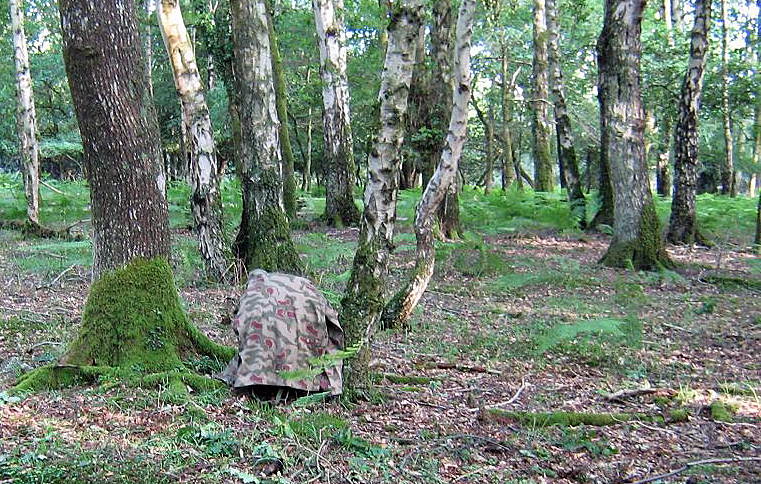 Miltec BGS camouflage (similar to Syrian and Sumpfmuster) in the New Forest (a temperate deciduous woodland), in England. 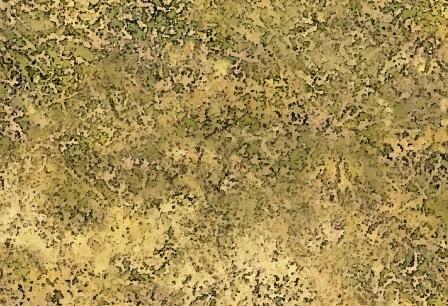 The dark reddish brown is a little too red for most terrains, the light beige is a little too light in this terrain, and the olive green could be lighter, yellower, and more saturated to better match this terrain (but the present green and dark beige work well in other lighter, drier terrains). 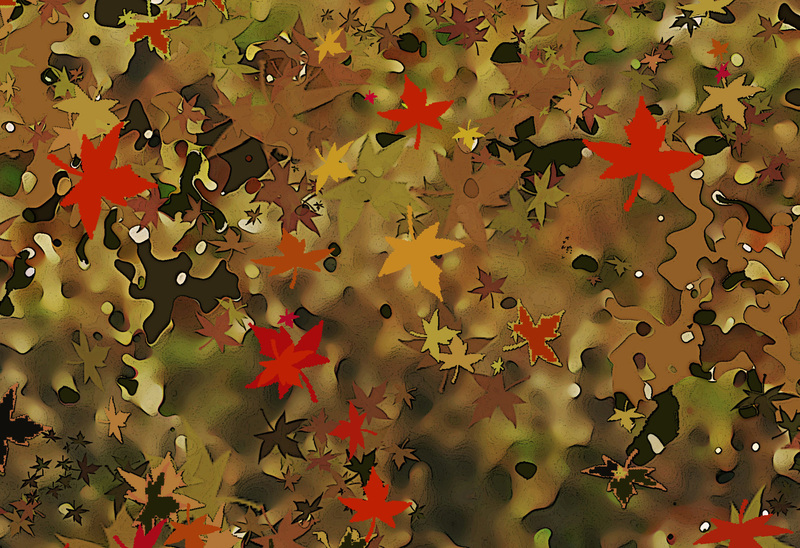 Camouflage, and especially multiple terrain camouflage, usually involves some compromises. Photo courtesy of Allan Osment. 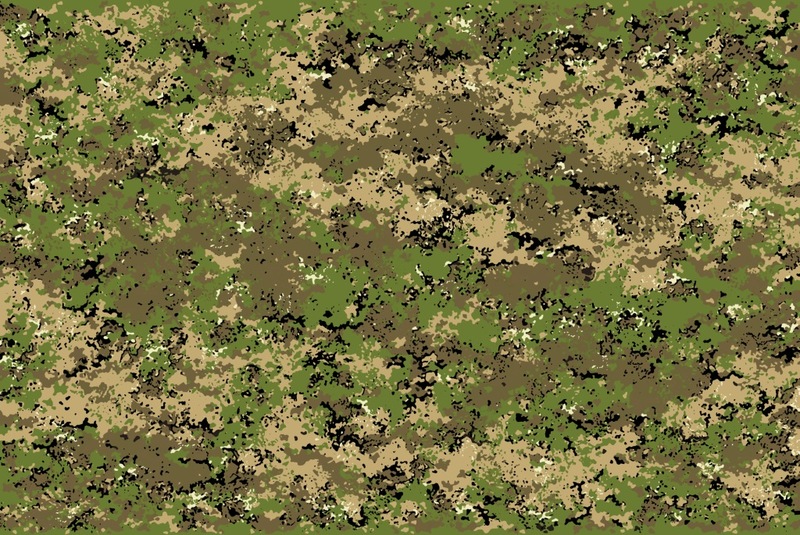 Hundreds of camouflage designs are available, suitable for defence forces (but only for “good” countries – generally speaking democracies that fight for and uphold civil liberties, e.g., South Korea, but not North Korea), and for conserving endangered wildlife in anti-poaching work. Countries or organizations that discriminate or persecute in any way can take their custom elsewhere. 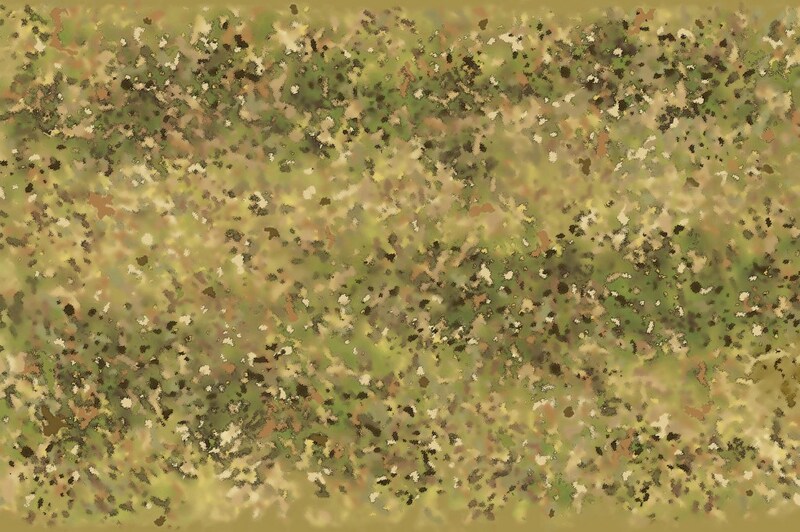 I also already have or can design camouflage suitable for nature photographers, scientists doing field research, naturalists, bird watching/wildlife hides, hunters, tents, bivouacs, paintball, airsoft, films, TV, fashion, computer games, and so on. Please feel free to contact me at daveclode@hotmail.com and I can send you full sized high resolution files of designs to inspect (no obligation), and discuss prices of existing and/or custom designs. In “The Book of Camouflage” (2013), author Tim Newark records an instance where: “Brandt and Schick’s tree camouflage patterns were tested… and were found to reduce casualties by 15%“. In these tests, only camouflage smocks or shirts were worn, and not trousers (trousers were plain feldgrau, with black boots), so that the reduction in the percentage of casualties for fully camouflaged soldiers could well be in the range of 20 – 25%. In other words if a hundred soldiers not wearing camouflage die in a battle, around 75 to 80 fully camouflaged soldiers in suitable camouflage would die in the same battle. For those who doubt the usefulness of camouflage, I suggest that you place yourself in harm’s way dressed like this… good luck! 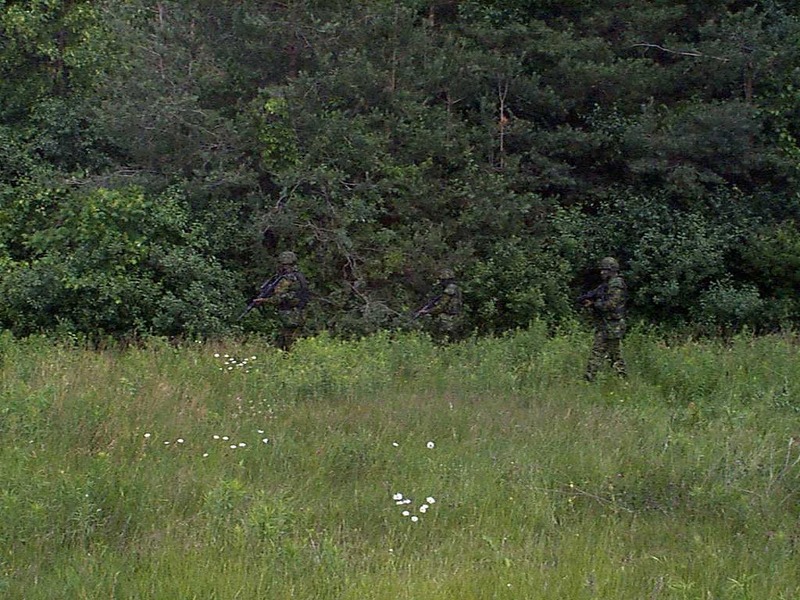 Or you can wear good camouflage, suited to the terrain (three soldiers in the photo). Cadpat Woodland. Photo: supplied by Allan Osment – angelfire.com/ma/cyberinferno/images/Cadpat3man.jpg. In some cases, it is best if you can be seen, such as hunters wearing orange, which ungulate animals can’t see, but reduces the chance of accidental shootings by other hunters. Bondcam Hunter Echo M1 Orange swatch. 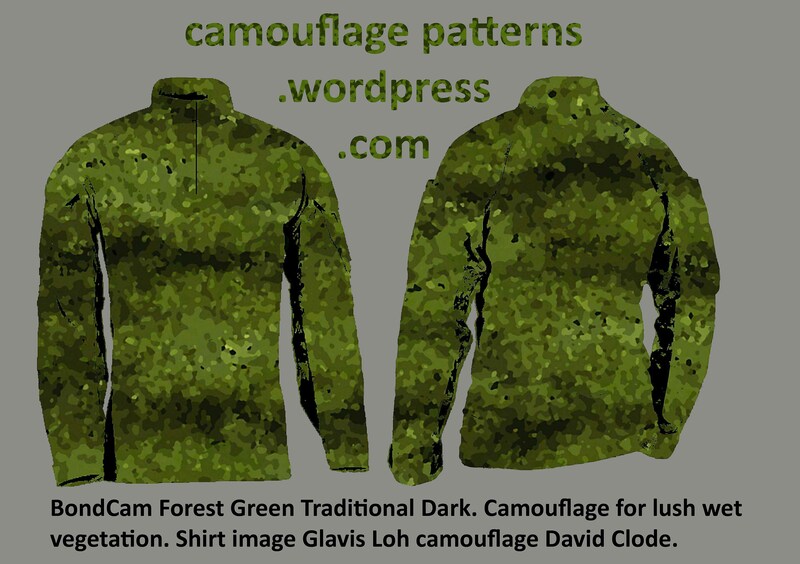 Camouflage pattern by David Clode. Camouflage test. BondCam Rocky Greener from a mere three metres/yards away. The A3 photocopy would be harder to spot if it had been cut into an oval shape to resemble the rocks, and the human body of course has curves. 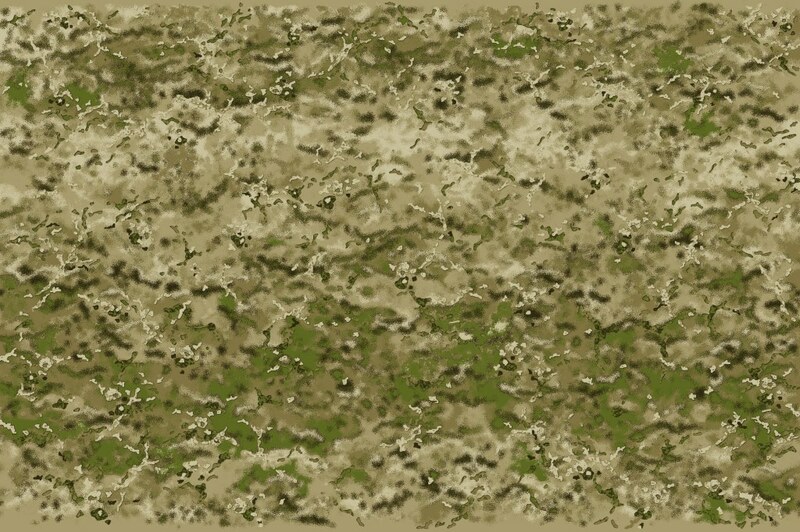 Someone dressed in this camouflage in this terrain would be difficult to see. Camouflage design by David Clode. BondCam Rocky Greener Contrasty. 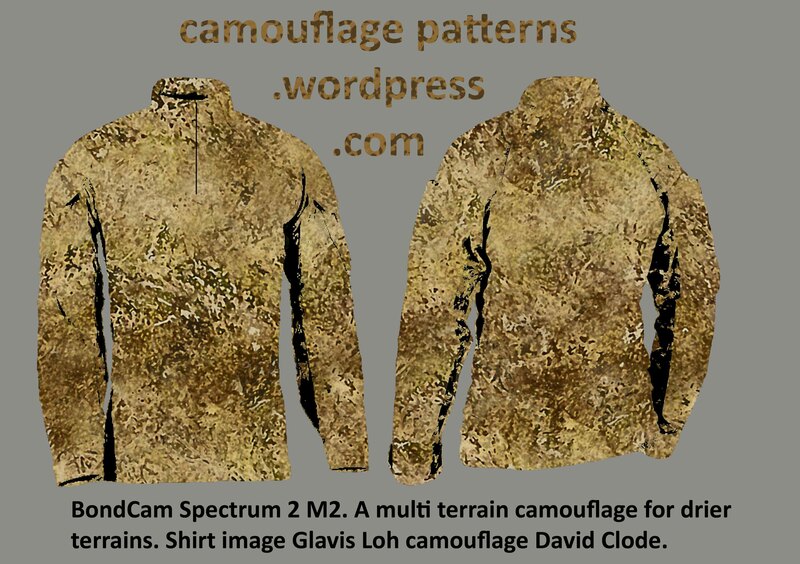 Camouflage design by David Clode, shirt simulation Glavis Loh. Bondcam Rocky Super Digital 7 swatch. David Clode. 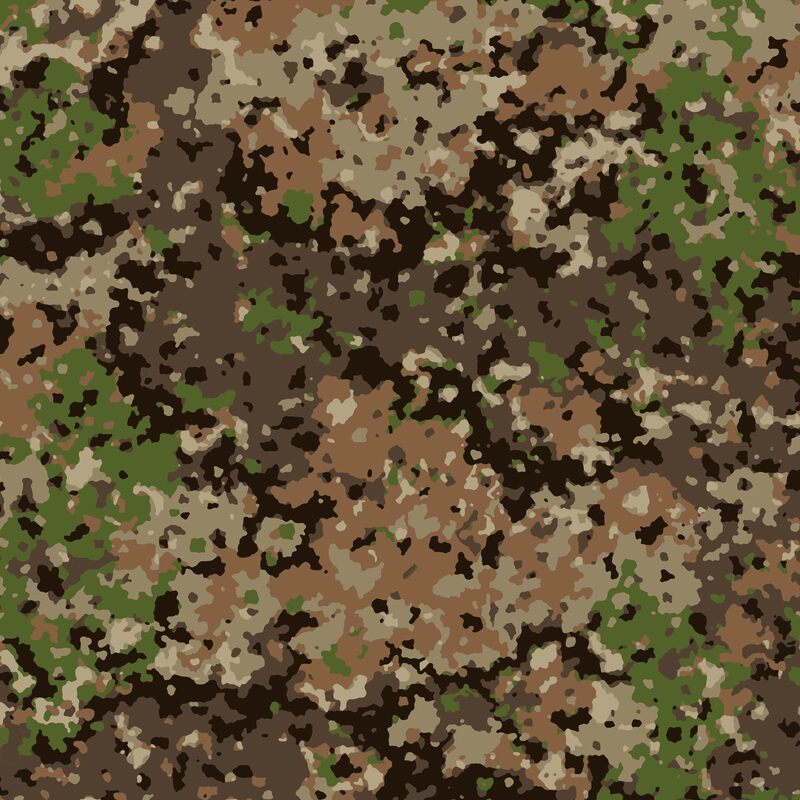 Hypothetically speaking, if country A (or organization A) is considering attacking country B, they may be less likely to do so if they know that the soldiers of country B have better camouflage than their own soldiers. 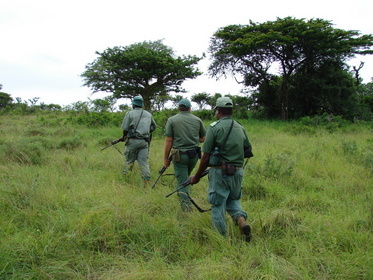 Similarly, from a poacher’s point of view, if there are two National Parks where they can poach, the poachers may be less likely to poach in a National Park where the anti-poaching patrols are wearing good camouflage, and more likely to poach where the patrols are wearing plain olive green, for example, and are easier to spot. 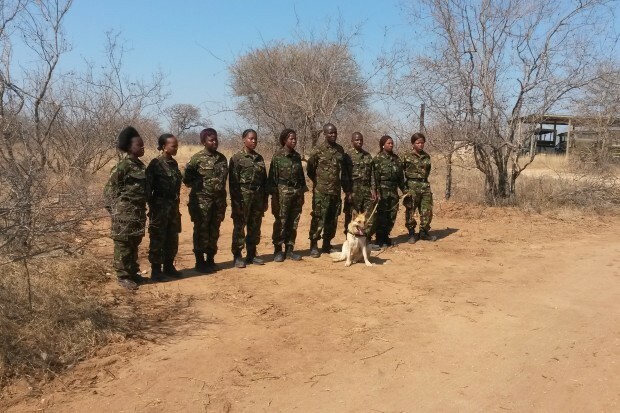 Black Mamba anti poaching unit, South Africa, consisting of very brave women. 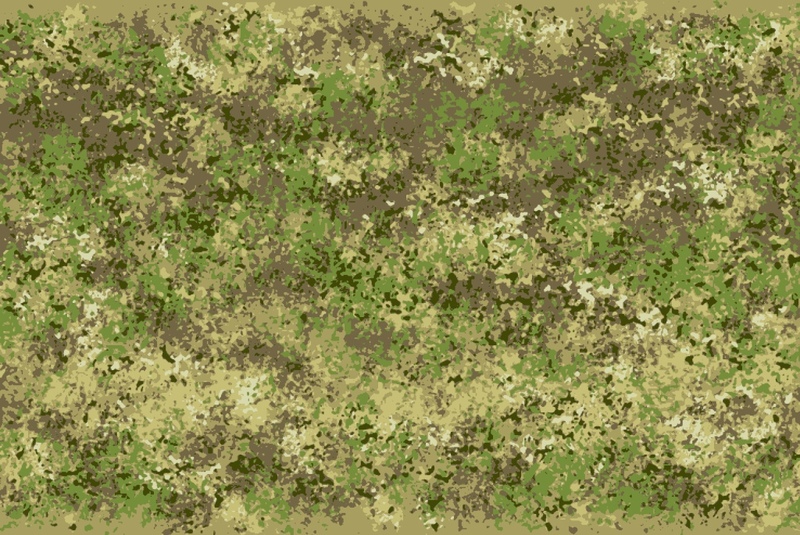 However, the woodland camouflage is too dark and too green (designed for cold temperate woodlands), especially in the dry season. 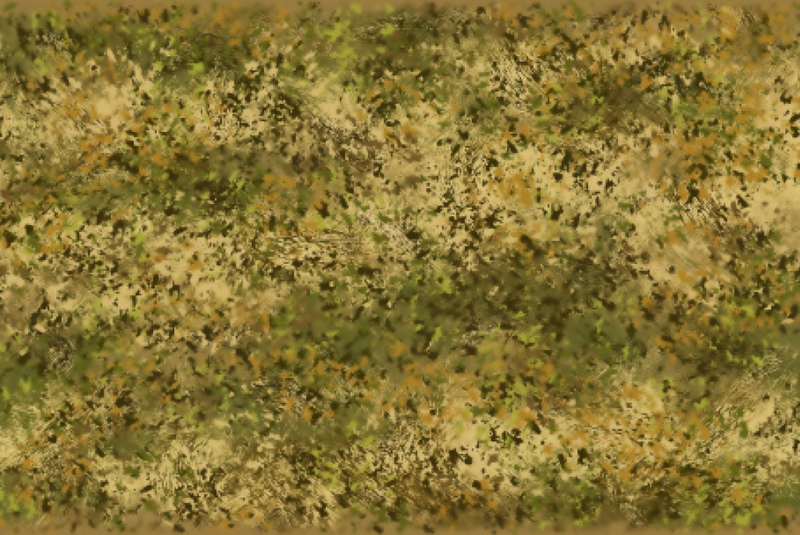 A camouflage based on the straw-coloured grass and the greyish brown branches would be much more effective. 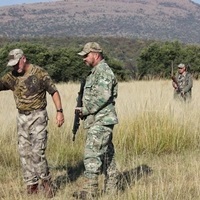 See the Anti-poaching camouflage page on this site. Photo: http://www.thedodo.com. I strive to produce high quality distinctively different original designs, (which helps to differentiate between friend and foe and contributes to esprit de corps) at prices which are highly competitive, compared to MultiCam, Hyperstealth, Kryptek, etc. I will also take into account the ability to pay, or lack thereof (conservation organizations for example). For organizations actively involved in anti-poaching, I am prepared to donate, free of charge, one design per organization (but not exclusive use) in addition to the purchase of one or more designs. 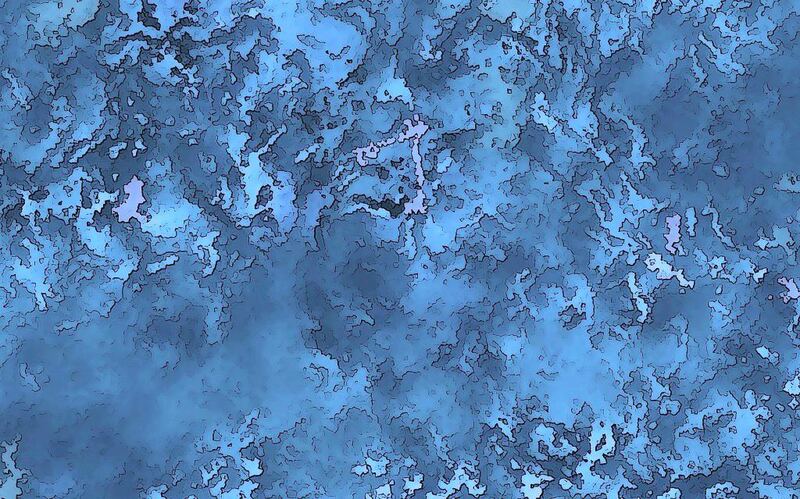 This would enable conservation organizations to have, for example, both a wet and dry season camouflage design, or designs for two different terrains/vegetation types, for the price of one. 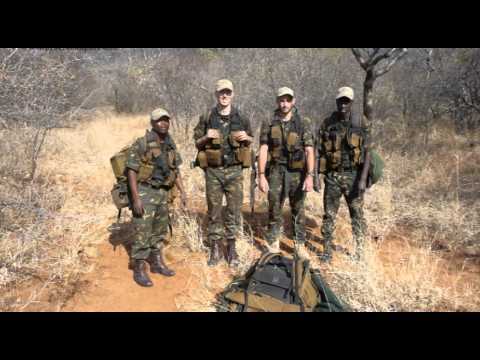 South African rangers on anti-poaching patrol, wet season. Olive green does not work that well, and bluish green is something to avoid. My design below would be better camouflage. Photo: South African National Parks Board. 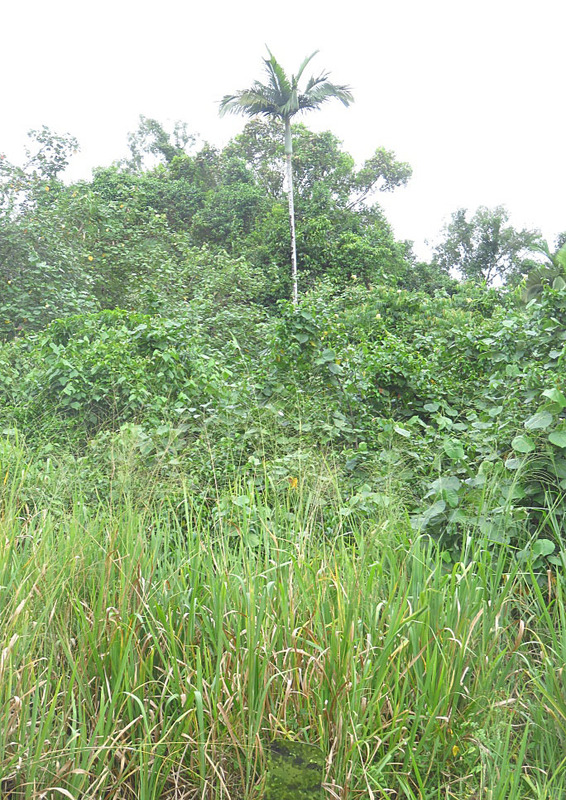 Bondcam Grassland Wet Season swatch. Camouflage: David Clode. In many cases I can improve a popular existing design (which may already be very good) and still retain the overall look and feel of the original, for less cost than providing a new and original design. 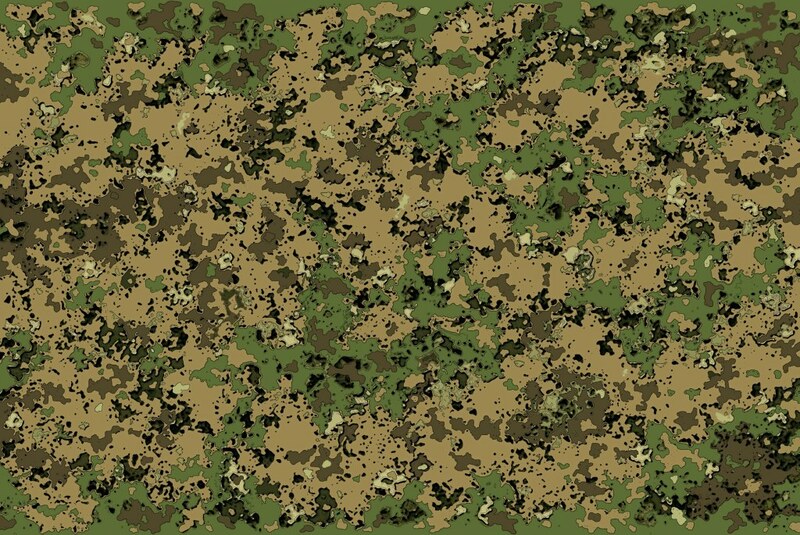 Some of my designs which, while different, should perform well as alternatives to existing, tried-and-proven camouflage patterns. Since they are different, in some terrains they may not be as good, but in other terrains, they may be equal and possibly better. In general, my designs have more disruption and more micro pattern. My designs are also much more affordable. BondCam Broad Spectrum 2 M2 Green. 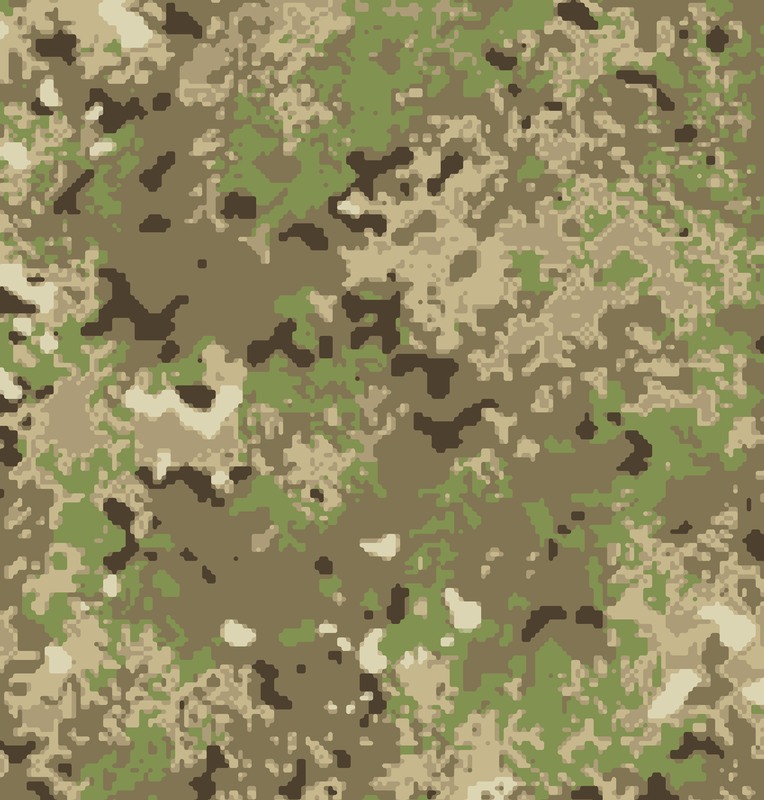 Compared to traditional plain olive green or olive drab, this design has disruption and a micro pattern, and would be much better in many grassland, grassy woodland, and woodland terrains than plain olive green. Scorpion W2, or OCP. Photo supplied by Allan Osment. Multicam TM. 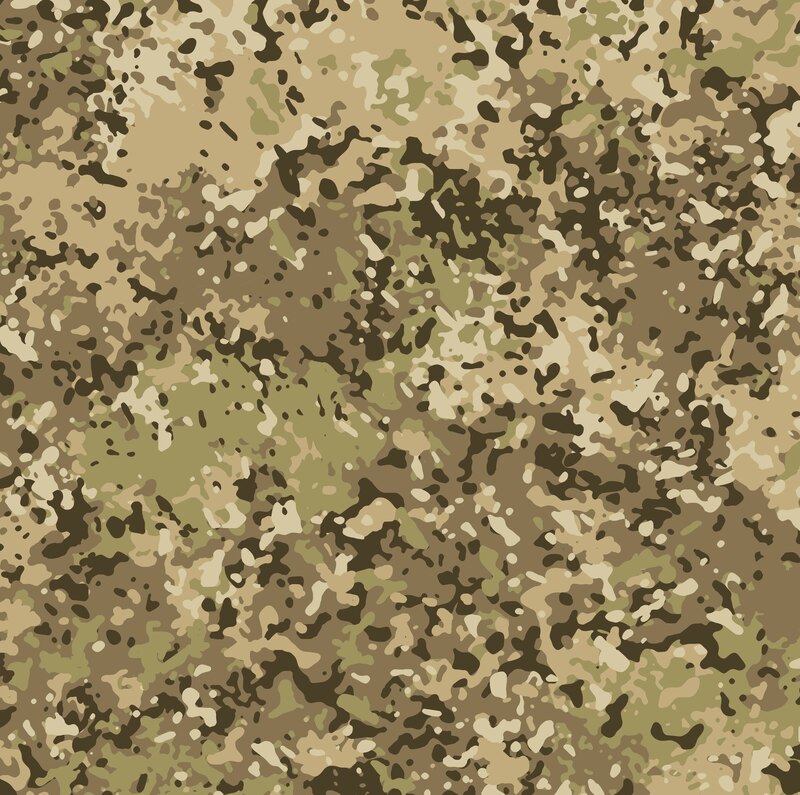 In my opinion, the best, tried-and-tested general purpose camouflage design for clothing in general use in the world today. Congratulations to the designer/s! Photo: C. Todd Lopez. United States Army. Wikimedia. MultiCam. Photo: Eric H. Larson, Camopedia.org. MultiCam on the left, Scorpion W2/OCP on the right. My designs generally have more micro pattern which means that they may work better at mid to close distances, and usually have a little more depth and disruption. 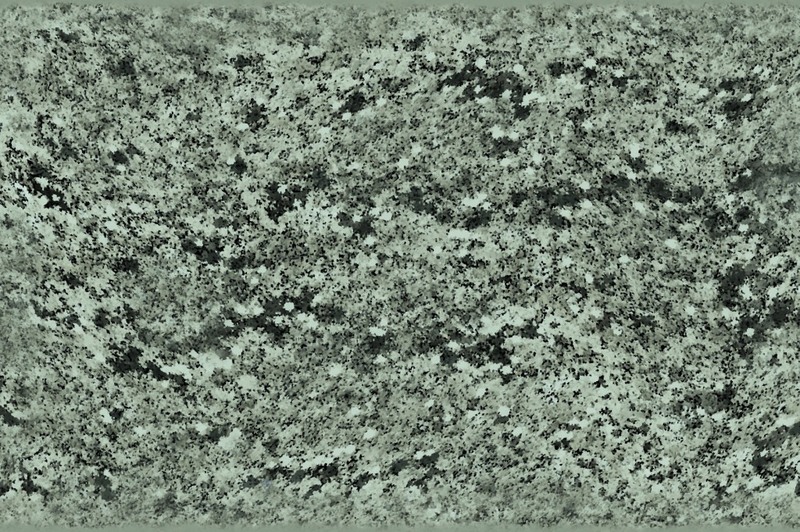 The very lightest and very darkest markings are also typically toned down a little so that they don’t stand out as much – good camouflage needs a compromise between having good optical illusion of depth and disruption, but at the same time, none of the elements should stand out too much, as this would make the camouflage easier to spot. The depth and disruption are good because they help to make it difficult to piece together a human shape, however, it may be even better if the camouflage is dull and boring without much in the way of contrasting features, so that it may not be noticed at all (avoid detection by ambient vision), or if it is noticed, it may be written off by the subconscious as not worth noticing. BondCam MTD 2 Dull 4. Camouflage David Clode. My designs are also larger (1 metre by 1.5 metres) and therefore have fewer repeats. Some of my designs may be best inkjet printed (rather than roller or screen printing) because of the details, and the wide range of colours and tones. Some are deliberately composed of very few colours to make traditional printing cheaper. BondCam MTD 2 (Multiple Terrain Design) Super Digital. Camouflage design by David clode. BondCam MTD 2 Super Digital swatch. Camouflage by David Clode. Broad Spectrum M1. Probably as good as British MTP. For mid to wet terrains and cold climate urban terrains. 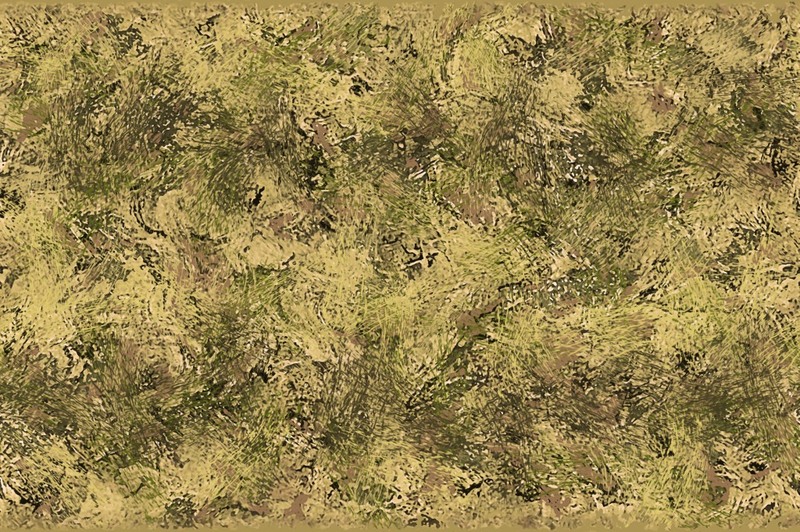 Multi-terrain camouflage design by David Clode. Bondcam Broad Spectrum. For mid to drier natural and urban terrains. Camouflage design by David Clode. BondCam Spectrum 1 M1 Blurry 2 Dull Lighter. Camouflage design: David Clode. MultiCam has a light and dark greenish, as well as a red/pink/brownish appearance, which is good since green and red or reddish/pinkish brown mix optically at a distance to appear as a greyish brown. The design above has a significant amount of beige, which is also good because it is a common colour in nature, and is usually present to some degree in a wide range of terrains, from desert through to rain forest and urban terrains. BondCam OmniTerrain M3. An alternative to MultiCam and Scorpion W2. Camouflage design by David Clode. BondCam OmniTerrain M3. Camouflage design by David Clode, render Glavis Loh. BondCam MTC Fivecol Light Dull. Camouflage David Clode. 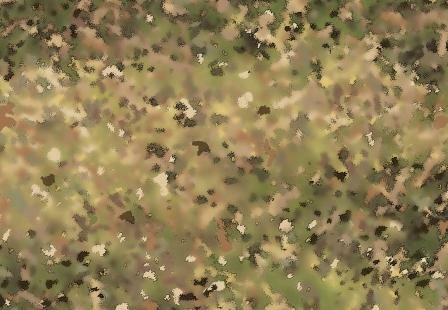 BondCam MTC Fivecol Dull M3 (MTC = Multiple Terrain Camouflage). David Clode. The design above has broad disruptive bands, blurring, and a micro pattern which resembles lichen, which is common in multiple terrains. BondCam MesoCam. Meso means mid or middle and is used in botany and ecology, e.g. a mesic habitat is not very wet or dry, and mesophyll is a middle sized leaf. It is pronounced “Meezo”, from the Greek mesos. There are also wet and dry versions available (see the pages “Forests and Woodland” and “Mediterranean and Semi-arid”). The “contour map” look increases the illusion of depth, and makes the camouflage easy to distinguish from other. The modification below is possibly better. BondCam MesoCam 3. Camouflage design by David Clode, render Glavis Loh. BondCam Game Warden S Light Olive. Camouflage David Clode. BondCam Game Warden S Light Olive M1 Digital. 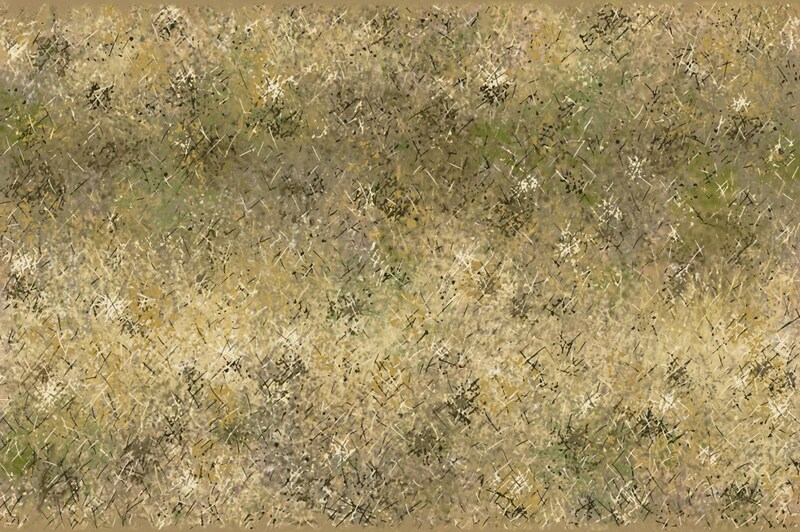 Camouflage design by David Clode, converted to digital by Glavis Loh. There are also BondCam alternatives to MultiCam Arid and MultiCam Tropic. Bondcam Frontline M6 Super Digital. David Clode. Swatch of BondCam Frontline M6 Super Digital. Camouflage design by David Clode. BondCam Multi Terrain Five Col Super Digital. David Clode. 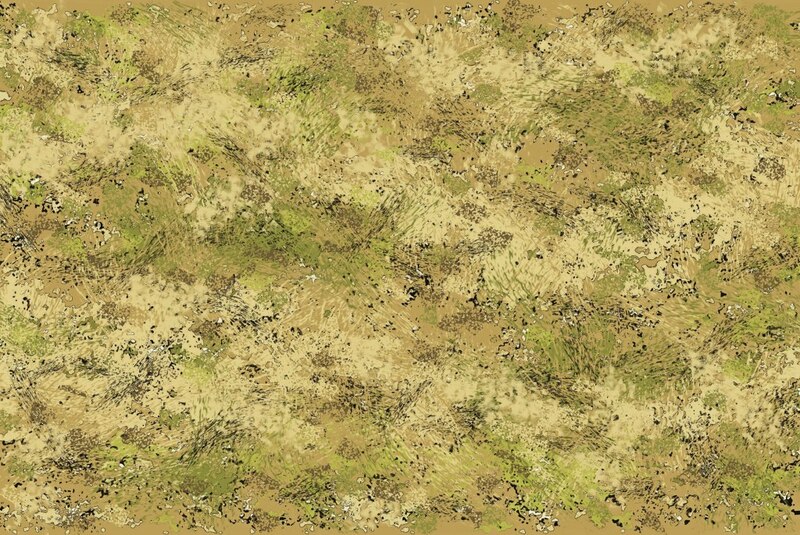 Swatch of Multi Terrain Five Col Super Digital. David Clode. 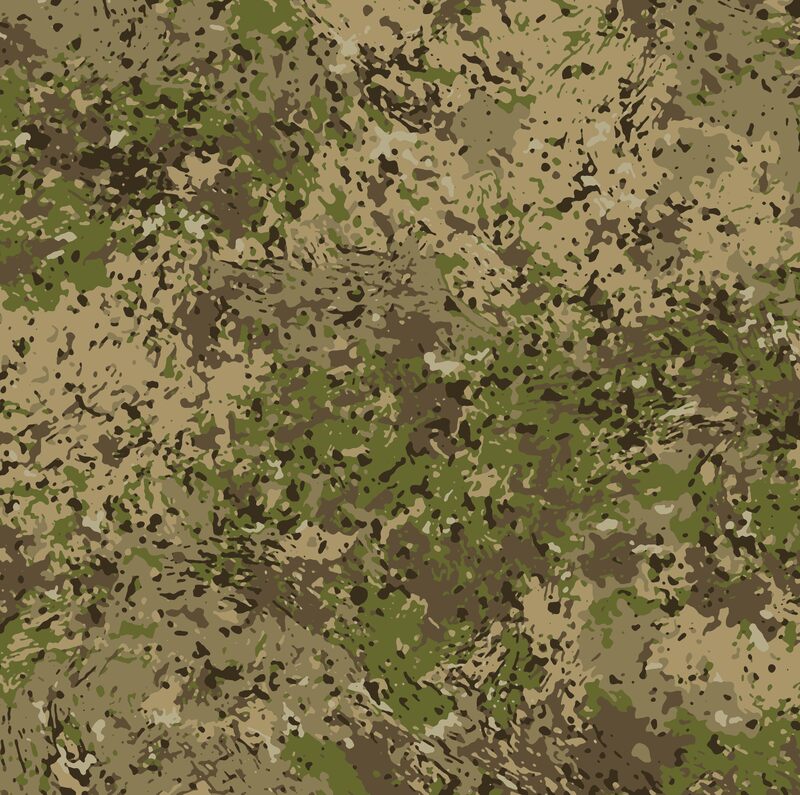 See the multi-terrain camouflage page for more multi-terain camouflage patterns. The former British desert camouflage design was the best desert design in Natick tests. The design below should work well in deserts, semi-arid terrains, as well as dry grassland and grassy woodlands. Colours and tones can be adjusted to suit. 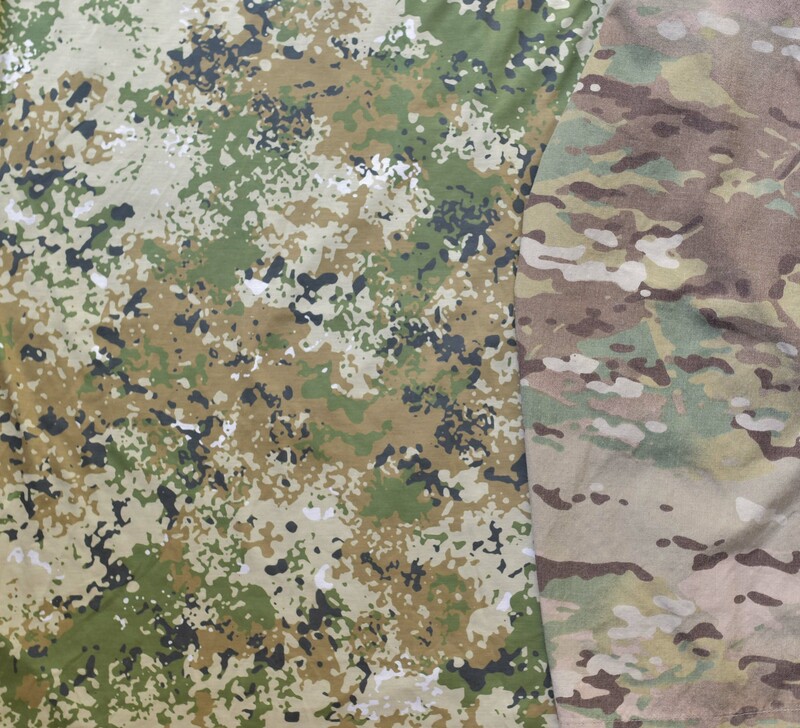 Commander Desert M2 S. This three colour design (fewer colours make the fabric cheaper to produce by conventional printing methods) is an analogue design, but should be roughly equivalent in performance to the excellent Desert MARPAT and CADPAT AR digital designs. 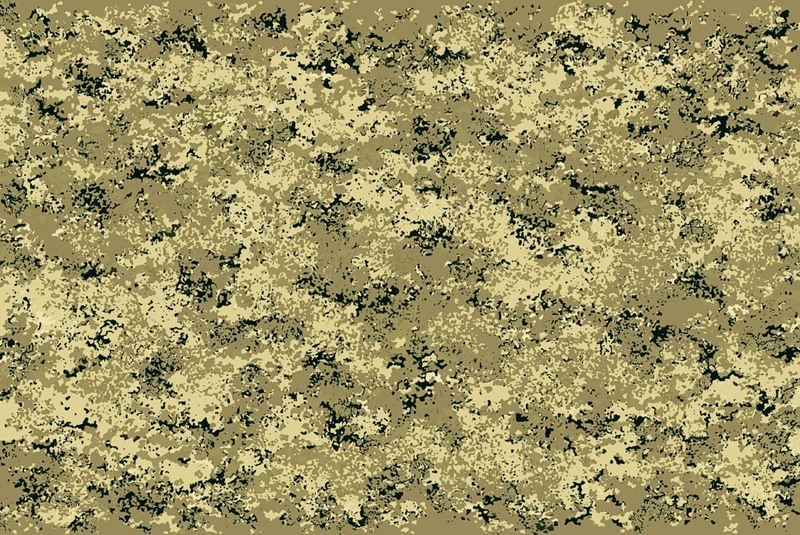 In Natick tests, the analogue two colour British desert camouflage proved to be the best desert design. It is probable that my design would be as good as any of these, and even possible that my design may be better than all three. Camouflage design by David Clode. 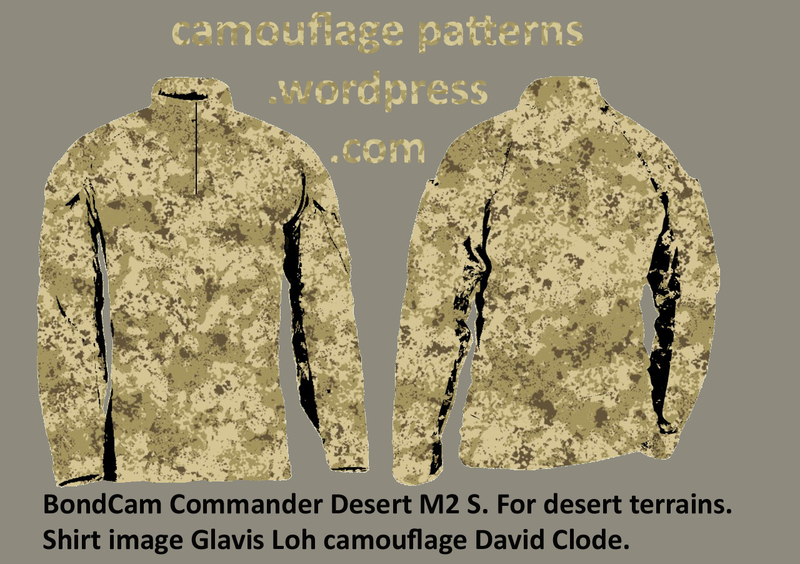 BondCam Commander Desert M2 S. Camouflage David Clode. 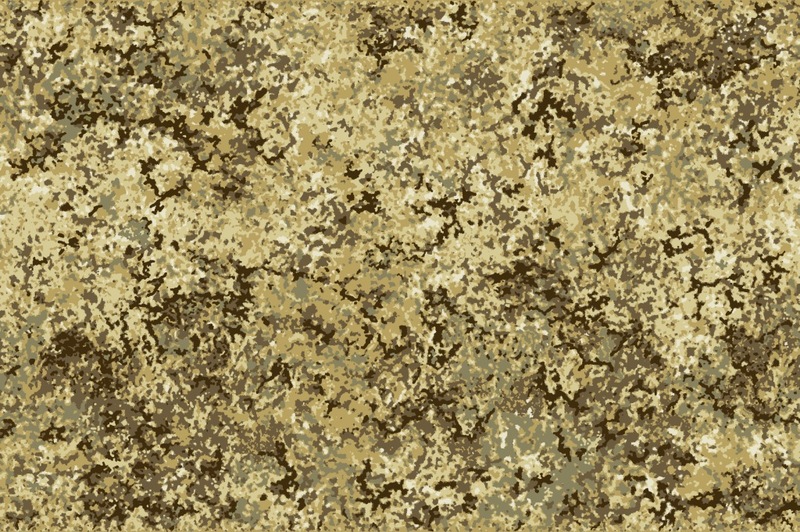 Defender M3 desert swatch (about 50cm x 50cm). Camouflage design by David Clode. BondCam Woodland Plus M1 Dry 3 Light. BondCam Woodland Plus M1 Dry 3. For deserts, semi-arid and dry grassy woodland terrains. Camouflage David Clode, render Glavis Loh. BondCam Temperate Dry Grassy Woodland M2 Super Digital. For rocky and stoney deserts, semi-arid and dry grassy woodland terrains. David Clode. Once again, the designs are different to A-TACS AU, and therefore may be better or worse depending on the terrain. BondCam Urban 10 Crystaline. Camouflage design by David Clode. BondCam Arid 2 Crystaline Blurred Urban. Camouflage by David Clode. Not as “busy” as A-TACS, and therefore possibly better in the majority of urban terrains (A-TACS is especially good in terrains with plenty of rubble, but perhaps not as good in relatively featureless urban terrain). Same for the design below. BondCam Urban Traditional. 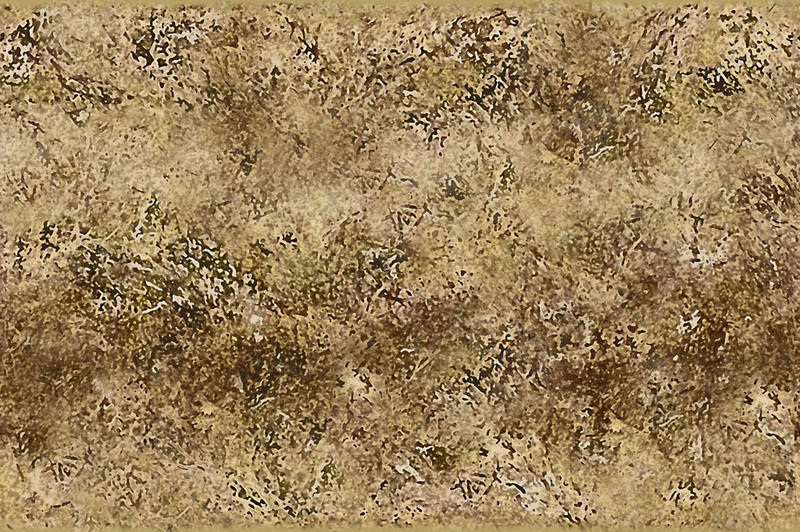 Two more versions available, see the “Desert and Urban Camouflage” page. BondCam Urban Traditional M2. Camouflage David Clode, render Glavis loh. BondCam Multi Ops Urban. Colours and tones can be adjusted as needed. BondCam MTD Urban Horizontal. Camouflage design by David Clode. BondCam MTD Semi-arid. Camouflage David Clode. The curvy, “amoeba” edges should be better than A-Tacs FG against a backdrop of tree leaves or in the midst of tree leaves. I can modify colours and tones to suit specific vegetation. The design above should work very well for conserving mountain gorillas in the Virunga National Park. BondCam Forest Green Dark works reasonably well even among foliage of a completely different texture and colour. Camouflage David Clode. BondCam Forest green Traditional dark. Camouflage David Clode, render Glavis Loh. Camouflage test. 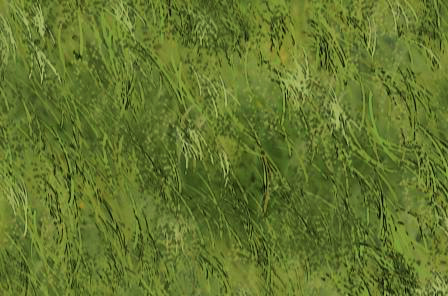 A3 colour print of a portion of Forest Green Dark against long tropical grass (Guinea grass Megathyrsus maximus, prev. Panicum maximum). Rain forest 2 M1 S Super Digital 2 on the edge of a tropical forest. Photo, desin and test: David Clode. BondCam Temperate Grassland M2 Super Digital. For grasslands, grassy woodlands, and rural terrains. Camouflage by David Clode. 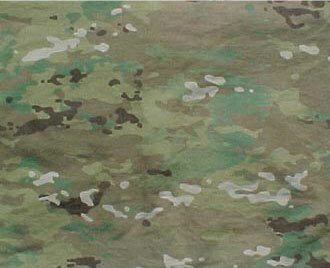 BondCam Defender M3 Greener for mid to wet terrains, with MultiCam. A possible alternative to PenCott Greenzone. BondCam Brown Green Traditional M5. BondCam Woodland Plus Light 2. It may come as a surprise, but Italian Vegetato camouflage is a digital design, since it is based on fractals and computer generated (see the excellent article on digital camouflage at the Strike-hold.net web site). In my view, it is greatly under-rated, with the rounder pattern (compared to the pixelated square/rectangular look of most digital designs) much more natural looking and therefore more likely to be effective in a wider range of terrains. My design below is quite different since it is more a product of human creativity. It could be as effective as Vegetato, (or I may be able to modify it until it is) in many woodland terrains, and some grassland terrains. BondCam Multi Ops Mid Blurred Dull. Italian Vegetato (Special Forces). Photo: Eric H. Larson, Camopedia.org. 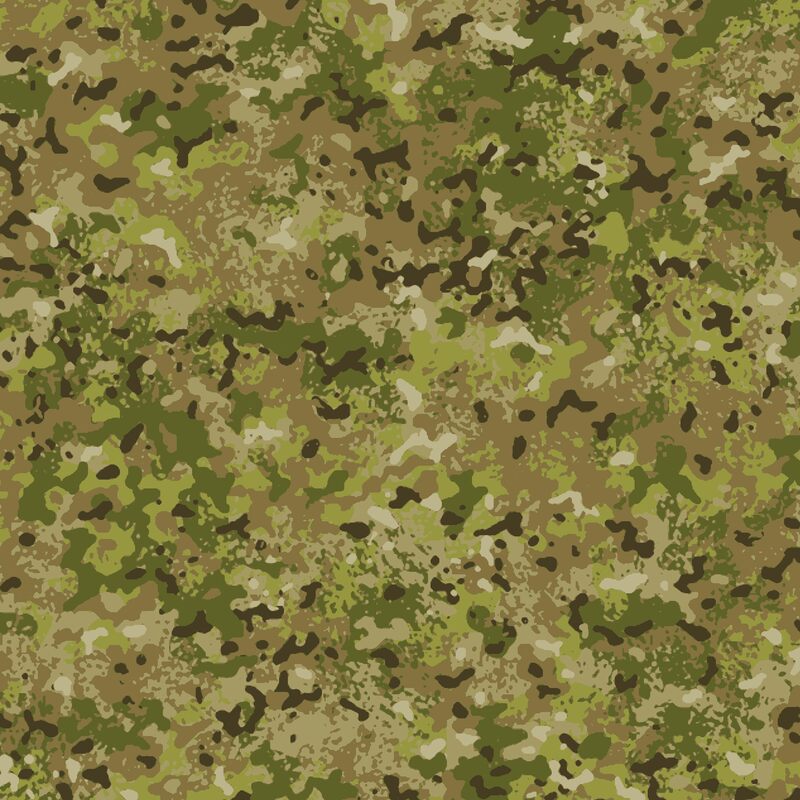 In many cases my camouflage designs for uniforms are intended to be direct-to-garment printed (inkjet printed, like a colour photocopy on paper, but on cloth/fabric instead, or by dye sublimation). The designs could also be printed onto fabric and then made into uniforms. Alternatively, the designs could be conventionally printed on approximately 1.5 metres (similar measurements in yards and/or feet will also work) wide fabric by approximately 1 metre repeating (for clothing/uniforms, cutting pattern “Simplicity” # 4760, or similar) and made into uniforms. For this method, I may have to simplify designs. Inkjet printing of fabric, or direct-to-garment printing, also have the advantage of short runs (the ability to produce small amounts). 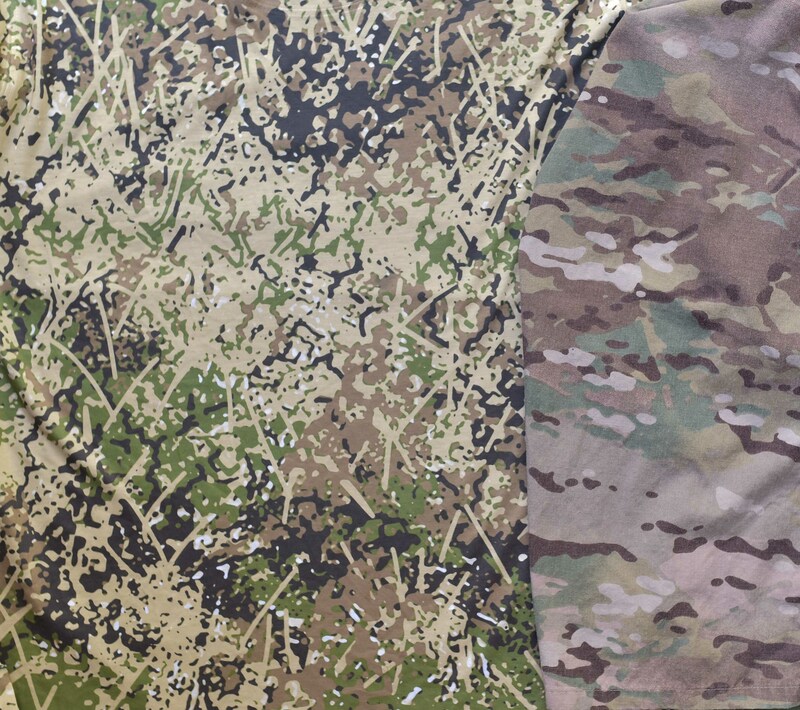 Direct-to-garment printing makes it possible to print a camouflage design directly on to already made garments, in the numbers needed (perhaps only small numbers will be needed for special forces on a special operation, for example. 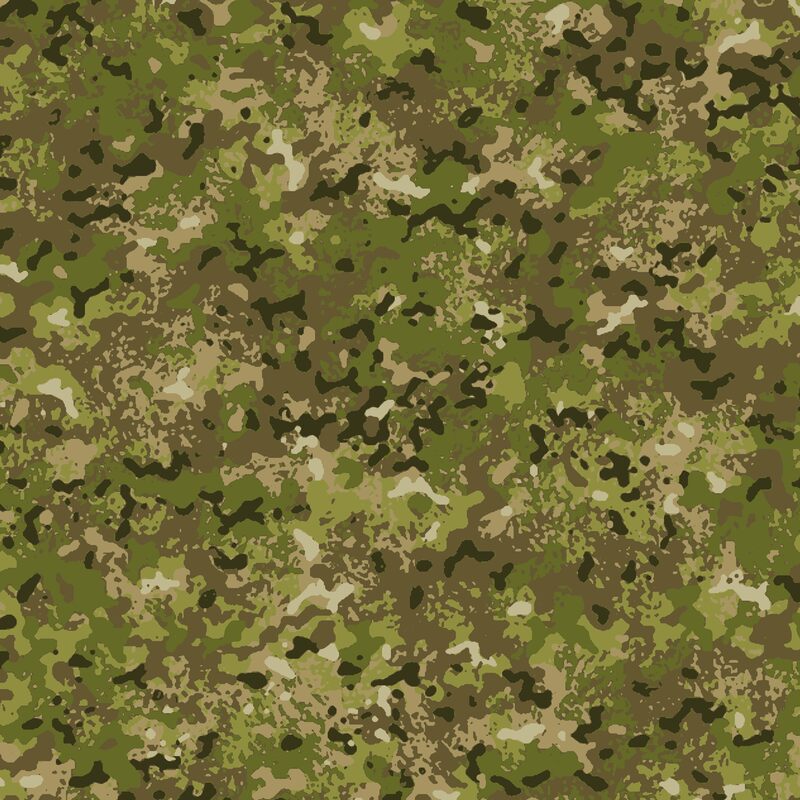 or for testing camouflage designs), and may well become the standard way of producing camouflage uniforms/clothing in the future. While the technology is relatively recent, it may well replace conventional printing and uniform manufacturing methods, in much the same way as digital photography has now superseded film photography. 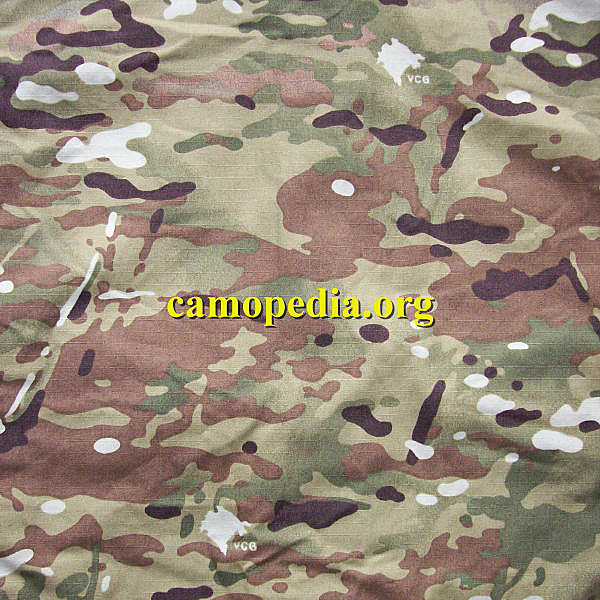 Direct-to-garment printing may also make it possible to print a darker portion of the camouflage design across the shoulders, thus making use of the camouflage principle of counter shading (which to date has not been possible). For more on inkjet printing and direct-to-garment printing as it could apply to the military: https://www.theregister.co.uk/Print/2011/06/27/photo_camo/ also Xenia.com, knowledgehub, inkjet blog, 2011. There are numerous print-on-demand companies that can print a pattern (on at least Polo shirts), and we can expect the technology to improve over the coming years. Just a few companies that can do direct to-to-garment, all-over-printing of shirts include Bags of Love (Contrado) in the UK (they have made excellent T-shirts for me for testing camouflage designs, and fabric samples), Spreadshirt, Society 6, OArTee.com, and Zazzle.com. Most will ship anywhere. 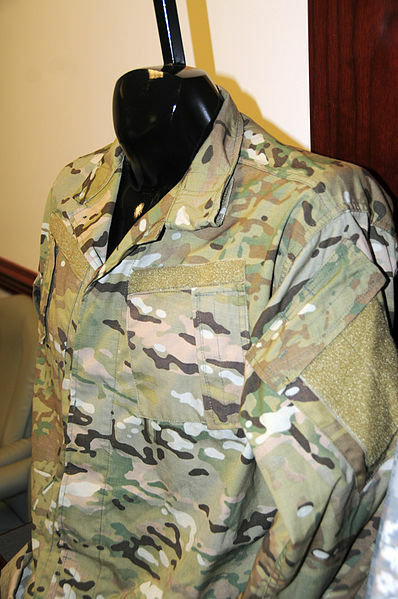 The company Hyperstealth offers some of its camouflage designs from inkjet printed fabric which is then made into uniforms. Spoonflower.com can inkjet print custom designs onto fabric (which can then be made in to uniforms – or ponchos just for testing designs). Bondcam Brown Urban M2 Digital swatch (close up of a larger design showing details). An urban and desert design by David Clode. 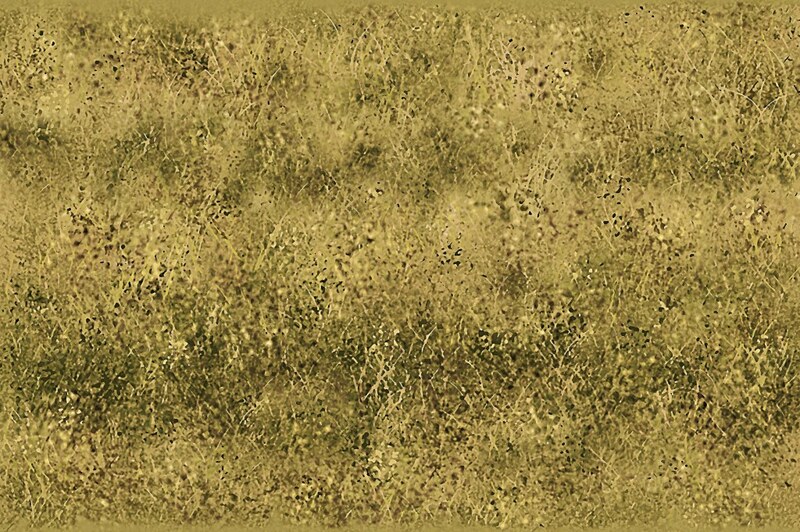 Please see the page Testing Camouflage for more. 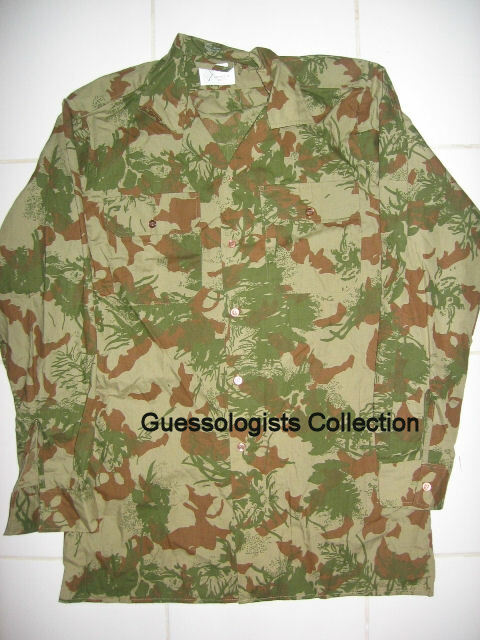 To inexpensively test the effectiveness of new camouflage designs, a few uniforms, or even just long sleeve T-shirts or Polo shirts (or rough cut ponchos from a length of cloth), could be direct-to-garment printed, and compared to uniforms/T-shirts/Polo shirts of the camouflage presently in use, in field tests in the relevant terrain/s. An even cheaper test is to make colour photocopies of a swatch that is to scale (the design images on this site are 1 metre by 1.5 metres), preferably A3 size or larger, glue them onto card, and place them in the relevant terrain (thanks to Allan Osment for this idea). A & O Woodland on the right, and a semi arid design on the left. The woodland design is highly effective. 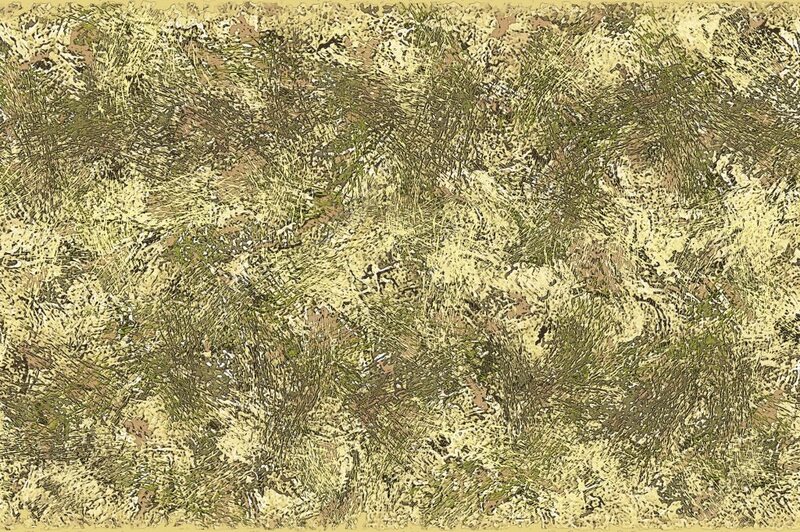 Camouflage designs and test by Allan Osment. 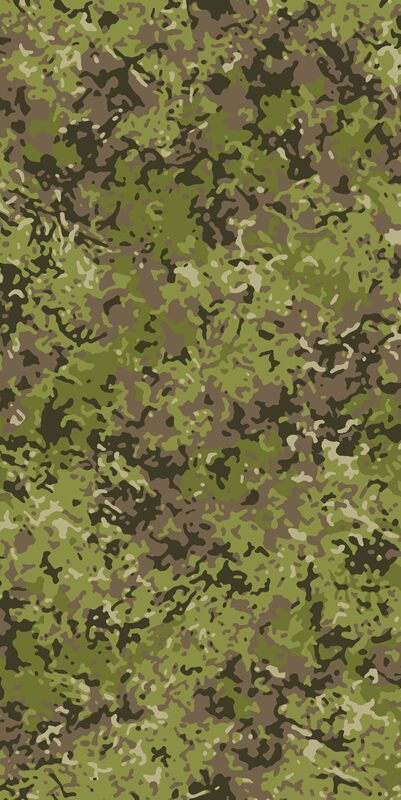 I (or perhaps you) can then make adjustments to fine tune colours/tones/contrast/pattern etc., to improve the camouflage design if needed, before the expense of production of clothing on a larger scale is incurred. Many of my camouflage designs are omni-directional, but some have a correct orientation, and may still work but not work as well if they are upside down or sideways. Most could be modified to provide a digital/pixelated look, if desired. My hope is that my camouflage designs will provide a qualitative edge for good men and good women in their brave work, firstly to help improve their survivability (by decreasing the probability of being detected, and so reduce the chance of injuries and casualties), and secondly to help them to be more effective in their work (and maybe even look good while they’re doing it!). 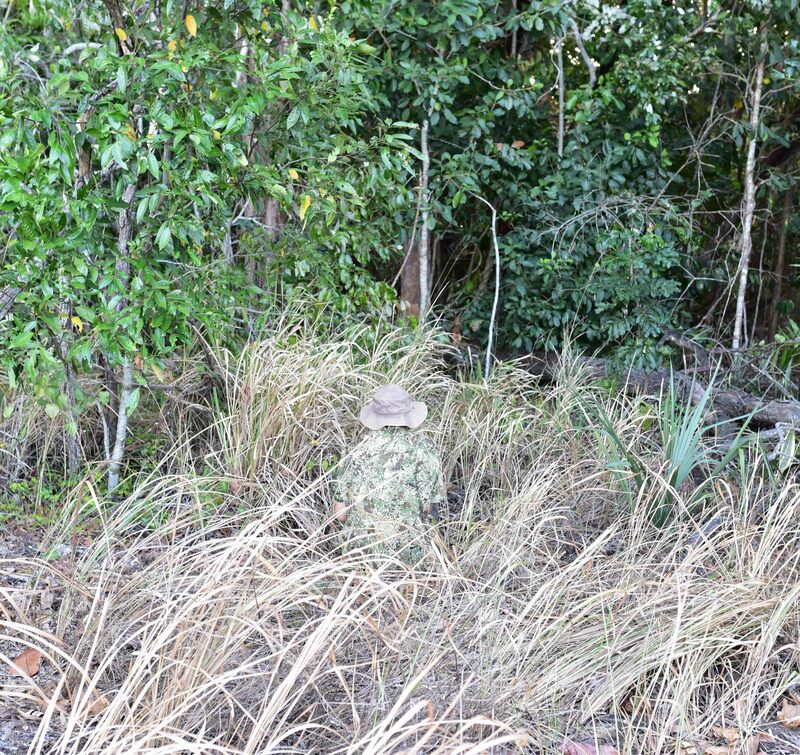 I have the utmost admiration and respect for defence force personnel and anti-poaching rangers, and believe that they should have the very best camouflage available! Bondcam Navy Diver Tropical Deep swatch. Camouflage: David Clode. See the “Terrains” page. My aim is to design camouflage that actually works, rather than a fashion statement, but it does no harm if it happens to look good as well. This can be important as it helps to raise morale (see the photo of Montenegrin soldiers near the top of the page). 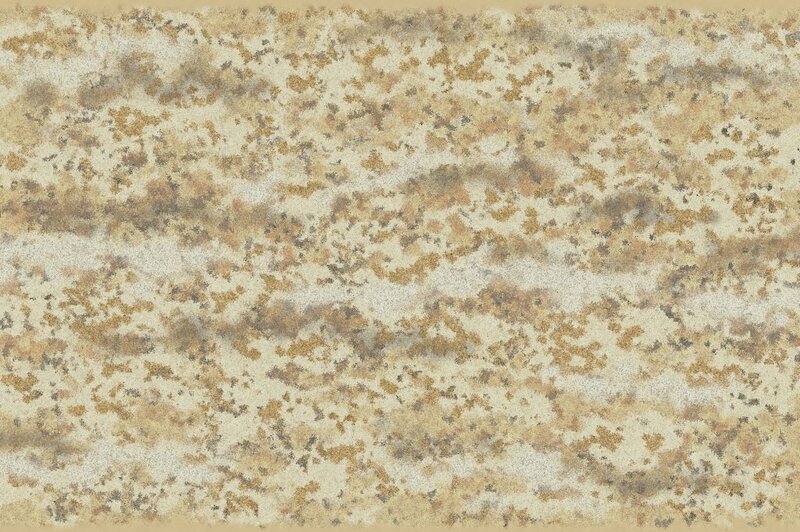 For example, US “Chocolate Chip” camouflage was changed to US Three Color Desert partly to boost morale: “…one of the official reasons for the change was that it had an improved ‘psychological effect and is a morale booster’. ” (Newark 2013). Another advantage of camouflage that looks good is that it can help to project an image of authority and toughness. Cool looking camouflage could also help with recruitment, which tends to be lagging in recent times in many Western countries, as the idea of serving one’s country as a duty or honour has less appeal with many younger people today. Defence Forces may also have a need for camouflage uniforms which look good for public parades. 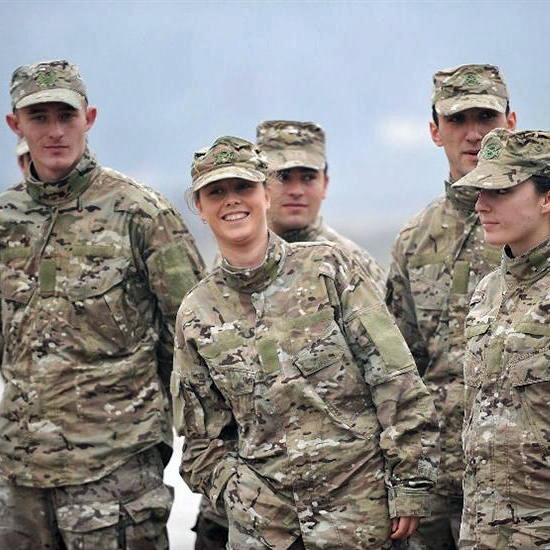 Last but not least, wearing a good looking camouflage uniform improves the “prospects” of men and women who are otherwise not that good looking. 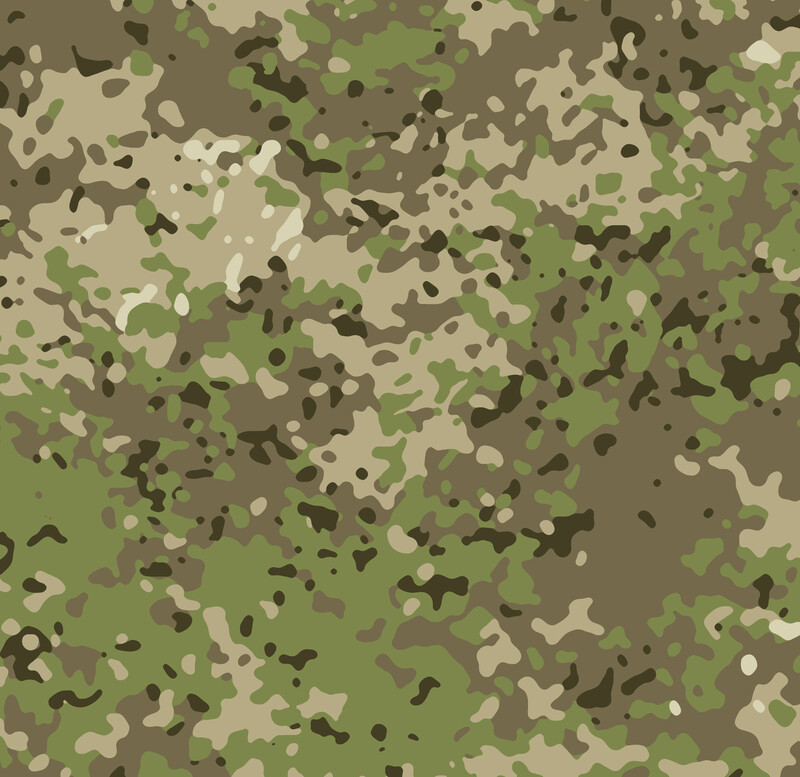 I have some camouflage designs which are deliberately more colourful and contrasty, which I call fashion camouflage, and intended to look good (but which may be less effective as camouflage – camouflage generally works better if it is not overly colourful and contrasty). BondCam OmniTerrain M4 Blurred. 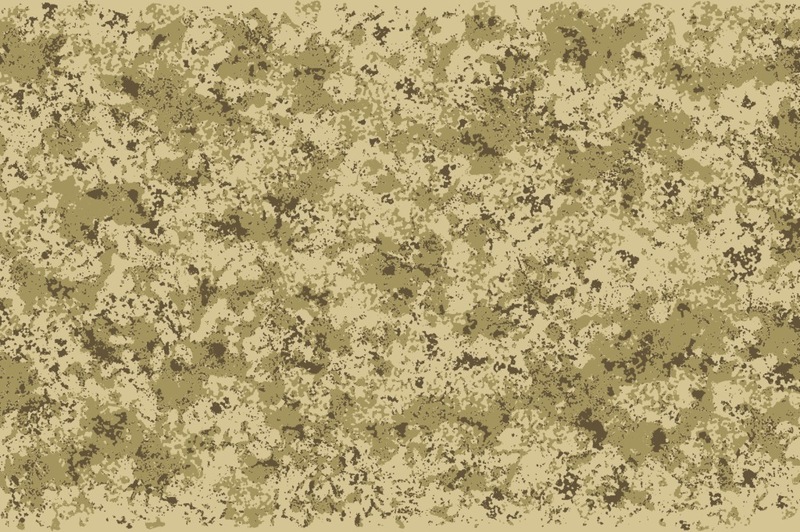 Camo Design by David Clode. Some of these may be good as military dress uniforms for public show, some may be suitable for street fashion, and some could look good in war or science fiction movies, TV, or computer games. 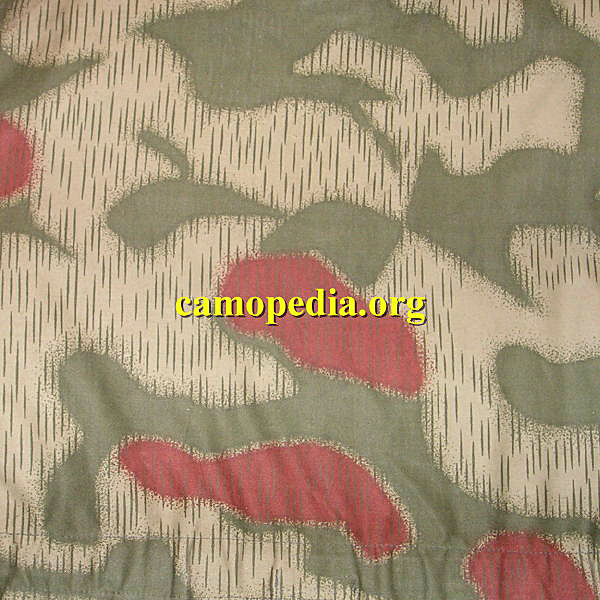 See the page “Fashion Camouflage” (click on the button on the menu bar at the top of this page). 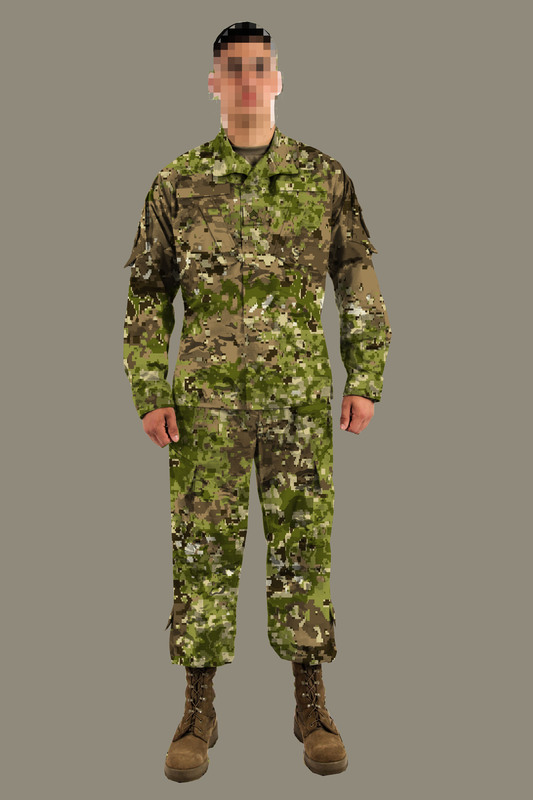 More colourful and contrasty camouflage uniforms can still work well if some of the local dust or moist soil is patted onto (or rubbed into) them, to match the local terrain, and to tone them down. 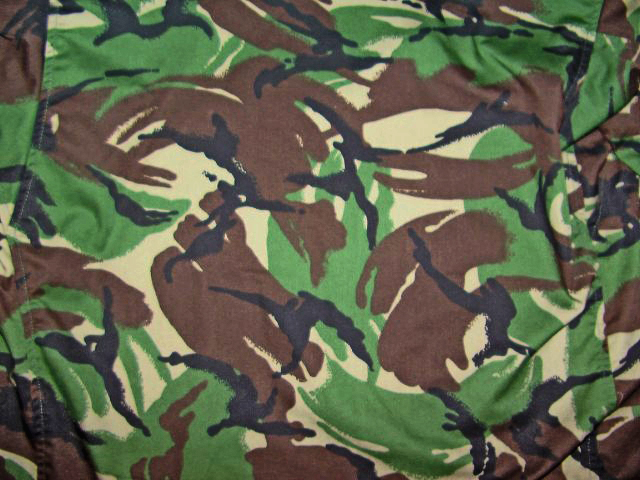 BondCam Digital Drab Camouflage M1. 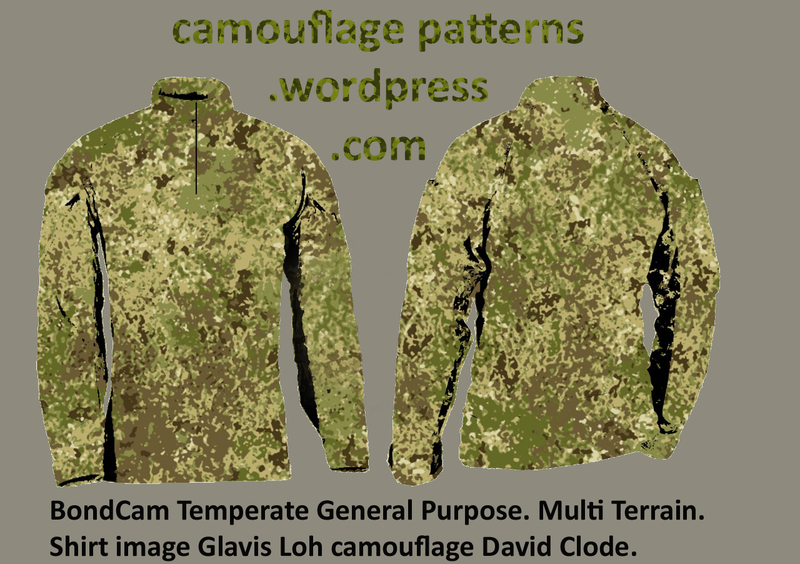 Fashion Camouflage pattern by David Clode. Bondcam Fall Forest swatch. Fashion camouflage. Note that for hunting camouflage designs, deer and other ungulates do not see red and orange, but other hunters do (so there is less chance of being shot by accident). BondCam MTD Huey M2. Camouflage David Clode. BondCam Brown Urban M2 Digital. Camouflage David Clode, render Glavis Loh. Defence forces of democratic countries and conservation organizations are invited to contact me to inspect designs (full sized files of full sized designs). Of course, once a buyer claims exclusive use of a particular design or designs, those designs will no longer be available to others… please excuse the pun, but… first in, best dressed! 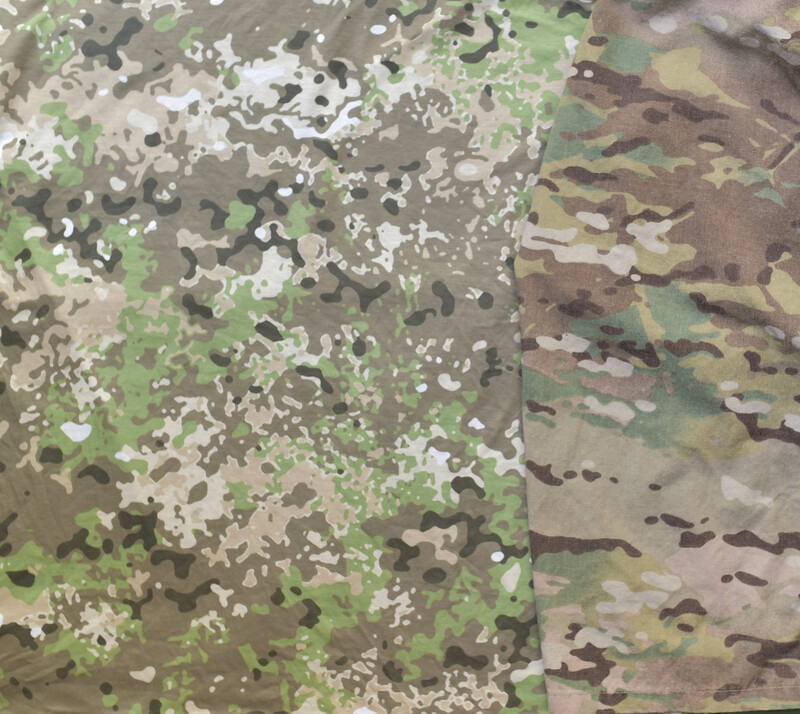 The trend in military camouflage has been towards one-size-fits-all multiple terrain patterns, such as MultiCam and UCP. 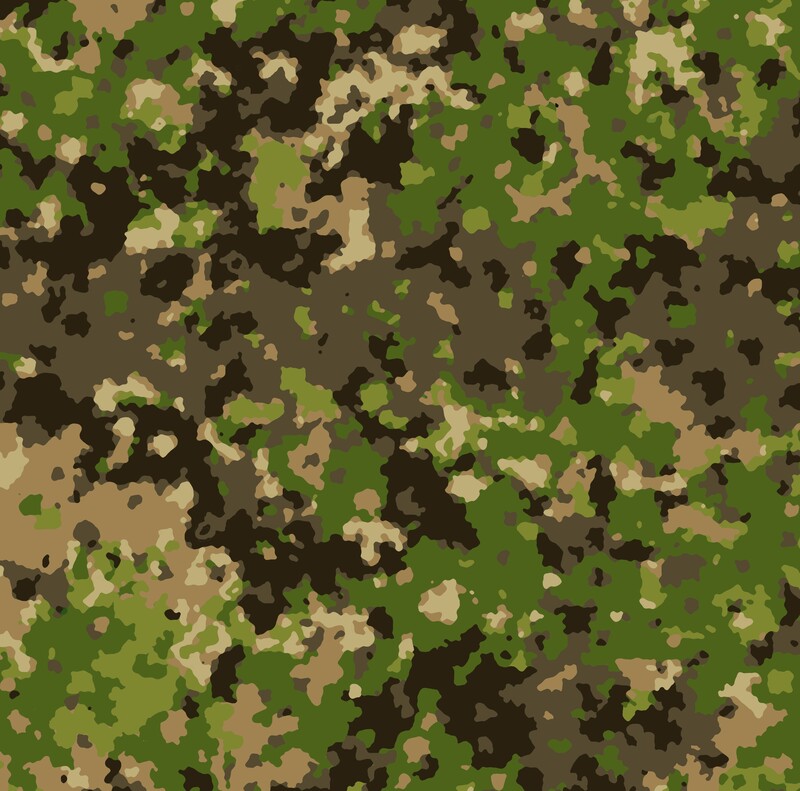 While this makes economic and logistic sense, I believe that it is unrealistic to expect a camouflage design to work well in all terrains, from light deserts to dark rain forests, and night operations (see the page “Camouflage and Terrains” for examples of light deserts and dark rain forests). In my opinion, a better policy would be to have a design which works well in multiple terrains that are arid to mid wet, another design for mid wet to very wet terrains (at least two designs), and another for night operations. Alternatively, some of these problems could be at least partially solved by reversible shirts/jackets, and NIR treatment of fabric. It seems to me that the Canadians are leading the way in this (with NIR, and two patterns, the wet, mostly green, CADPAT Woodland, and the lighter and drier looking CADPAT Arid). 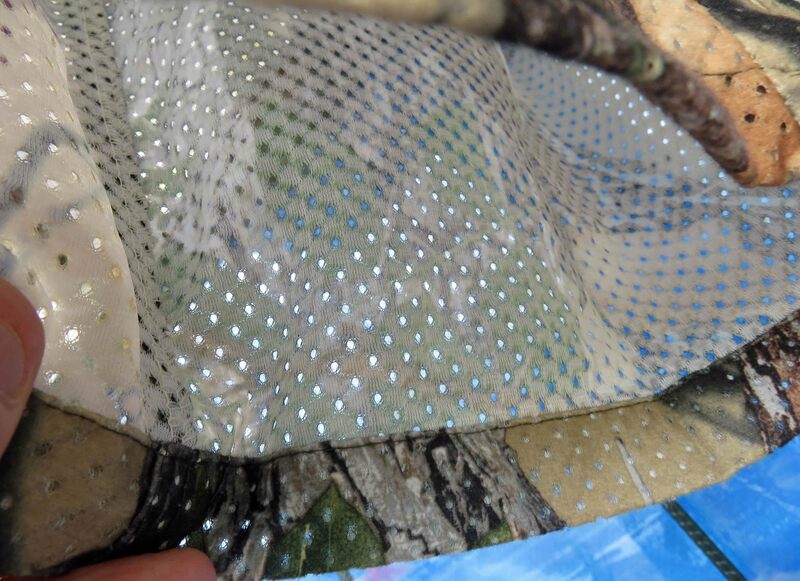 High tech camouflage of some description may become available in the future, but there are likely to be initial glitches which need to be ironed out (not another pun!… but there is so much material to work with! 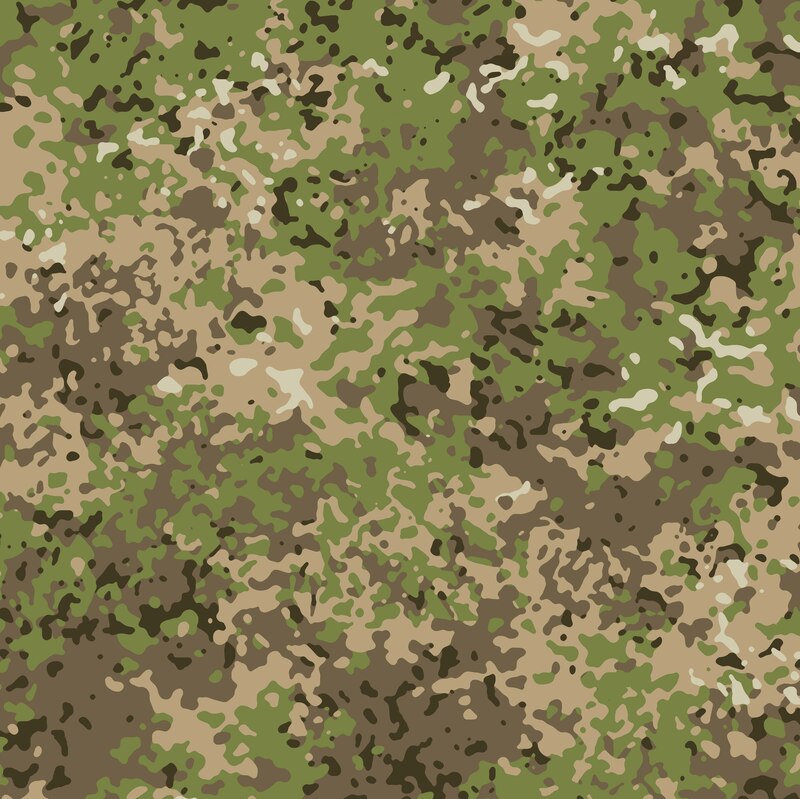 ), and high tech camouflage is unlikely to be cheap enough to clothe large numbers of personnel. Therefore, it is probable that print on demand, direct-to-garment inkjet printing, plus perhaps double sided two pattern mesh uniforms (like the Israeli Mitz’nefet, or what Ridgeline calls “air flow”, or what is known as port hole mesh fabric in North America) in some situations (or reversible jackets/shirts), are likely to be the most cost-effective way to go in the short to medium term future. For more on port hole mesh over garments and Mitz’nefets, visit vonstuckcamouflage.free.fr. Close up of port hole/airflow/Mitz’nefet mesh material (looking up through the inside of a pant leg). It could have been printed on the other side with a different camouflage as well (or the white could be for snow). 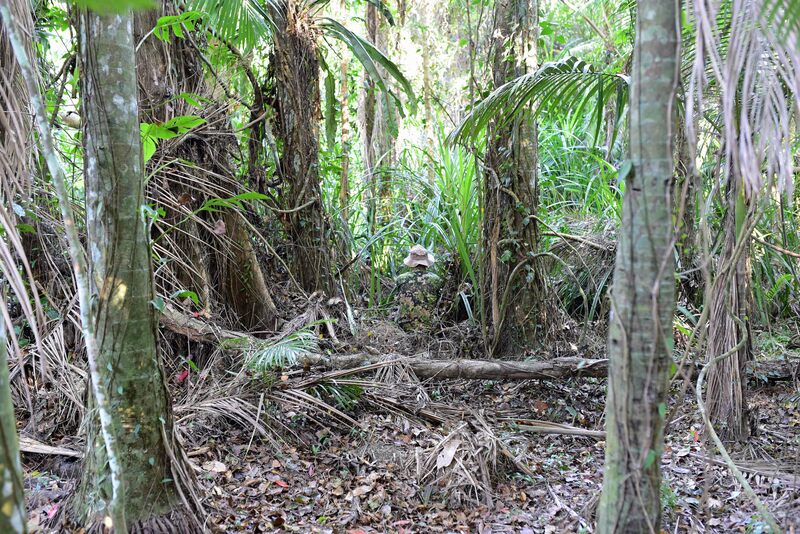 Ridgeline hunting camouflage (New Zealand/Australia). “I am a big fan of what’s commonly called port hole mesh fabric here in the States… it makes for great light weight ghillies, blankets and ponchos”. 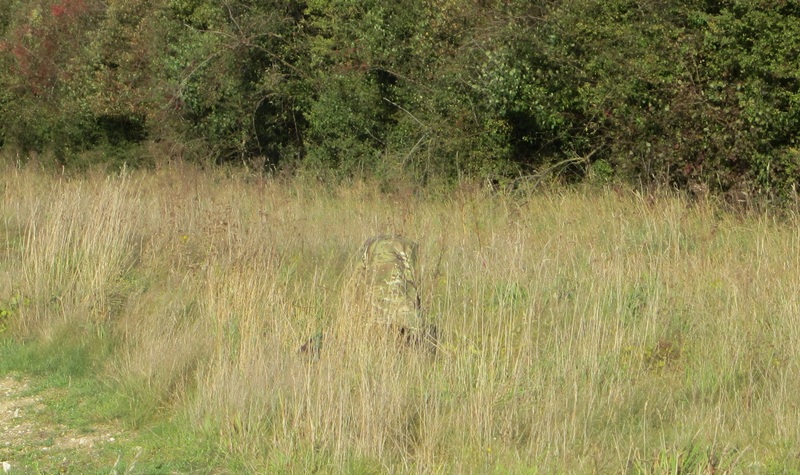 Matthew Dermody, the “Ghillie suit Guru”. Hidden SuccessTactical. “Any pattern that has more browns than any other color works the best. With the four seasons in consideration, brown colors blend in a majority of the time”. “The object is not to look like a bush but to look like nothing”. Mast and Halberstadt. To be a Military Sniper. In Dermody. Hundreds of designs (including various versions e.g. lighter, darker, greener) available (May 2016). A test by Natick found that terrain-specific designs work better in the relevant terrains than multi-terrain designs, which by nature tend to be a compromise. “The data clearly show that environment-specific patterns provide the best camouflage, i.e., the lowest probability of detection in their specific environments”. 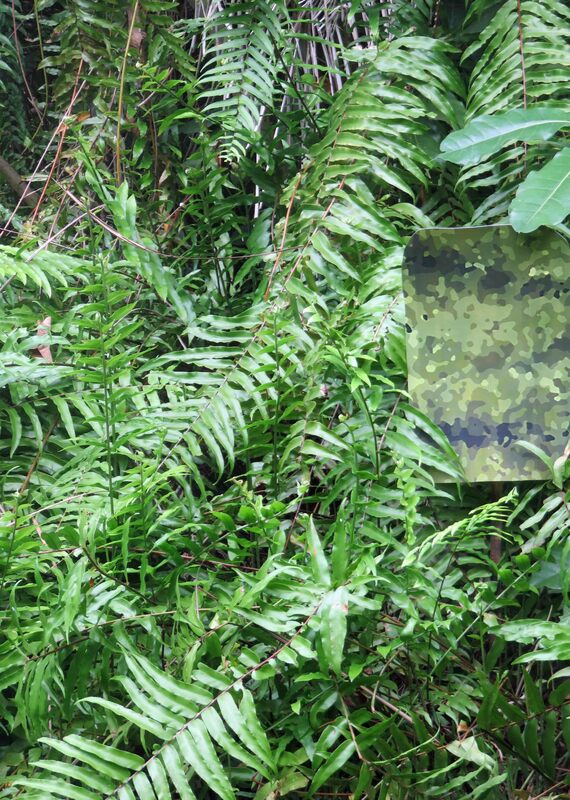 “…woodland patterns perform best in woodland environments, and desert patterns perform best in desert environments.” Photo Simulation Camouflage Detection Test. Natick. No surprises there. Also, non digital patterns generally performed better than digital patterns (with the exception of Marpat Desert in an urban terrain). 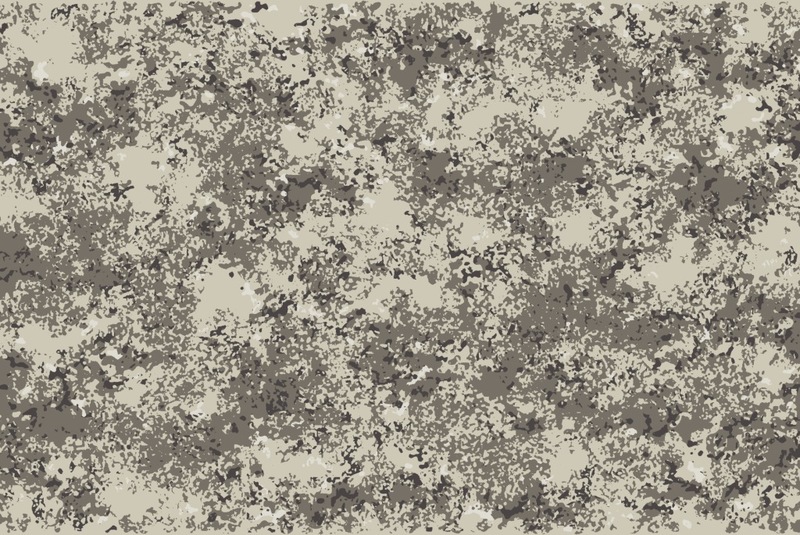 Bondcam Urban Concrete, Urban Rubble, and other urban camouflage designs – numerous designs for urban terrain in dry, dusty and hot climates, and some for urban terrain in wetter, colder climates. It is very difficult to produce a really good urban camouflage design, and some designs in use are more to do with fashion and are very bad indeed. In my opinion, A-TACS AU is the best urban camouflage presently available, but I am confident that some of my designs, while different and therefore difficult to compare, should be comparable in effectiveness in some urban terrains. 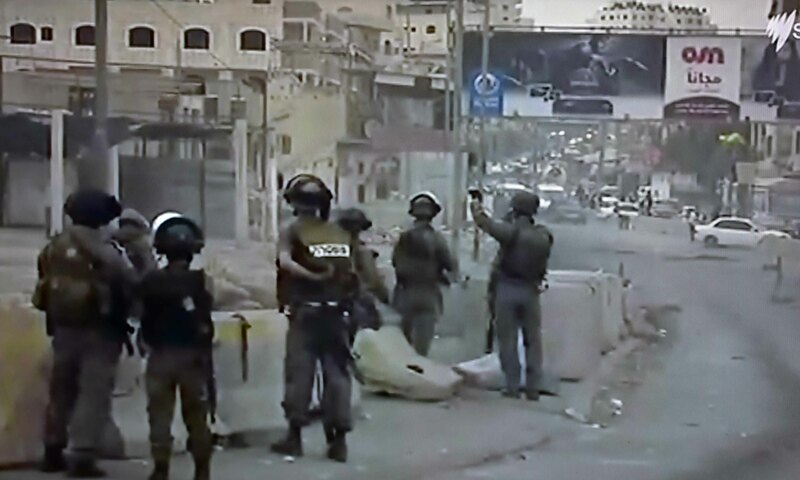 Urban terrain is often fairly light in tone, and darker uniforms tend to stand out. 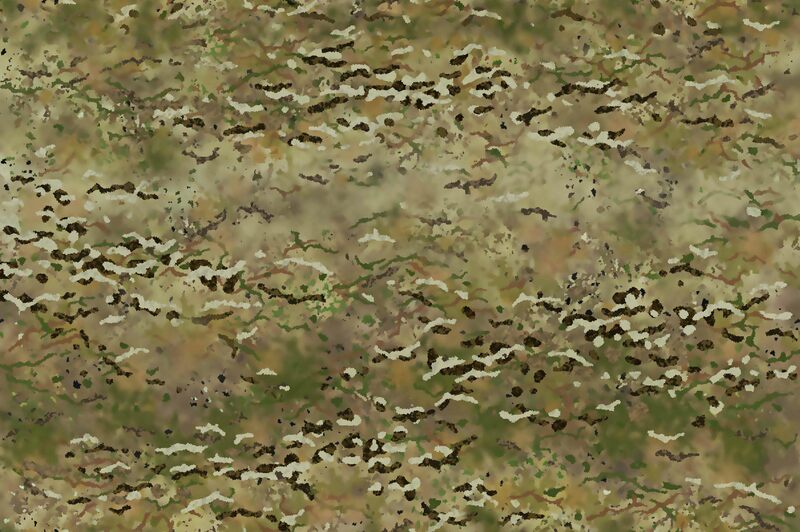 Multicam is also too dark and too green in this terrain. Bondcam Urban Concrete 2 Dark. BondCam FrontLine M2 Urban. David Clode. Camouflage test. Bondcam Frontline M2 Urban Digital works surprisingly well in this rain forest terrain. Camouflage by David Clode. Bondcam FrontLine M2 Urban Digital. Camouflage david Clode, rneder Glavis Loh. Bondcam Boring Beige – the idea behind these designs is to be dull and boring and therefore not particularly noticeable, and they should work reasonably well in multiple terrains. They may not look like much, but that is the idea. Many mammal species around the world are beige through to brown, grey, or grey/brown. This can work quite well, even in mostly green terrain, if the tone is right, and if there is some tonal range, so that at least part of the tonal range matches the background, even if the colour is different. In addition, browns, tans, beiges, grey/browns etc., generally also have a reduced near infra-red signal compared to greens. 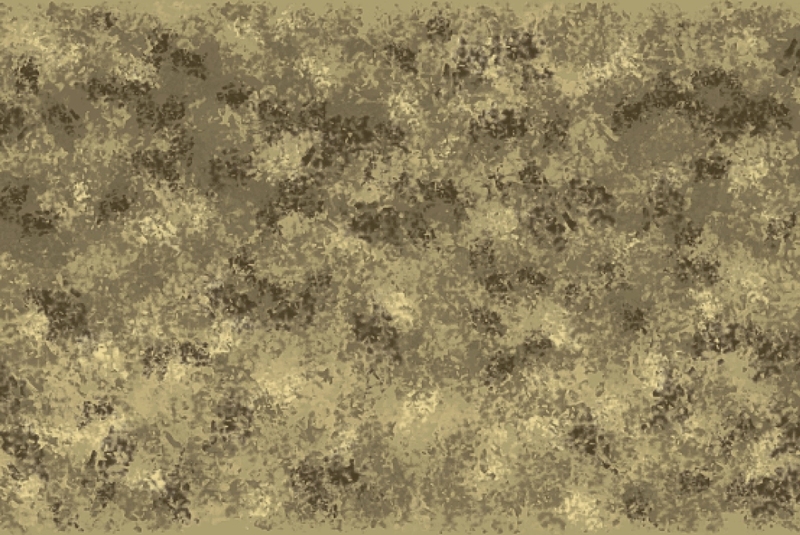 Designs can be modified to suit more specific terrains, but my Boring Beige designs should work reasonably well (but not perfectly well) across urban, some desert terrains, through to dry grassland, to semi-arid and mid wet terrains. See a version which I have fine tuned to suit African grassy woodlands in the dry season, further down this page. A small swatch from one of the boring Bondcam “Boring Beige” series. 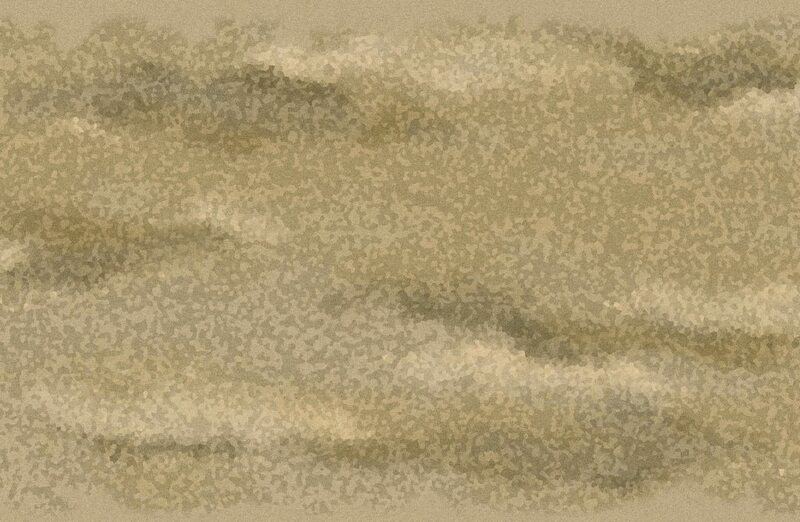 Beige/brown is pretty much universal, and works reasonably well in a broad range of terrains. Deliberately designed to be dull and boring, and therefore not particularly noticeable in the first place. Camouflage design: David Clode. BondCam Boring Beige 3. (Urban/desert). FrontLine M2 Urban Classic Digital 1. This design could be viewed as a possible alternative to UCP. However, UCP is a much colder blue/grey, while this design is a warmer brown, and darker, which should also make it work a little better in natural terrains as well as being reasonably effective in urban terrains. Camouflage design by David Clode. 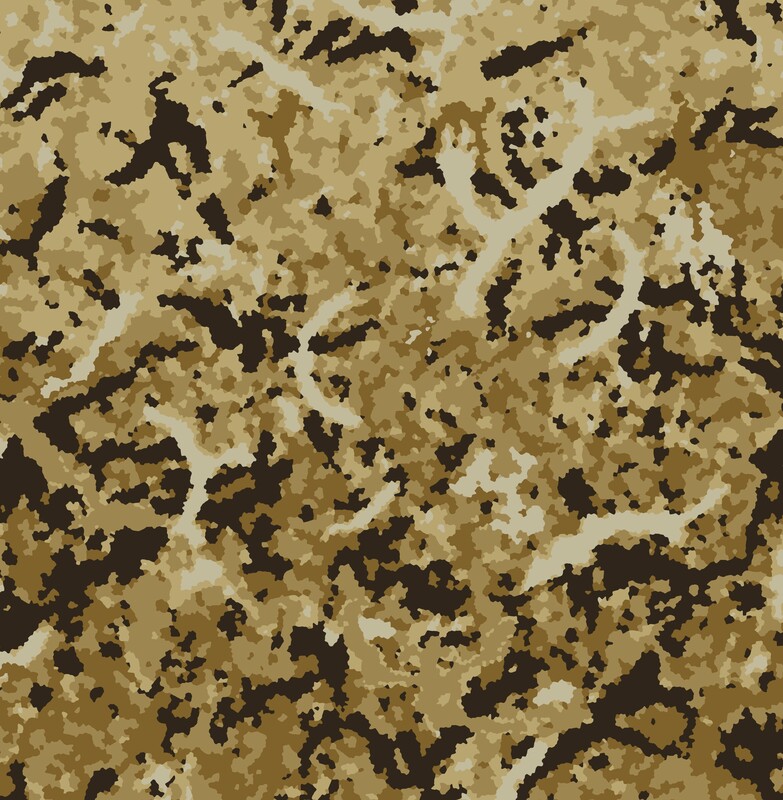 Desert camouflage designs – for Western North Africa through the Middle East to South Asia. 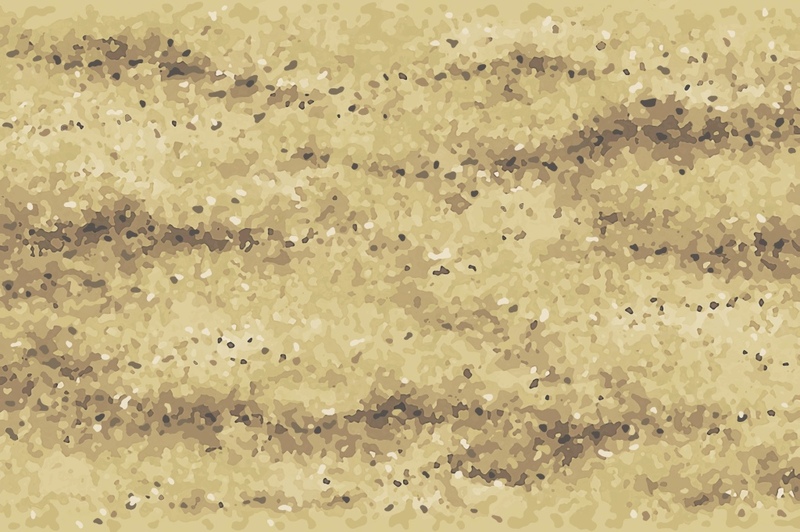 Multiple designs, including for sandy deserts, rocky deserts, and a mixture of both sand and rocks. 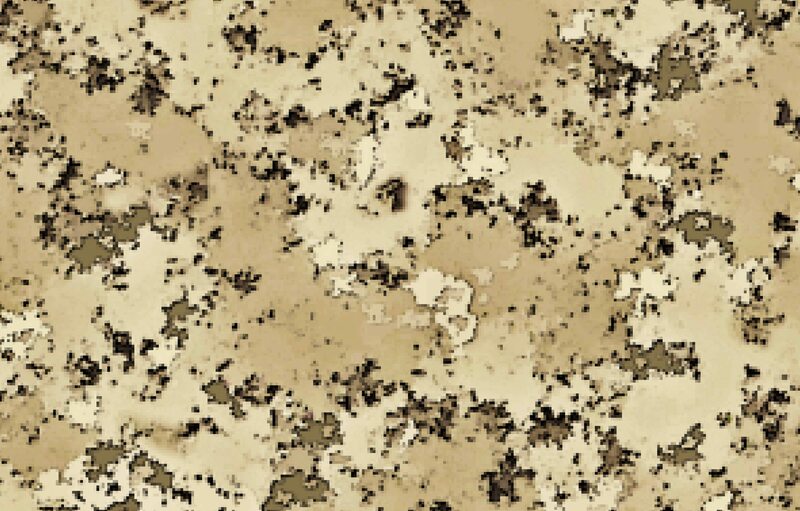 Some of these very detailed and innovative designs may prove to be at least as good as Cadpat Arid, Marpat Desert and Italian Desert (the three best existing designs for deserts so far, in my opinion), and possibly even better. 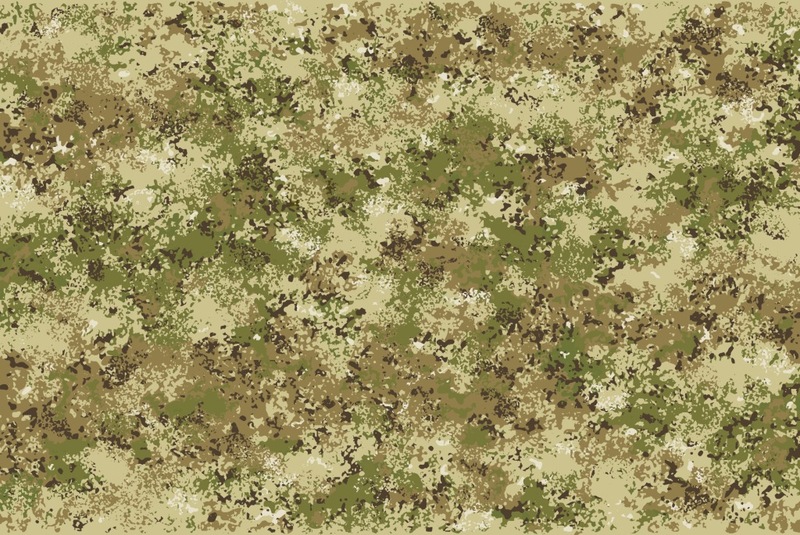 They are almost certainly better than some of the camouflage designs used by some Defence Forces at present, and likely to be better in deserts through to light coloured semi-arid regions, than MultiCam (although MultiCam has an arid version). 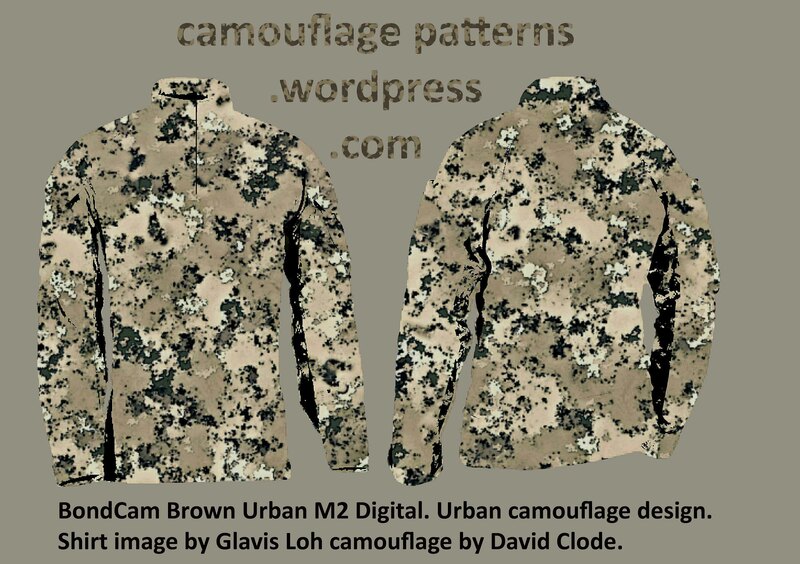 Urban/desert camouflage designs – a few compromise designs intended to work reasonably well in both urban and desert terrains, from Western North Africa, eastward through the Middle East to South Asia. BondCam Desert Stripe. (Urban/Desert compromise). BondCam Commander M2 S Desert/Urban. 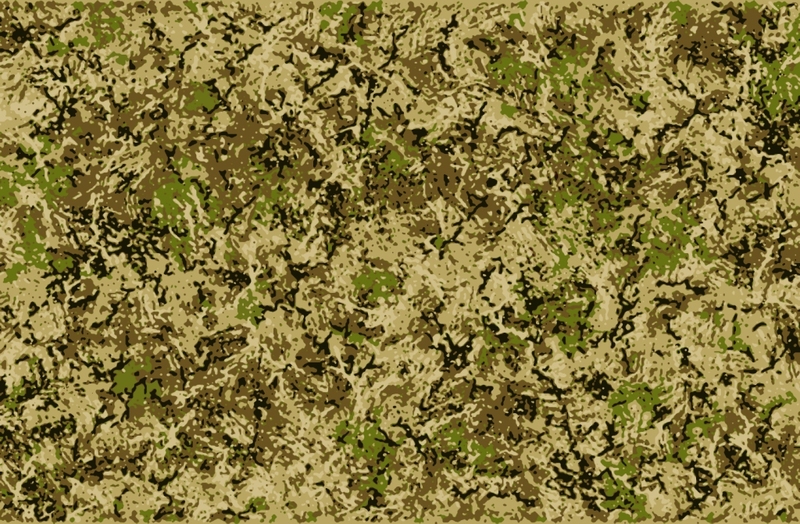 A camouflage pattern by David Clode. BondCam MTD Urban Multi-directional. Camouflage design by David Clode. 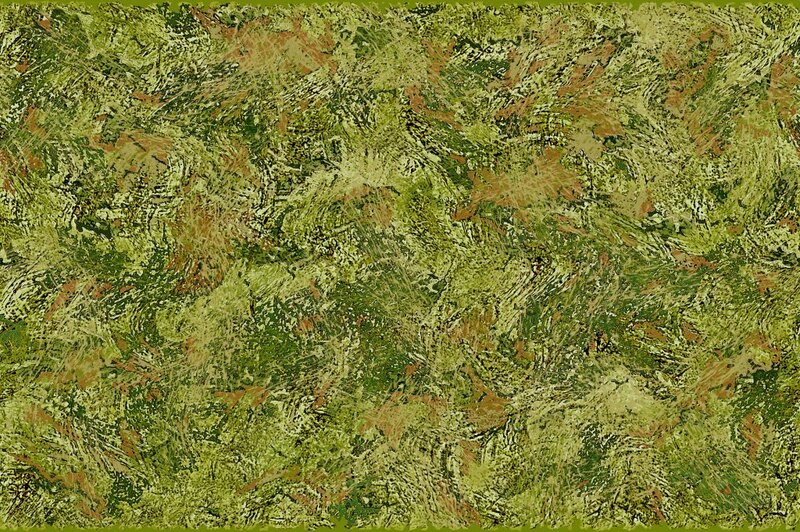 Arid and Semi-arid camouflage designs – for arid to semi-arid terrain, i.e. dry country, but not as dry as deserts. BondCam Spectrum 1 M1 Blurry 2 Arid. BondCam MultiOps Semi Arid M1. One of the Bondcam semi-arid designs (swatch, incomplete). Camouflage: David Clode. 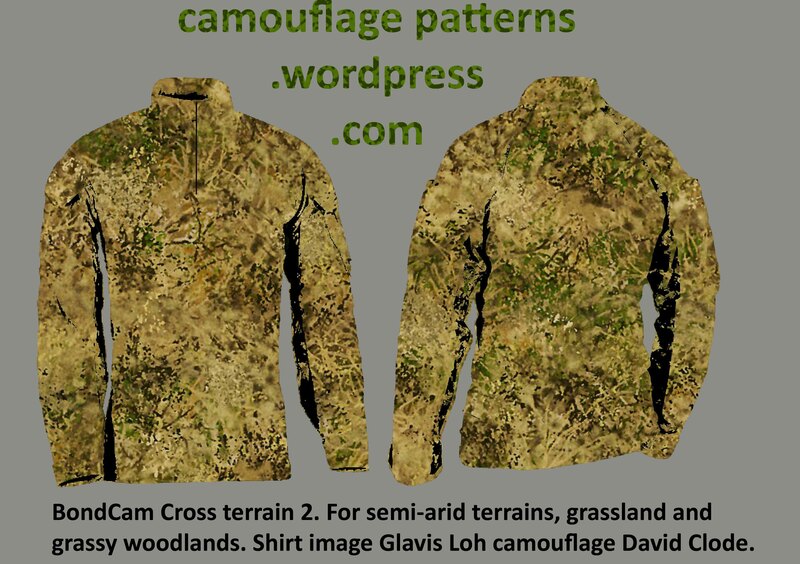 Grassland and Grassy Woodland camouflage designs – numerous grassland and grassy woodland camouflage designs for both wet and dry seasons in both tropical and colder temperate climates. 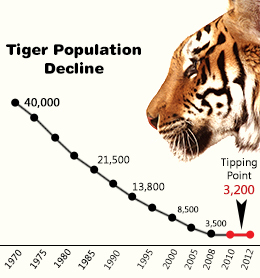 Probably mainly of interest to conservation organizations for rangers and anti-poaching patrols. 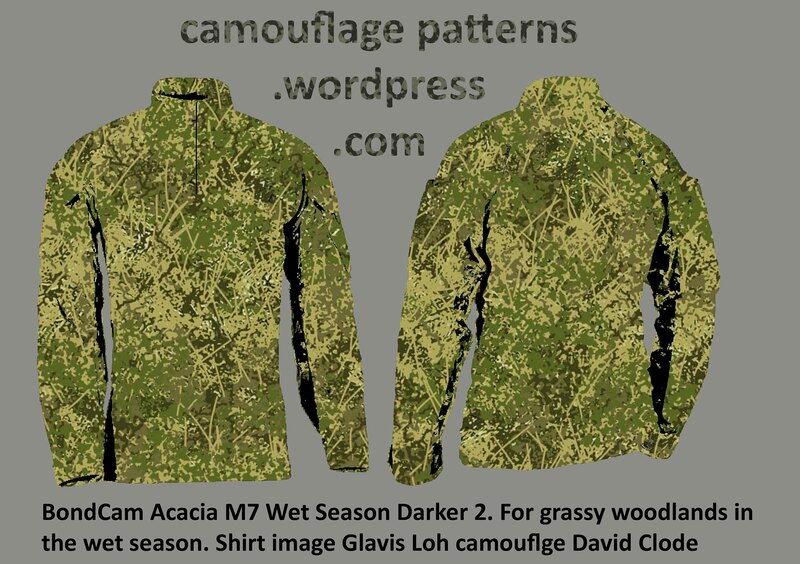 Green wet season designs may well be of interest to Defence Forces in wetter, colder climates. See also the page “Allan Osment Camouflage”. BondCam OmniTerrain M2 Wet. Camouflage design by David Clode. Indonesian army officers being trained by the Australian army in Northern Australia. The woodland camouflage is too dark for a grassy woodland, the green is too bright and artificial looking, and the red doesn’t help either. The grass is mainly Themeda triandra, and the trees appear to be Eucalyptus tetrodonta. Photo: Cairns Post newspaper. Romeo MTP. See the page “Allan Osment Camouflage” for more designs by Allan Osment. 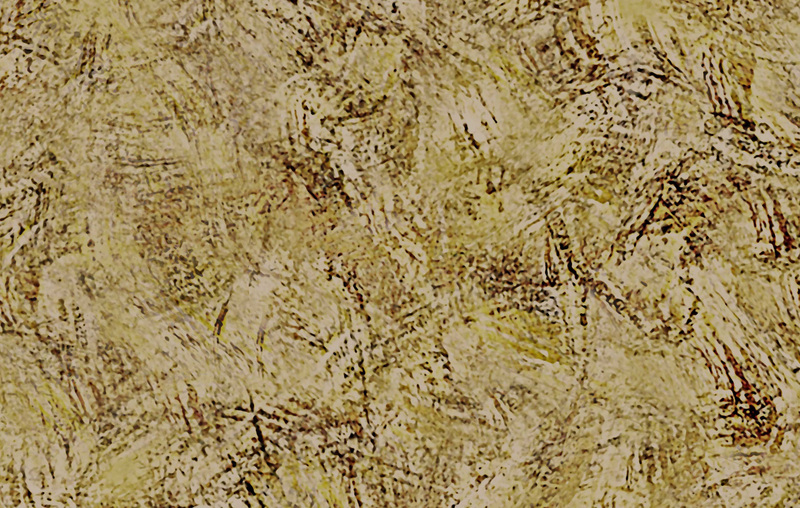 Romeo MTP in long dry grass – an excellent match in texture, tones and colours. Broad Spectrum 2 M2 Dull. For dry grassy woodlands and woodlands. BondCam Broad Spectrum 2 M2. Camouflage design by David Clode, render Glavis Loh. BondCam Acacia M7 Dry Season. BondCam Acacia M7 Wet Season Darker 2. 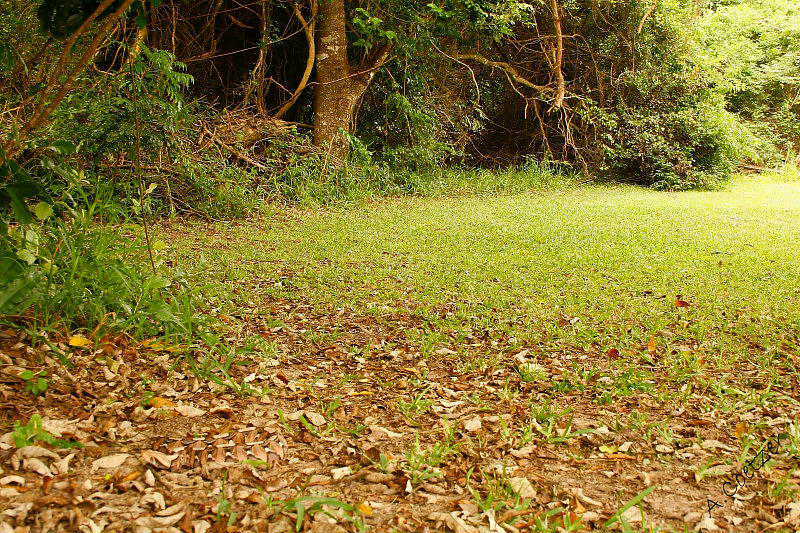 A grassy woodland design by David Clode, aimed mainly at anti-poaching work. BondCam Acacia Wet Season M7 Darker 2. 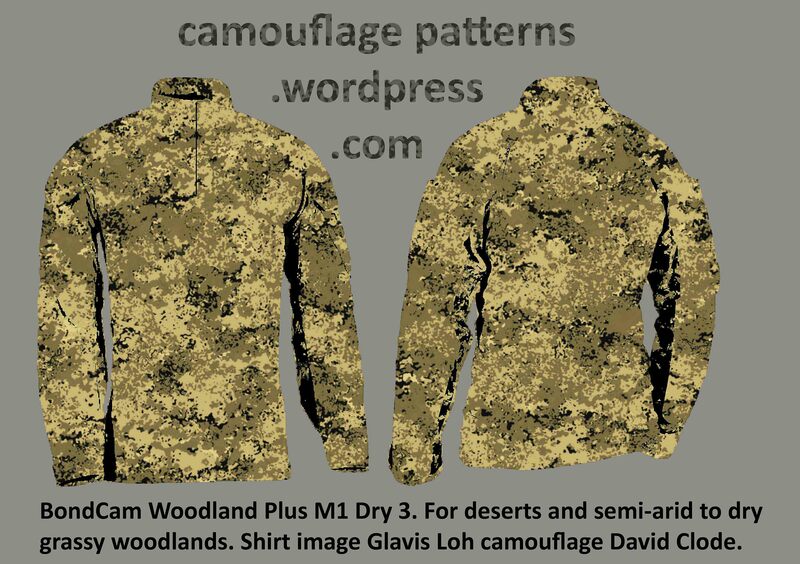 Camouflage design David Clode, render Glavis Loh. BondCam Acacia M7 Dry Season Low contrast compared to MultiCam. Photo: David Clode. 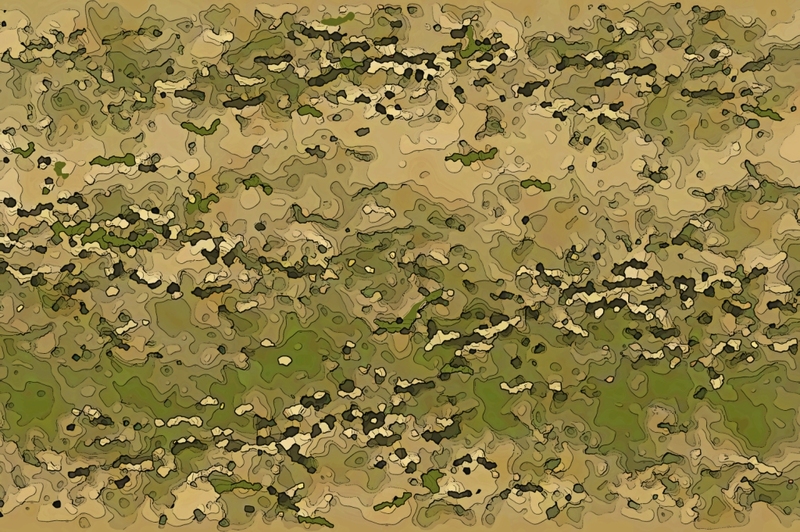 Mediterranean climate/sclerophyll vegetation – a few camouflage designs, and other than the rather dark Italian San Marco, I am not aware of anyone else having designed camouflage specifically for this terrain/vegetation type. In addition, the Bondcam Lynx series (about 8 designs) is based on the camouflage of the Iberian lynx or Spanish lynx Lynx pardinus, an animal that inhabits Mediterranean sclerophyll vegetation. Iberian Lynx (or Spanish Lynx, Lynx pardinus). Photo: YoYo Photography. BondCam Mediterranean Multi – small low resolution swatch. Also suited to dry grassy woodlands in Africa and India. BondCam Mediterranean Scrub M3 Blurry. Abstract wheat field painting (portion). David Clode. BondCam Mediterranean Scrub M3c. A more “grassy” version. Bondcam Mediterranean Grassy woodland. Camouflage by David Clode. 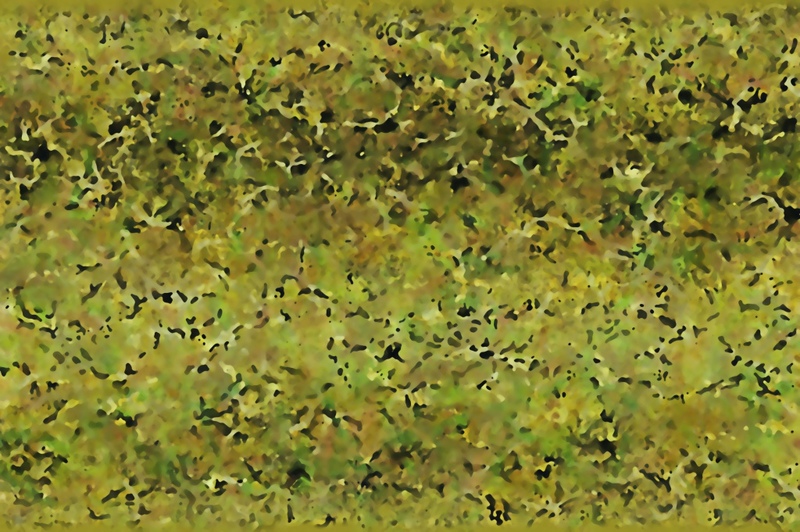 Woodland camouflage patterns – mostly green and brown designs for wet forests, such as deciduous forests, and/or grassy woodlands in the wet season (temperate or tropical), and rural areas. Bondcam Deciduous Forest 2 small incomplete swatch. Camouflage design by David Clode. BondCam Game Warden 2 M1 Flecktarn. Rain Forest 2 M1 S Super Digital 2 (a forest/woodland design by David Clode) compared to a used MultiCam shirt. 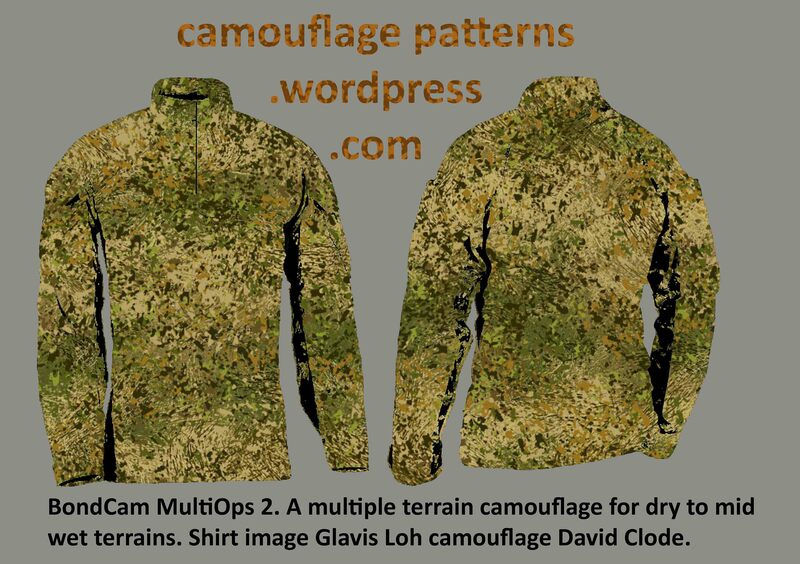 The design above has been tested and proven to work very well in wet forests (superior to MultiCam in this terrain). 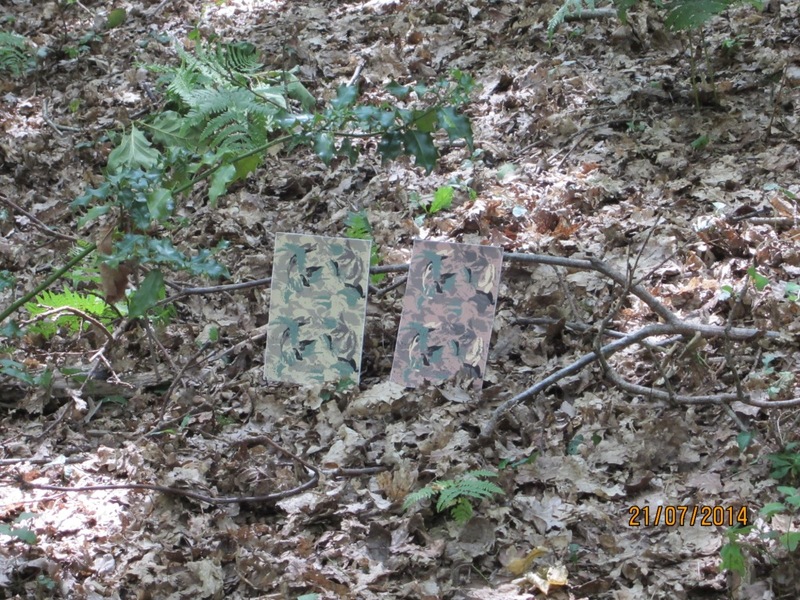 see photos below and on the “Forests/woodland Camouflage” page. 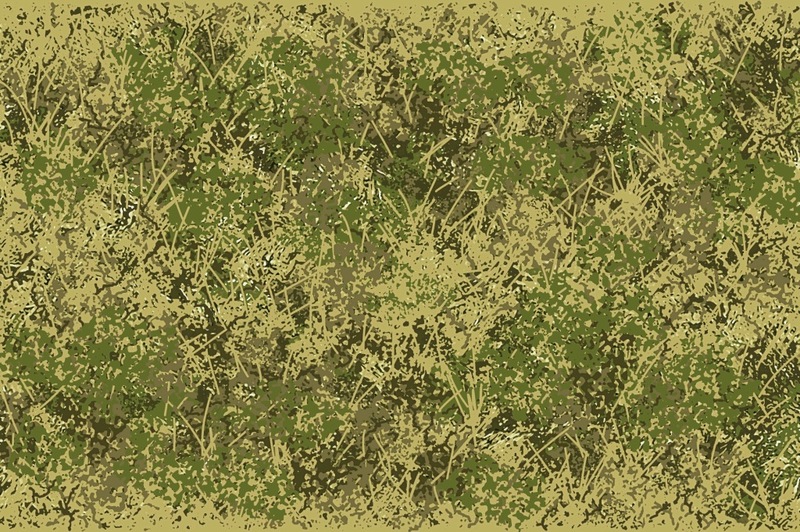 Rural camouflage – a few designs for countryside/rural terrain (which generally consists of pasture/open fields of rough grassland and some trees), but not all green. Light and dark versions (dry and wet). BondCam Pasture Beige M2 Light. BondCam MTD M4. Camouflage David Clode. 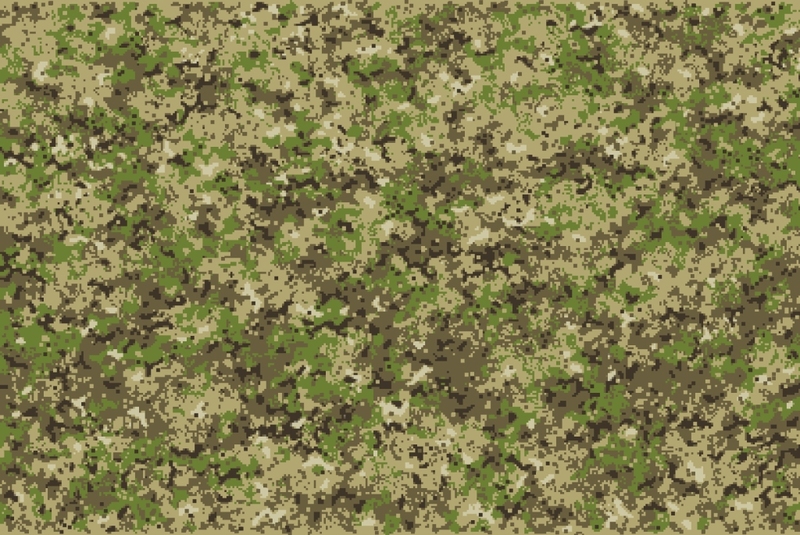 Rocky Mountains camouflage designs – a few designs for rocky terrain, suited to regions with medium to high precipitation and altitude. 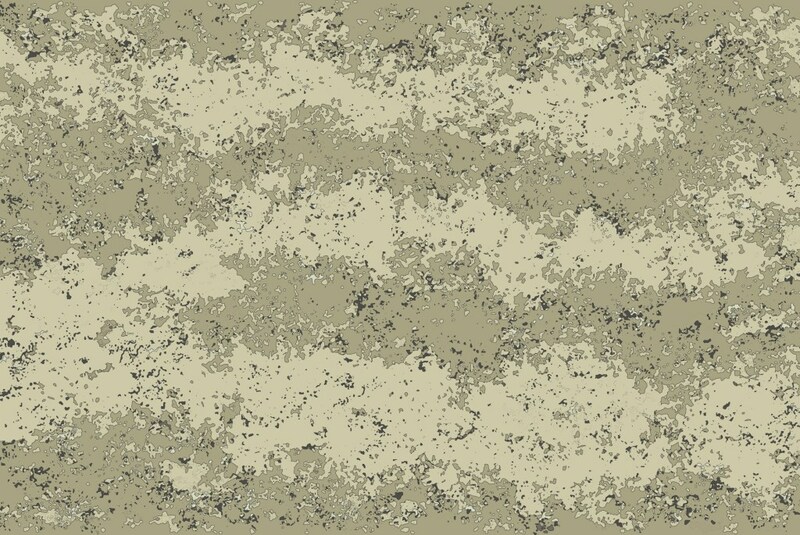 A swatch from one of the Bondcam Rocky Mountains camouflage designs (small incomplete swatch). Note the curving warped illusion, which helps to disguise the recognisable curves of the human body. Camouflage: David Clode. BondCam Mountaineer M2, showing a 75cm x 75cm portion of a design which is 100cm x 150cm. 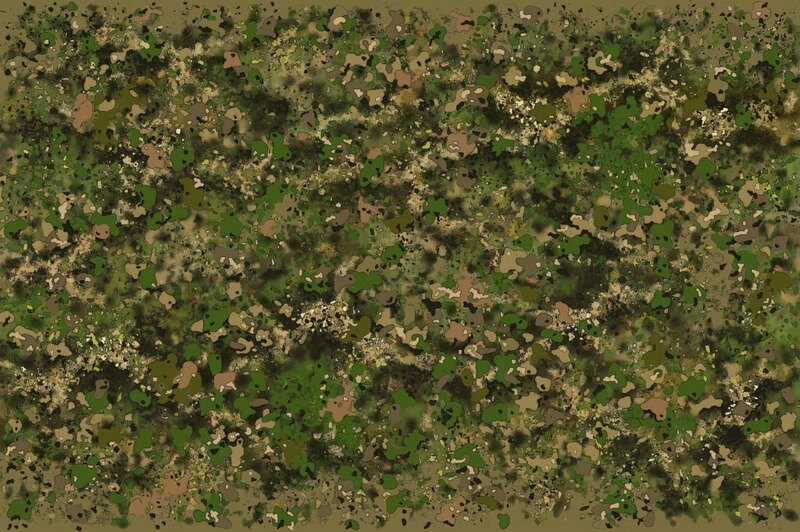 Multi-terrain camouflage for rocky mountainous and woodland terrains. Camouflage design by David Clode. The woodland camouflage in the photo below is not much good in this terrain, while the dark navy blue (clothes and berets) is worse. 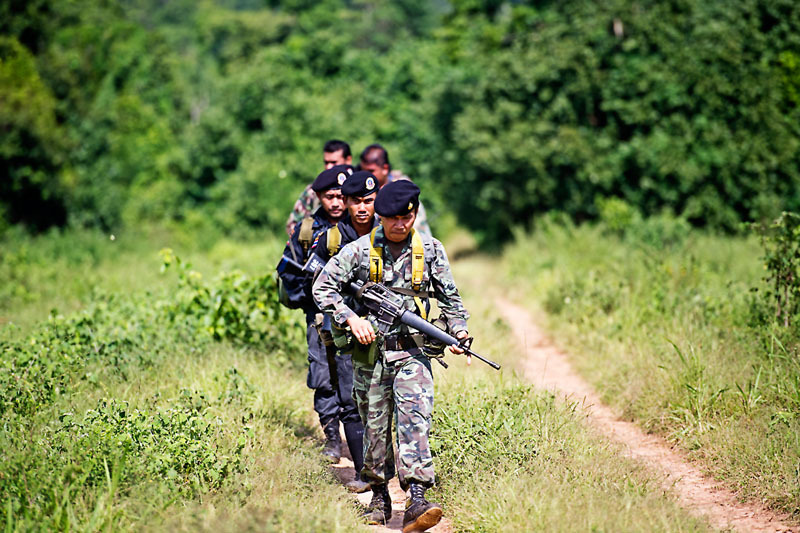 The patrol team in Kui Buri National Park, set up by the Thai government in response to the recent escalation of tiger and elephant poaching by organised wildlife crime syndicates, Thailand. 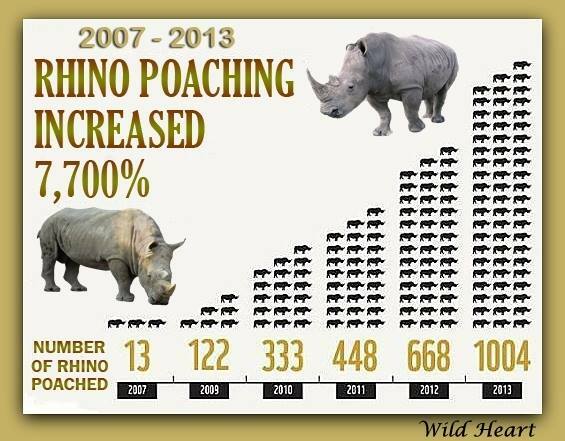 Over 1,000 rangers worldwide have lost their lives protecting wildlife and natural places in the last 10 years. Well armed and well organised illegal poaching crime syndicates continue to target wild elephant and rhino in Africa for the large profits to be made from the illegal wildlife trade. BondCam Tropical grass A3 photocopy in Guinea grass which is very common in the tropics. Camouflage design by David Clode. Bondcam Tropical Grass M1. Camouflage David Clode. BondCam Tropical grass M1. Camouflage David Clode, render Glavis Loh. BondCam Cross Terrain 3 Traditional Tropical. A few designs which would be better for the terrain above, and similar (tropical Central and South America, Africa and SE Asia). 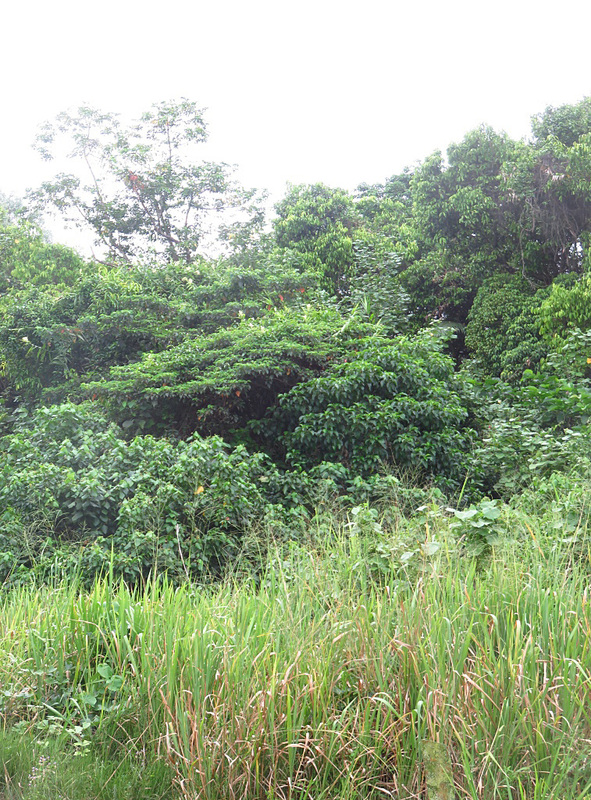 See also rain forest camouflage below. 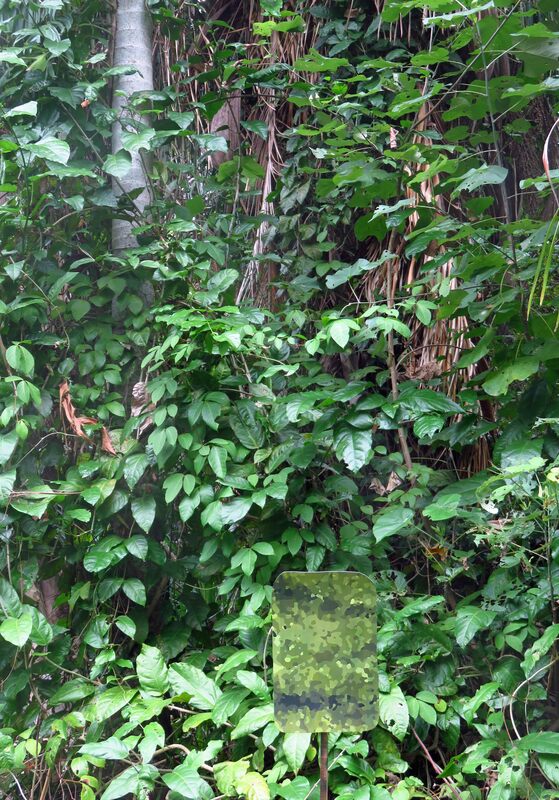 Rain Forest camouflage – very detailed designs, and possibly some of the best designs for tropical or equatorial rain forests/jungles in existence. Would suit conservation personnel in some National Parks in India, Central and South America, South East Asia and Africa, and Defence Forces of some countries e.g. Thailand, Philippines, Brazil, parts of Africa, etc. 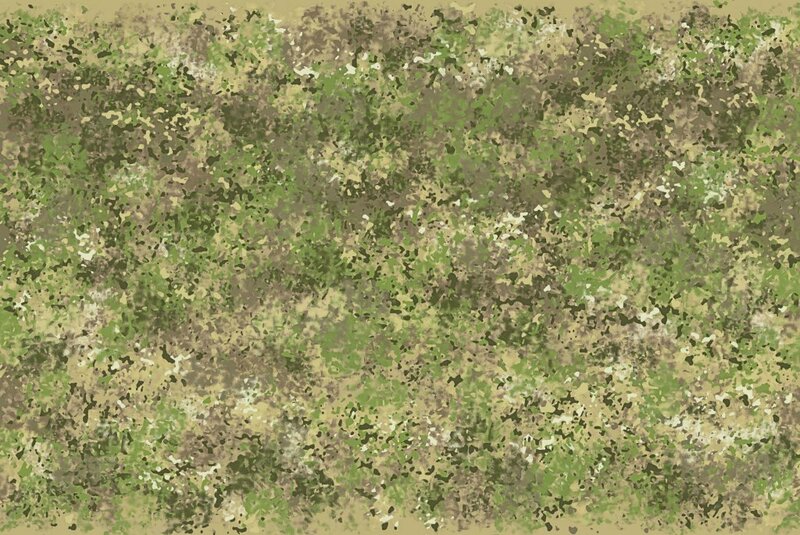 BondCam Wet Woodland swatch (approx. 50cm x 50cm). 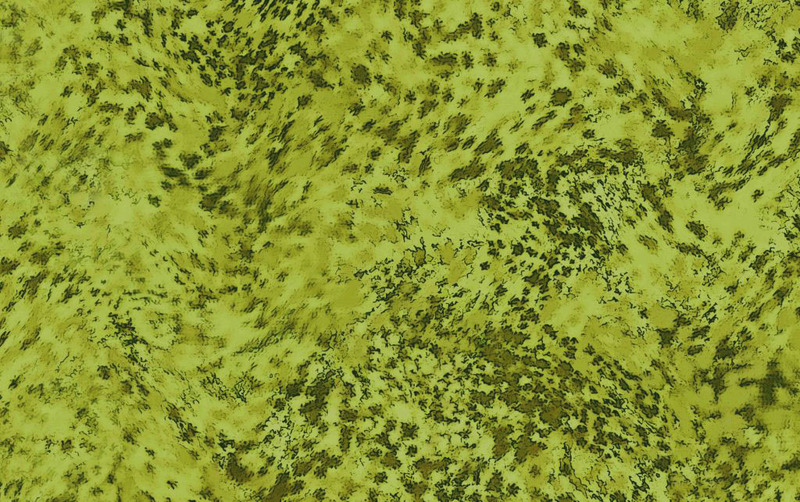 Camoufl;age design by David Clode, suited to a range of forests and mostly green terrains. Digital BondCam Brown Green Contrasty 1. Note the detailed micro pattern within the macro pattern. Digital BondCam Brown Green Contrasty 1 in a tropical forest, about two metres/yards away. 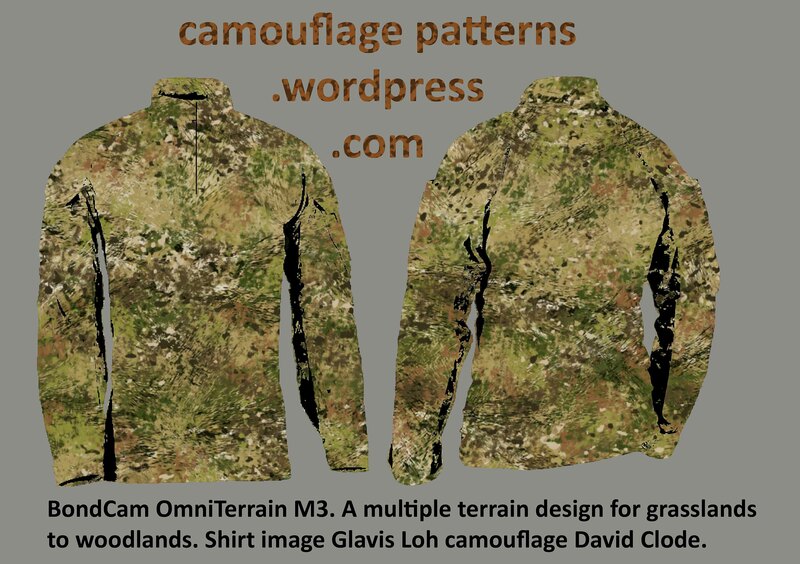 Camouflage pattern by David Clode. BondCam Rainforest Interior 2. 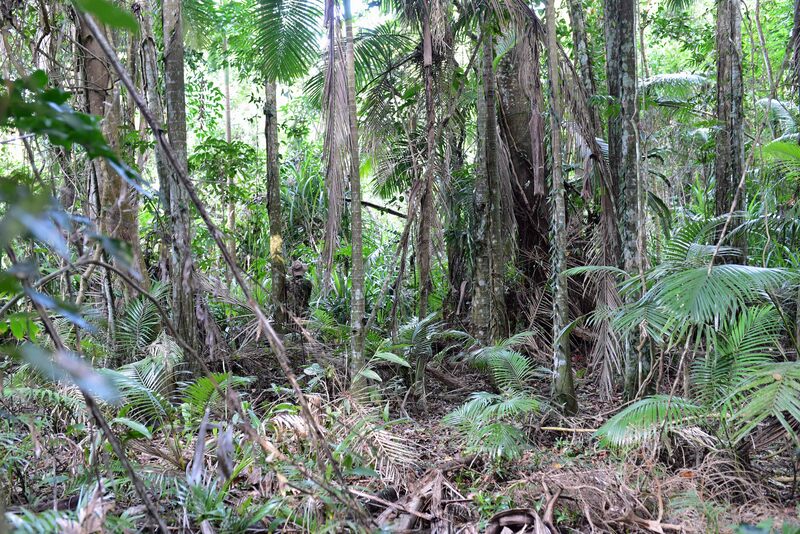 The interior of a rain forest is usually quite dark, with more brown (tree trunks, dead leaves, lianas) and less green than most people think (see the photos on the page “Camouflage and Terrains”). Other greener rain forest and forest/woodland designs available. BondCam Rain Forest Interior 2. Colour photocopy card in the centre of the photo. Camouflage design by David Clode. 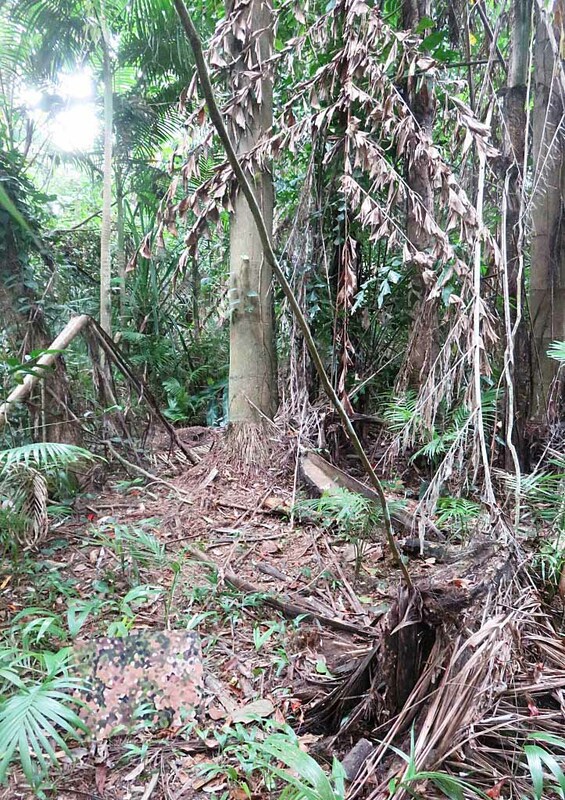 BondCam Rain Forest 2 M1 S Super Digital 2 in a tropical rain forest in Queensland Australia. Design, test and photo: David Clode. Rain Forest 2 M1 S Super Digital in a rain forest. Better than MultiCam. Design, test and photo: David Clode. Multiple Terrain camouflage designs – Bondcam General, Bondcam Spectrum, Bondcam Broad Spectrum, Bondcam Recon, Cross Terrain, and Bondcam Commander camouflage designs – some general purpose, broad spectrum camouflage designs, offering potential alternatives to MultiCam, A-Tacs AU, etc. These should work reasonably well in a wide cross section of terrains (but not so well in very wet or very dry terrains). Other Bondcam designs would suit very dry, or very wet terrains. 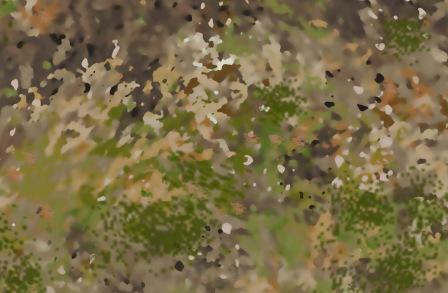 Many have a detailed micro pattern, so that they work at closer distances than most existing camouflage designs (which could be important for surveillance, snipers, and hunters). Bondcam Commander Olive (as in Commander Bond, of course!). 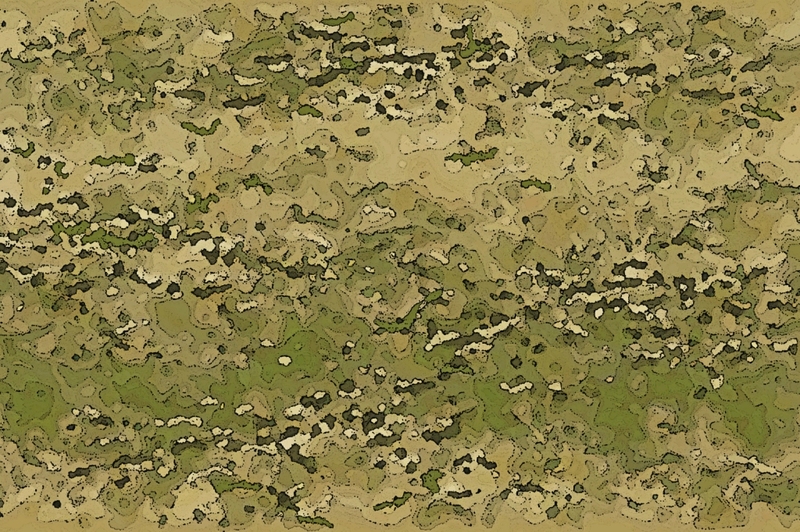 A series of versions for various terrains. 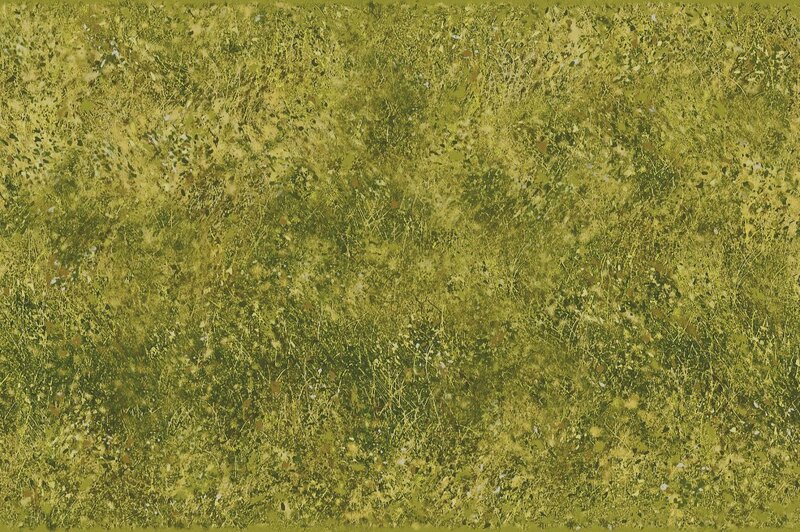 This swatch is one of the darker, greener versions, for mid to wetter terrains. 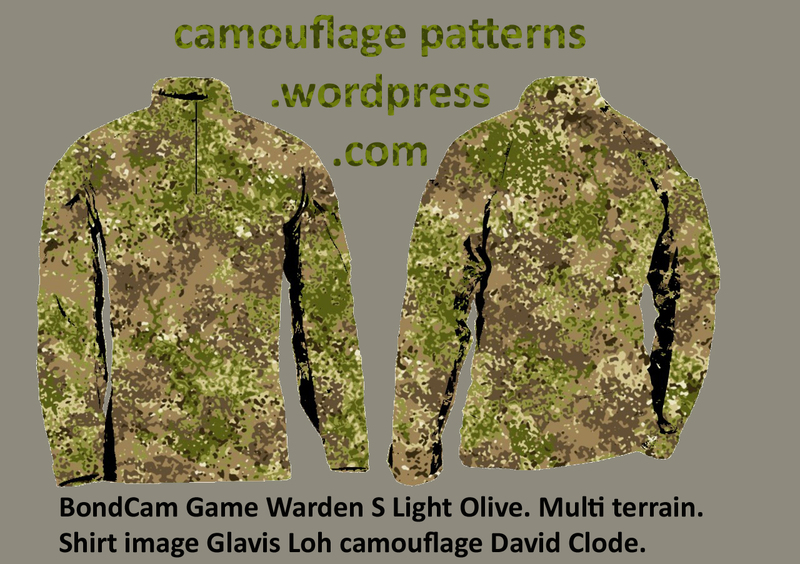 Camouflage pattern: David Clode. Bondcam Ranger swatch. 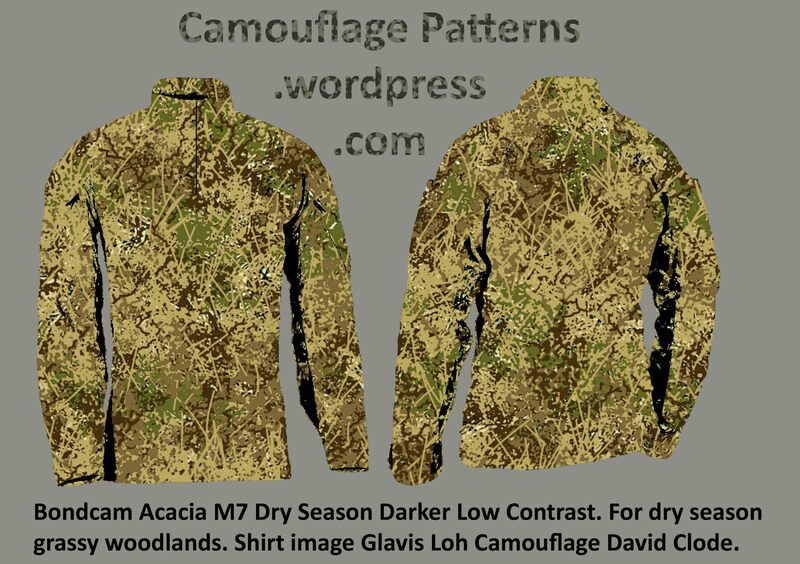 Should work well as a multiple terrain/season camouflage in semi-arid to mid wet terrains. Numerous other colour versions, and lighter and darker versions, also available. Camouflage designer: David Clode. BondCam MultiOps 2. Camouflage David Clode, render Glavis Loh. 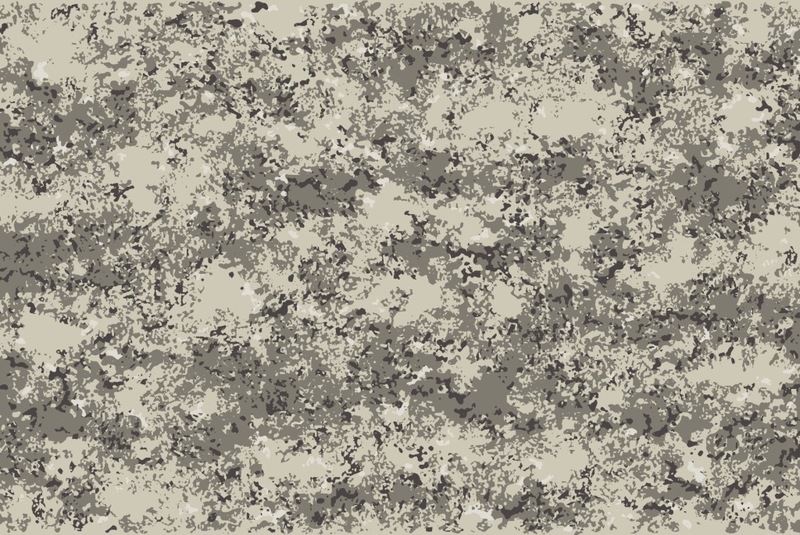 Air Force/Navy camouflage patterns – a few mostly grey designs, which should work fairly well to very well in some urban and rocky terrains. 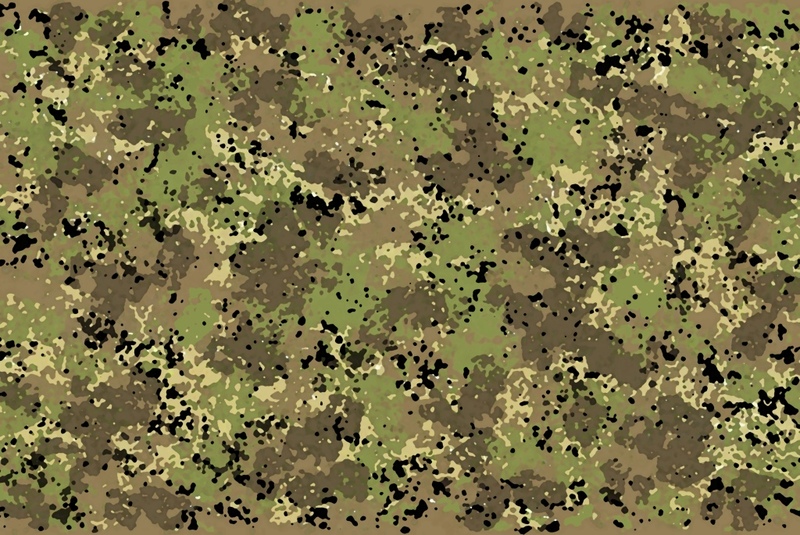 Navy Diver camouflage designs – about ten camouflage designs for wet suits for navy divers, including designs for mostly rocky marine terrains, for seaweed/kelp terrains, and two for tropical coral reefs. Navy Diver 7. Camouflage David Clode. 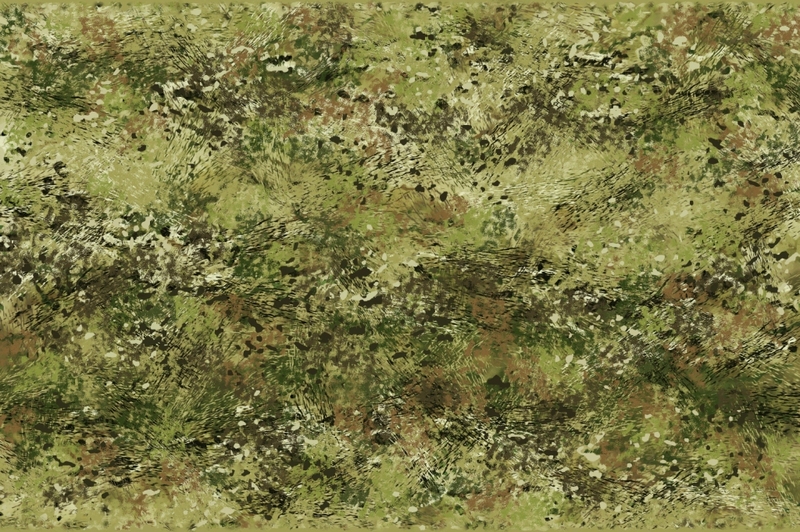 Incomplete Bondcam Sargasso camouflage swatch. Camouflage design by David Clode. The unfinished Sargasso design above is inspired by seaweed. Boncam Sargasso Edge Green. Camouflage design: David Clode. 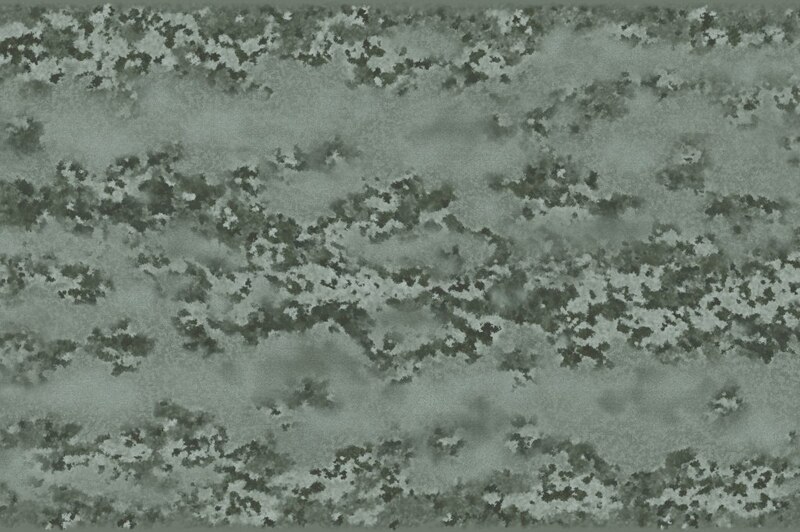 Most navy camouflage (and air force) is cold grey and/or blue or blueish and is not much good as camouflage on land . “Sargasso” has a marine theme (inspired by sargassum seaweed), and so may be considered suitable as a navy or navy diver camouflage, but would also work well on land in many terrains (other variations available, including a lighter version, and a greener version, than the swatch shown above). 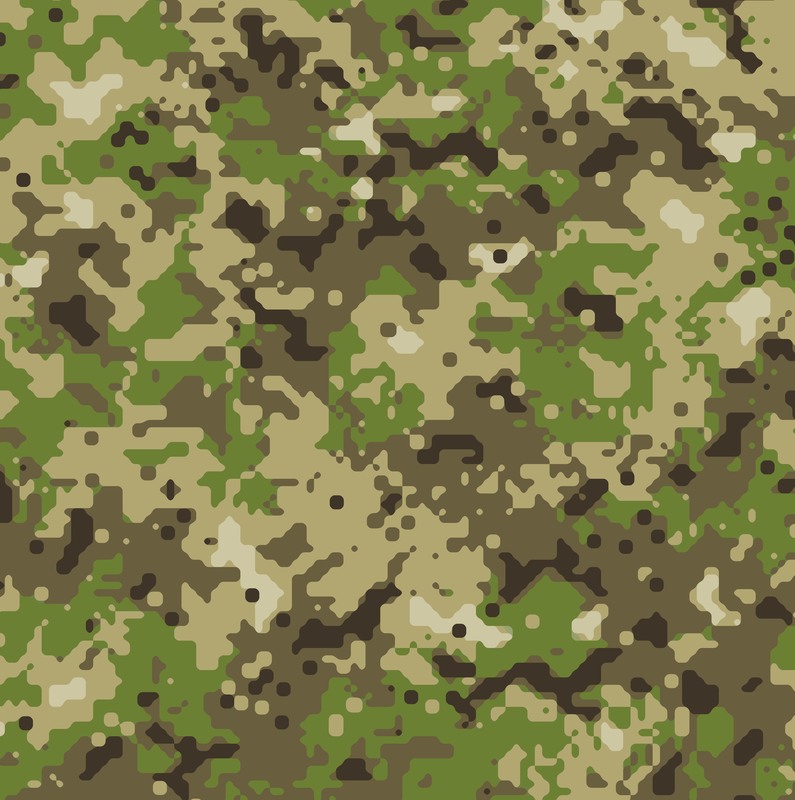 This camouflage should be very effective as a navy diver design in seaweed/kelp forests. 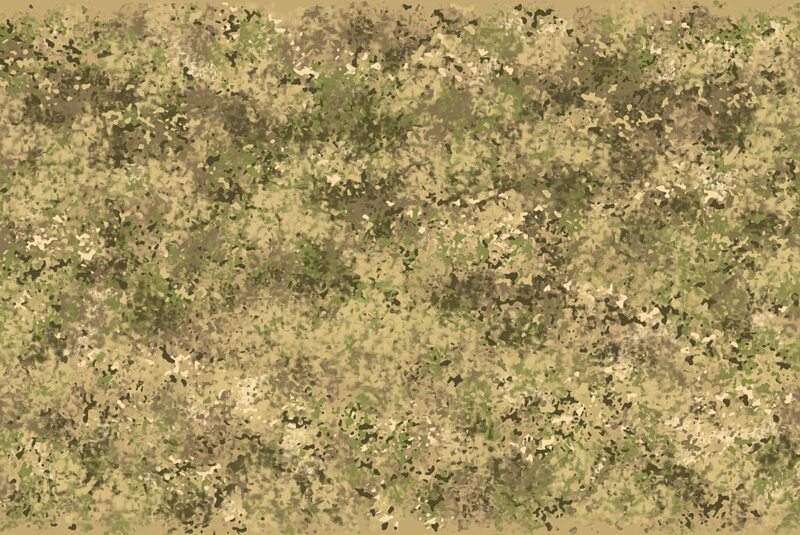 In other words, a truly multiple terrain camouflage design which should work reasonably well across a wide range of both marine and terrestrial terrains. 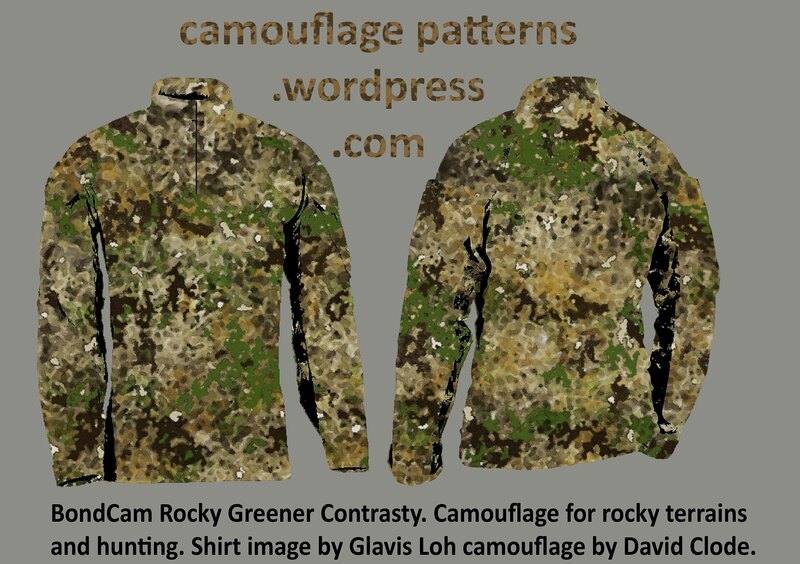 For more, see the Anti-poaching Camouflage page. 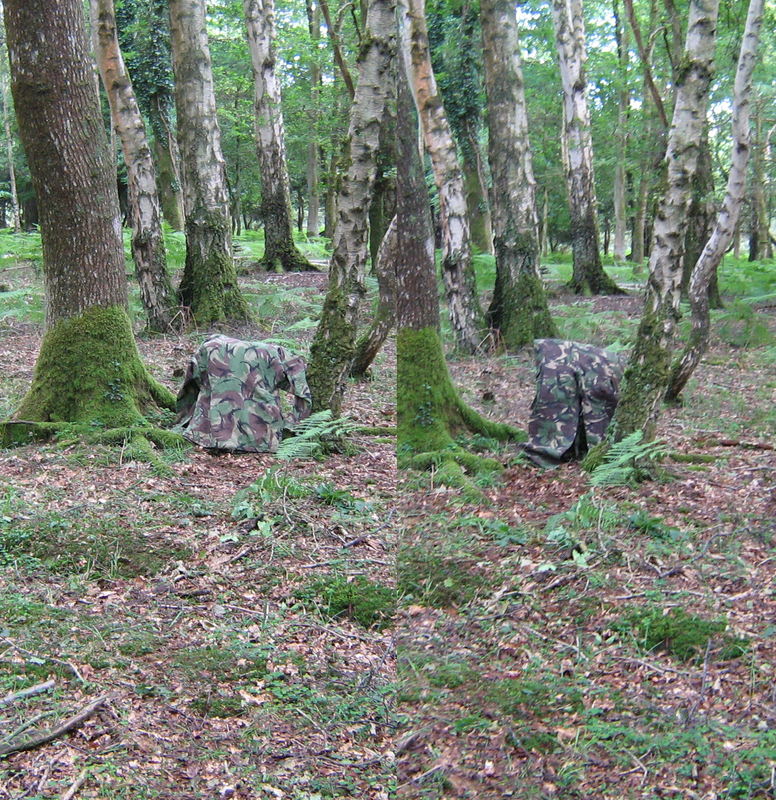 Some of the anti-poaching camouflages (mostly grassland, grassy woodland, and rain forest designs) may also be of interest to Defence Forces, and could be modified as needed. Likewise, some of the designs for Defence Forces may be suitable for anti-poaching use. The dvd “the thin green line” by Sean Willmore, is well worth watching, and is certainly an organization worth supporting. 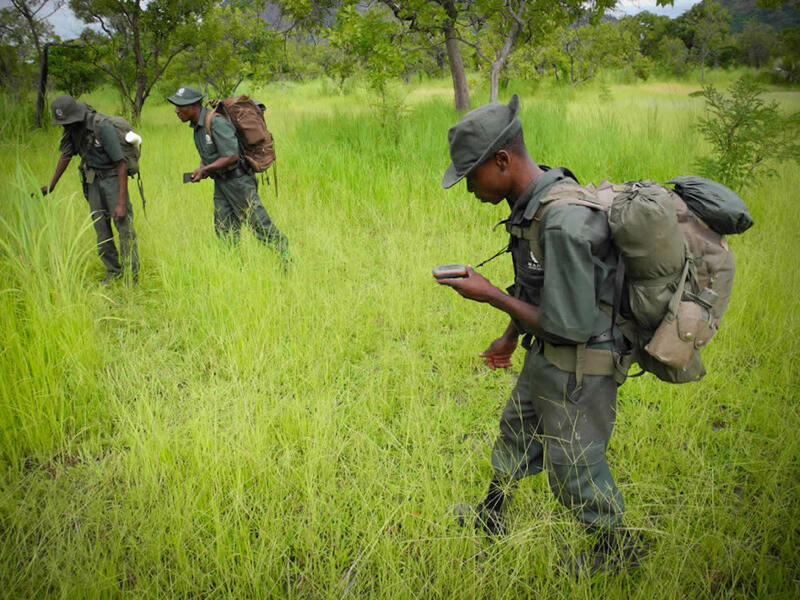 “As many as 1,000 park rangers have been killed in battles with poachers over the past decade.” (worldwide). Walsh, Bryan. Save the Animals. Time Magazine. August 18, 2014. Pge 28. “At least 56 rangers have lost their lives in the line of duty in the past 12 months, 29 of whom have been killed by poachers, according to the International Ranger Federation”. (worldwide). Prerna Singh Bindra, letter to the editor, BBC Wildlife Magazine, vol 33 no. 2, pg. 58. 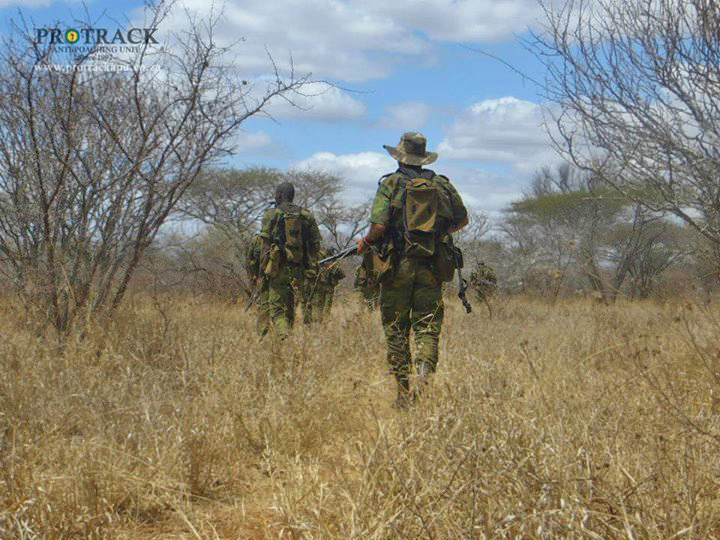 Protrack Anti-poaching unit. South Africa. Photo: Protrack. Note how the uniform is rather dark for the terrain (they are backlit in this photo, which does make it worse of course). 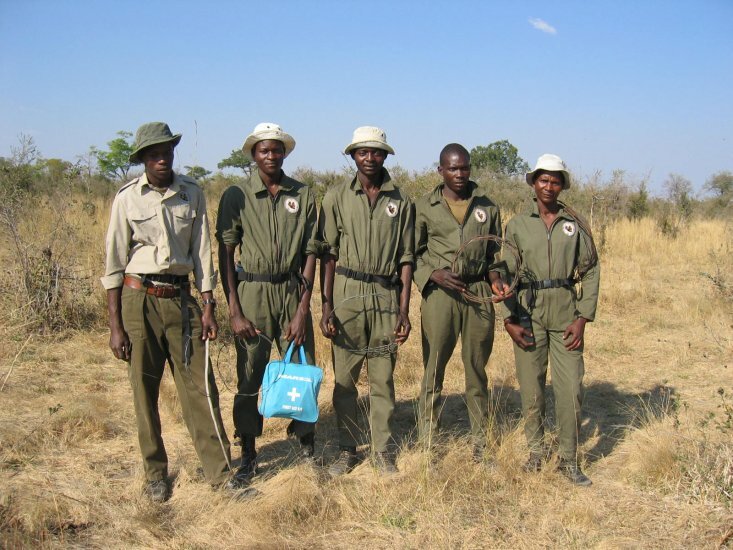 A Zimbabwean anti-poaching unit. Photo: davidshepherd.org. Olive green/drab or grey/green is generally too dark, especially in the dry season. In the dry season, olive green is generally too dark and too green. 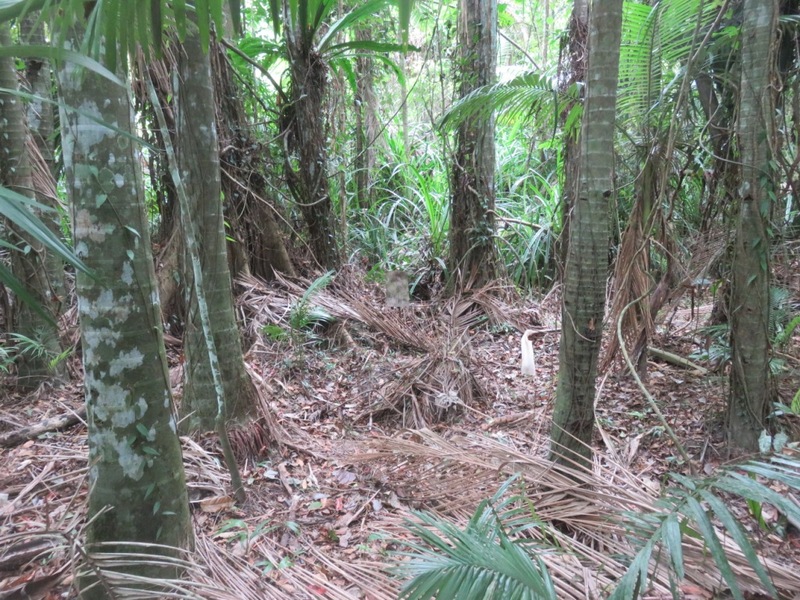 The light coloured grass and darker brownish grey bushes and trees (see the camouflage design below) in the two photos above are typical of much of the savannah woodlands of tropical and subtropical Africa. The colours of the grass and other vegetation in much of Africa are also similar in parts of India, South-east Asia and parts of South America. For example, anti-poaching units in India, trying to protect tigers, elephants and rhinos, also need better camouflage uniforms. 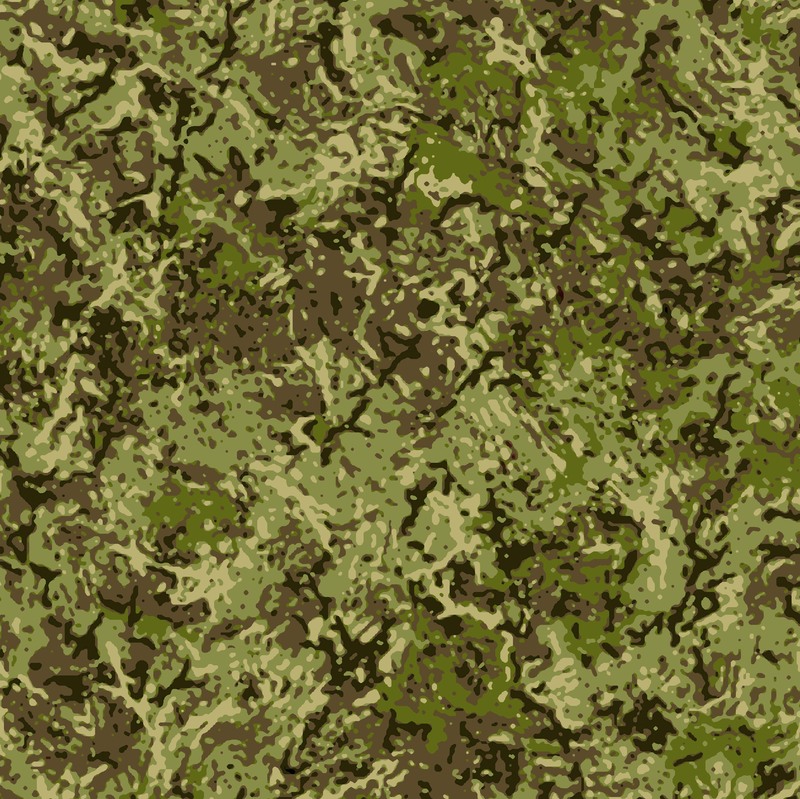 My camouflage designs should work a lot better than olive green (and most other camouflage patterns in use) in most National Parks, in many countries around the world. BondCam Cross Terrain 2. Camouflage design by David Clode, shirt render by Glavis Loh. Some National Parks in Africa are mainly grassland, some grassy woodlands, and some have areas of dense woodlands. Some have all. 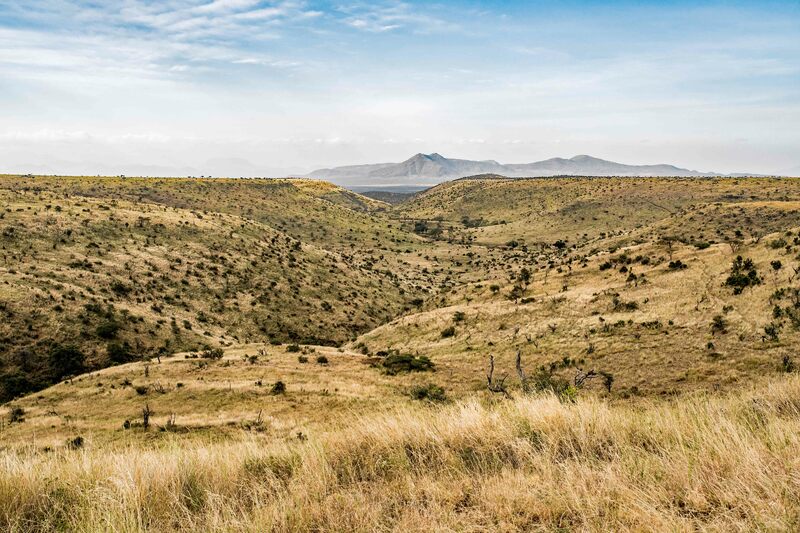 Dry grassy woodland, Lewa Conservancy, Kenya. Photo: David Clode. 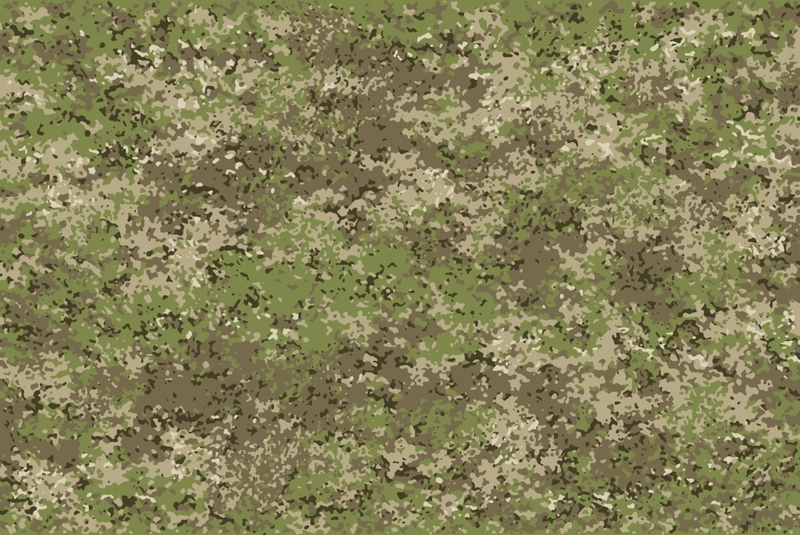 Most “off the shelf” camouflage is too dark and too green. This photo shows olive green, and a British DPM woodland design. Photo: Protrack. Bondcam Abstract African Bush. This would work better in the above terrain, in terms of texture, tone and colour. Camouflage: David Clode. 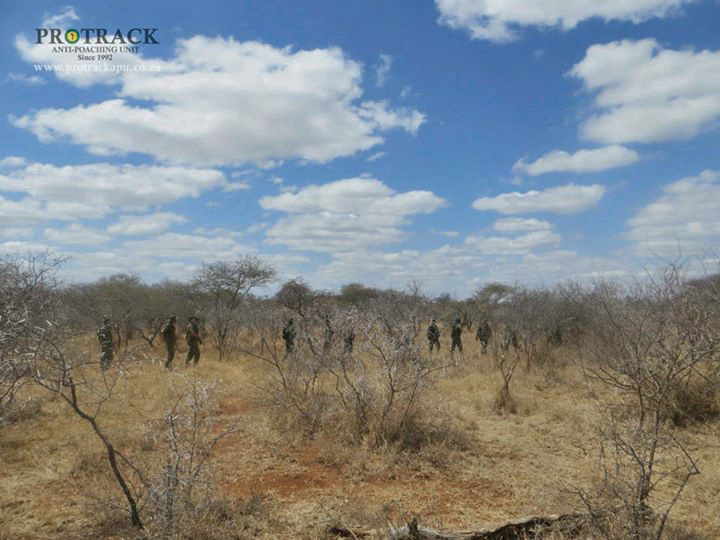 Anti-poaching unit in dark camouflage. Photo: Ichikowitzfamilyfoundation. Yankee Zulu in long dry grass in the tropics (Australia) works very well. 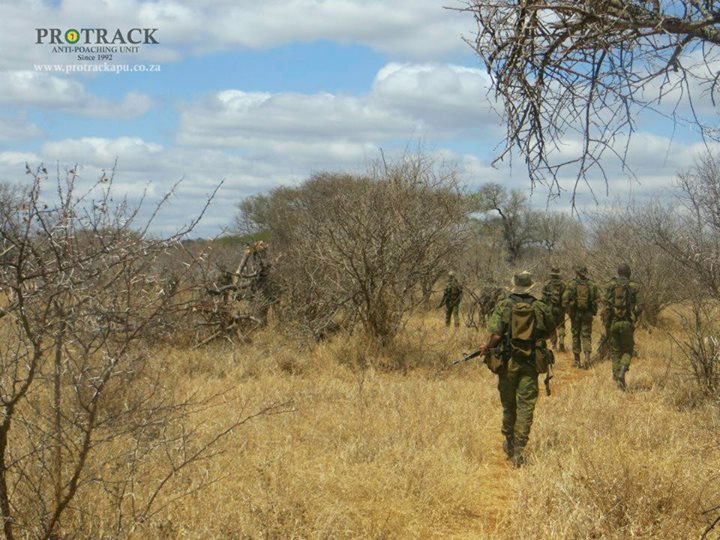 Black Mamba anti poaching unit on patrol, dry season, South Africa. 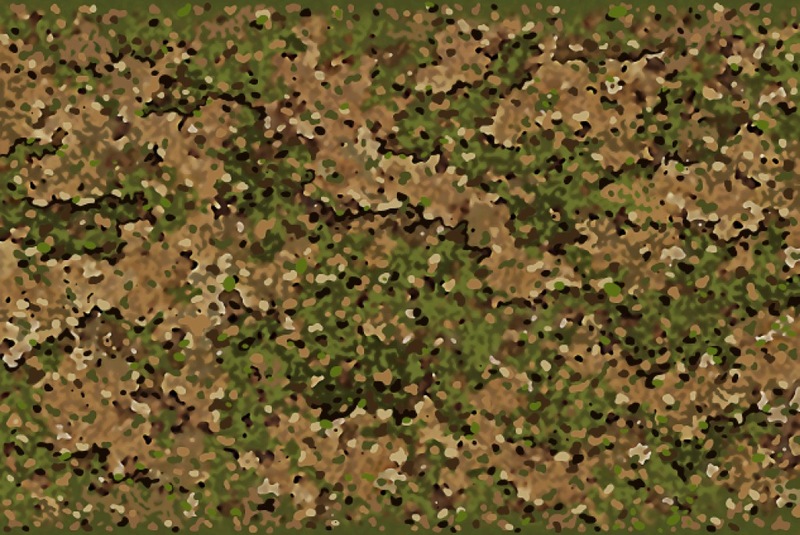 British DPM Woodland pattern. Photo: http://www.independent.co.uk. Boring Beige 5 fine tuned to more closely match the above terrain. So boring it probably would not be picked up by ambient vision. Camouflage David Clode. 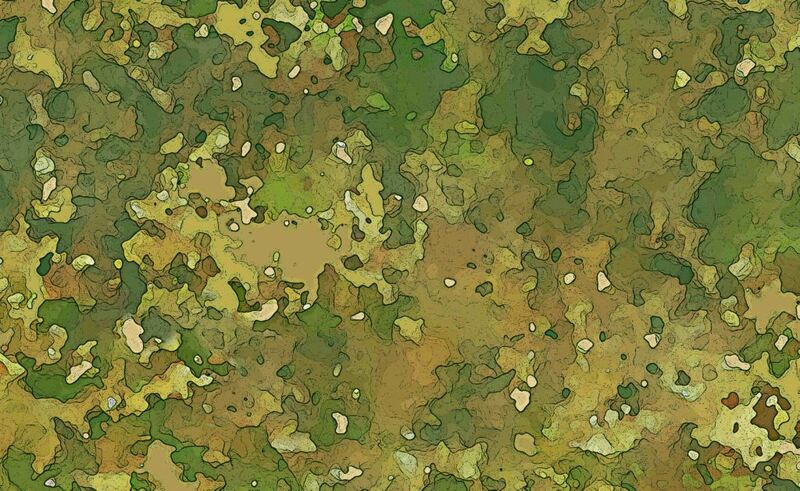 Boncam Cheetah Green swatch – a better match for the terrain above. Camouflage design by David Clode. BondCam Acacia M7 Wet Season Vibrant. camouflage design by David Clode. *In grassy areas, olive green or grey/green may also be too dark in the wet season, although they can work quite well where there are trees and shrubs. 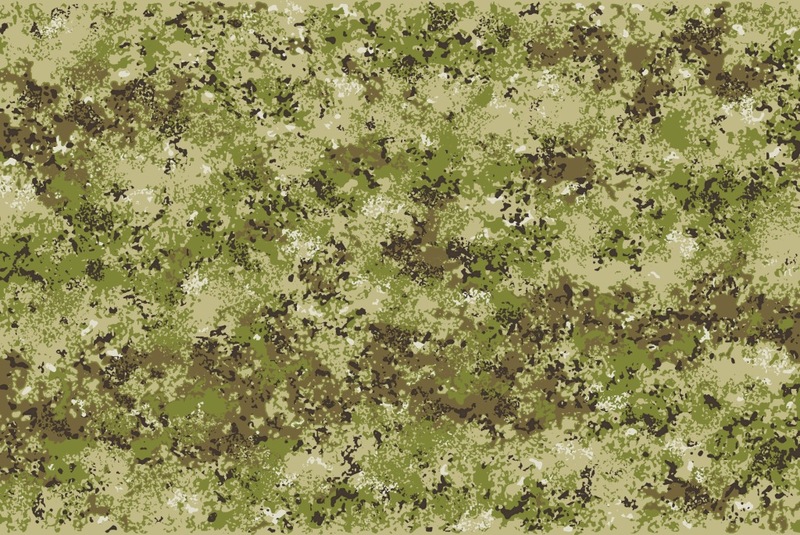 Camouflage is often about compromise, for example, trying to design something that will work reasonably well in a range of terrains and at different times of the year, but which may not work perfectly well anywhere at any time or place. Camouflage which works reasonably well where you are, is better than camouflage that works very well somewhere else, but not where you are. Also, bear in mind that good camouflage should be something that is not particularly noticeable, and can even be quite dull and boring, to avoid detection by ambient vision. 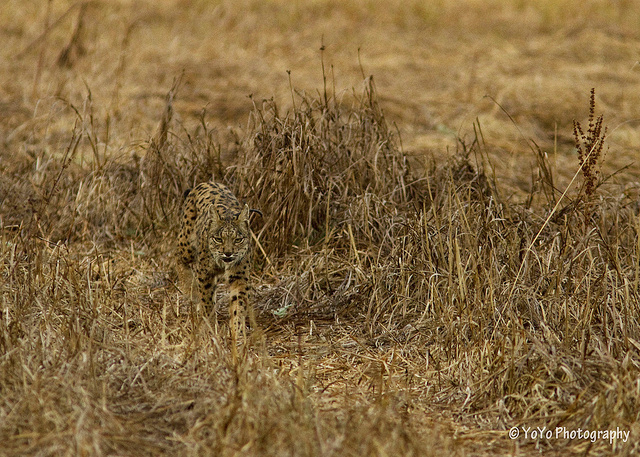 In the “Black Mamba” patrol photo (two photos above), the woodland camouflage is almost gaudy in dry African terrain. In the photo below, olive or grey/green is dull and boring, which is good, but not as good as a woodland design specifically created for this wetter terrain. The berets are a not very good artificial looking blue/green. 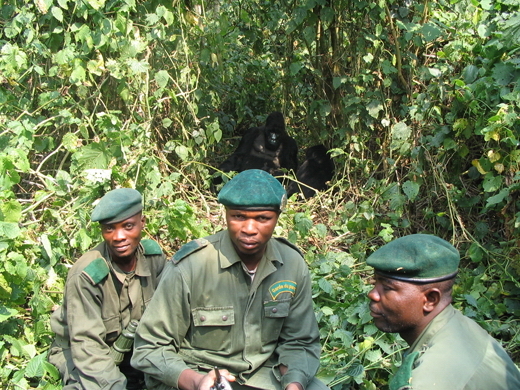 Protecting gorillas in Congo. Rain forest terrain. None of the greens is good. BondCam Forest Green Dark against the edge of a tropical rain forest. Camouflage: David Clode. 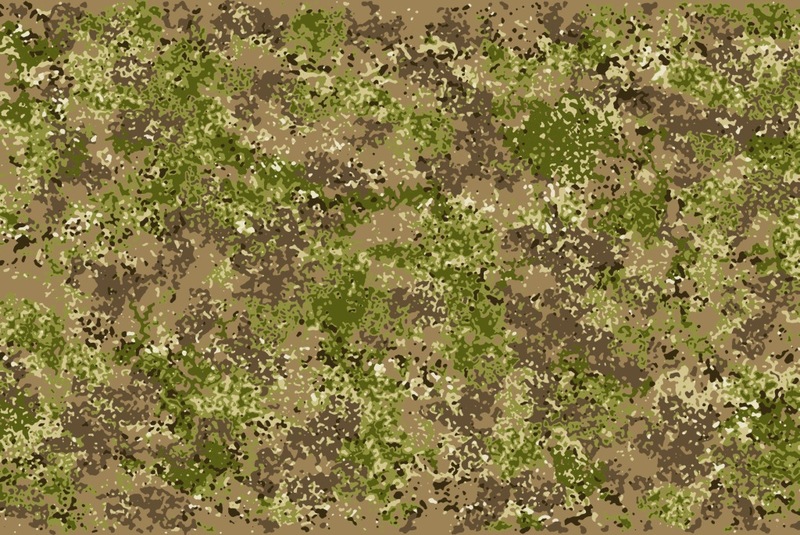 British MTP camouflage (Multi Terrain Pattern – a modified Multicam). The pattern is good, but it is too green for this terrain in the dry season. The Ghillie head-and-shoulder suits are a very good colour, and would be effective, although I imagine they would be hot, and get snagged in thorn bushes. South Africa. Photo: Ichikowitzfoundation.com. 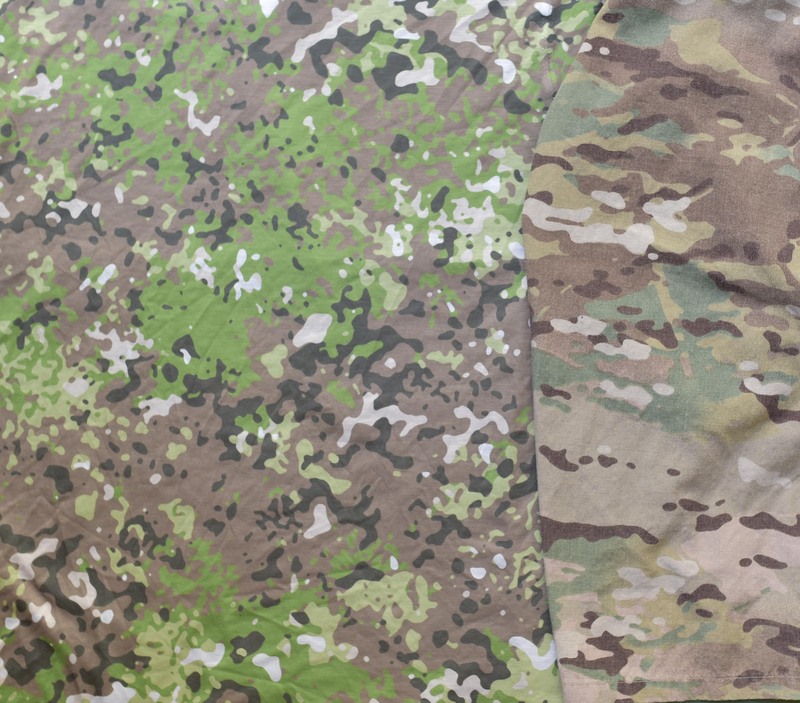 Multicam (and variants such as British MTP in the photo above) are lighter, and work better than olive green/olive drab, or dark woodland patterns, but still not as good as a custom design could be for grassy woodland in the dry season in Africa. 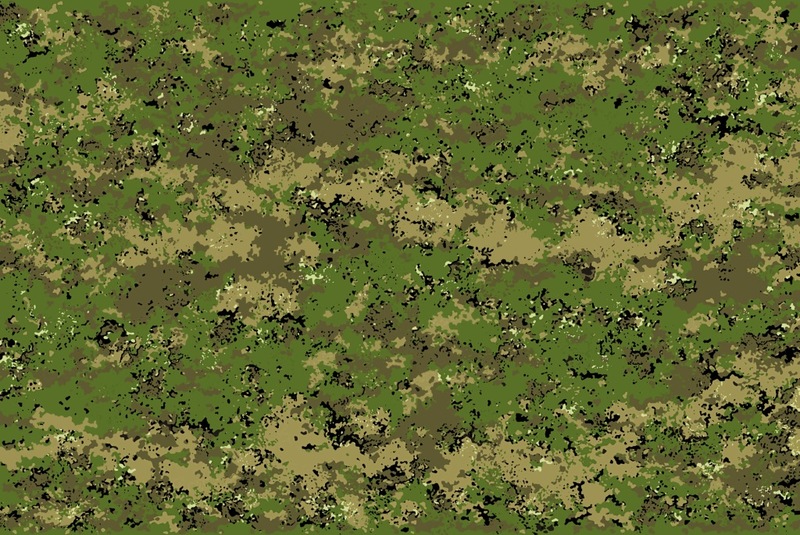 I can custom design camouflage designs as needed since there are subtle differences in the vegetation in different National Parks, or parts of parks, and different times of the year. 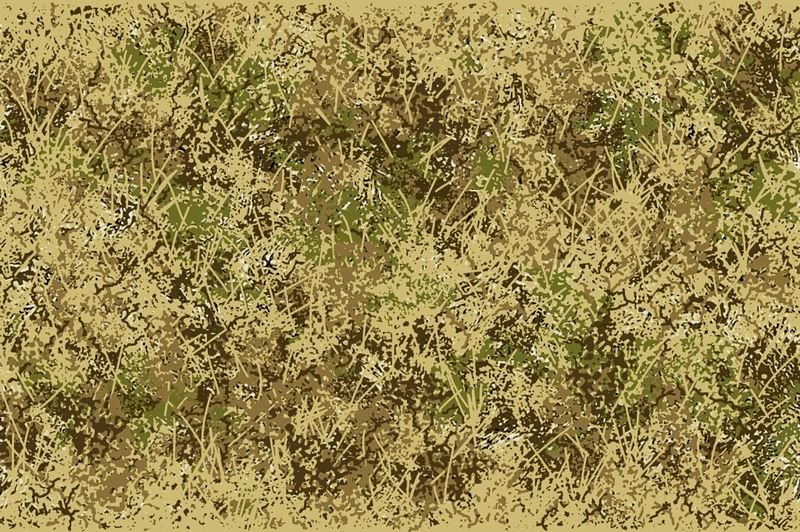 For those interested in purchasing my camouflage designs, I suggest you show them (perhaps large colour photocopies, A3 or larger, on paper) to those actively involved in anti-poaching work, and let them choose what they think will work best – with their practical experience, they are likely to know best. 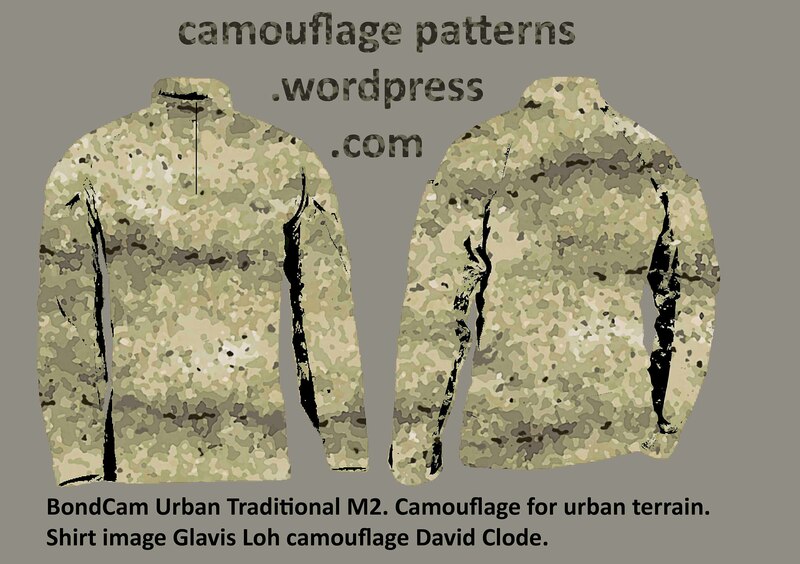 A few-direct-to-garment printed long sleeve T-shirts ot Polo shirts (or just a length of fabric with a hole in it to make a poncho) in my camouflage designs could be tested in the field, compared to each other, and compared to whatever clothing or camouflage is currently being used. Based on feedback and photos from field tests sent to me, I can then fine tune the designs if necessary. A possibility that should work well, since the grass is often around knee to waist height, is to use trousers in a grassland design (wet or dry season design as appropriate), and the shirts could be one of the darker “African Bush” grassy woodland designs. 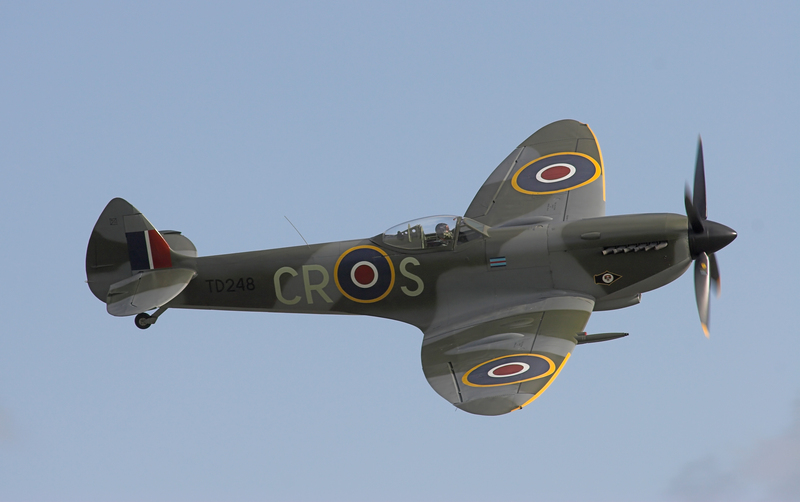 Also, mixing different camouflage designs would be utilising the camouflage principle of “optical division” (also called “dismembering colouration”), which can be very effective. To keep costs down, trousers could be plain olive green in the wet season and beige in the dry season. Finally, frequently changing camouflage designs, and combinations of designs, would keep poachers on the back foot, so that they never know what to expect, and so make anti-poaching units even more effective in their work, as well as keeping them safer. Photo: Protrack. 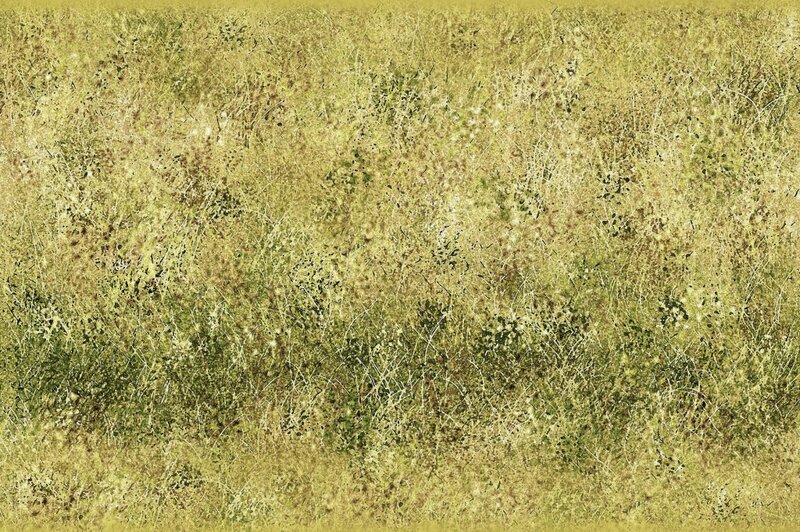 Note the light yellowish creamy dry grass and grey/brown branches, contrasting with the olive green. 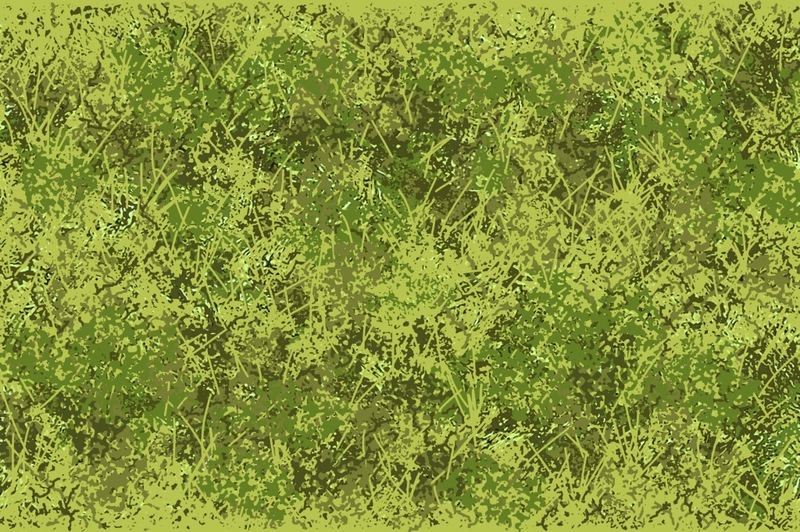 Bondcam Abstract African Bush swatch for the above terrain. 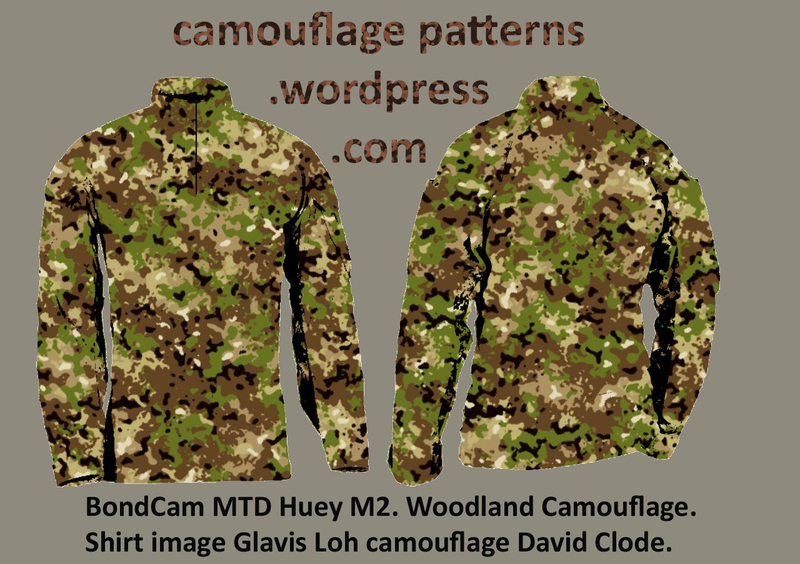 Camouflage pattern by David Clode. Anti-poaching patrol, South Africa. Photo: Protrack. BondCam Acacia M7 Dry Season Darker. Designed for anti-poaching duties in grassy woodland terrain in the dry season. Camouflage design by David Clode. Acacia M7 Dry Season Darker Low Contrast. 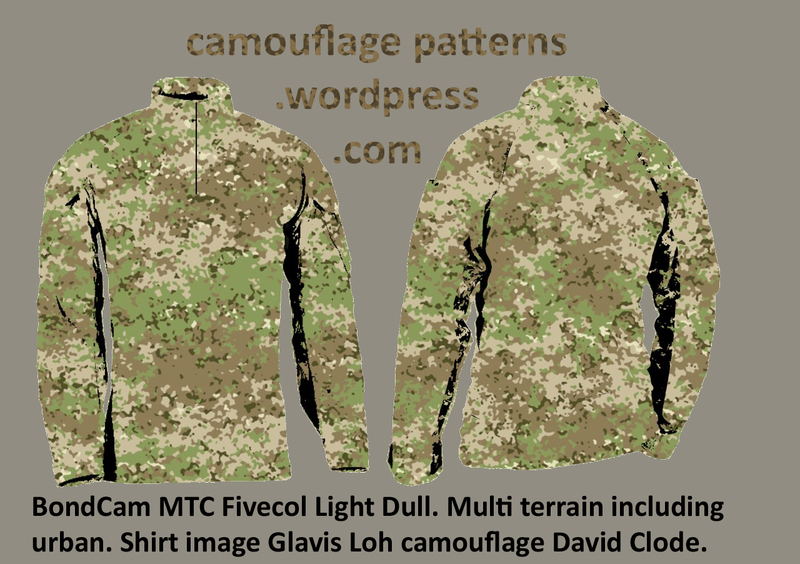 Camouflage David Clode, render Glavis Loh. Bondcam Broad Spectrum M2 Improved Dry Light. 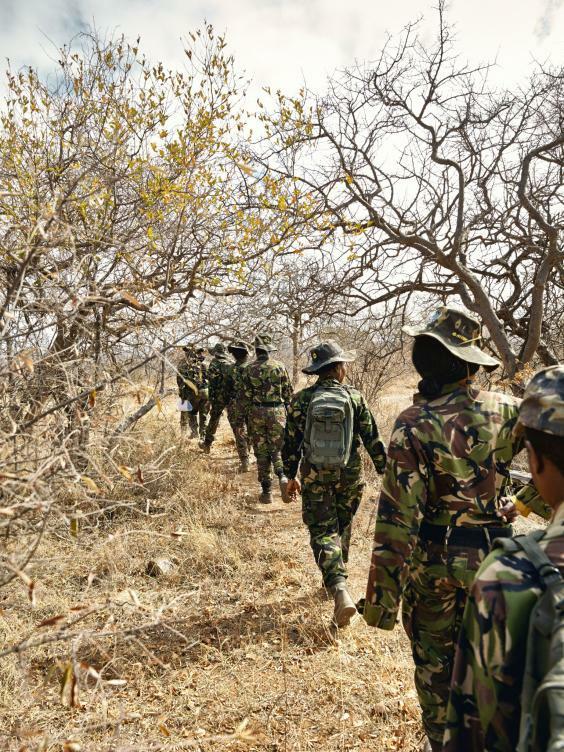 In this photo of anti-poaching rangers, the the mockup uniform has been given a faded look to simulate a used and susty loo. Camouflage design by David Clode, mockup by Roger Dix, photo by National geographic. 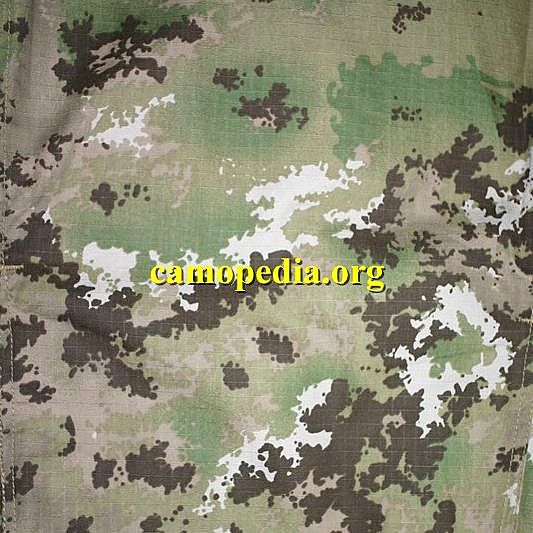 A mockup of BondCam Frontline Anti-poacher Dry S (faded to make the uniforms look like they have been washed and worn a great deal, and some local dust has been applied). Mockup: Roger Dix, Camouflage design: David Clode. To me, this poster makes it very clear that there is no time to waste. A good tried-and-tested compromise camouflage which works reasonably well over both sea and land in Northern Europe. Photo: Chowells, Wikimedia Commons. Iraqi helicopter. 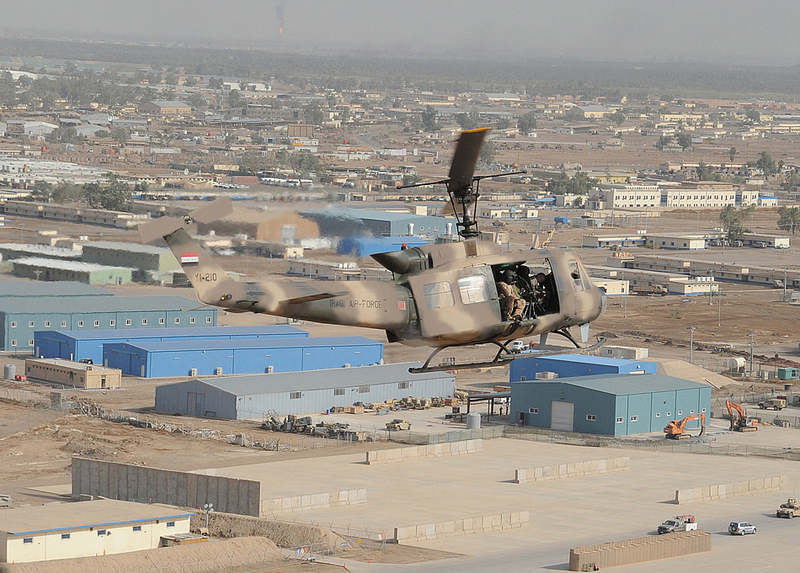 Photo: Strategypage.com “US Airforce trains Iraqi helicopter pilots”. This helicopter has a good camouflage design, and a lot better than most. However, note the hard or sharp edges where the colours meet, and that the darkest colour covers about 45% of the helicopter, the lightest colour covers about 45%, and the mid colour only covers about 10% of the helicopter. My modifications in the photo below show some potential improvements: I have changed the mid colour slightly, the edges between the colours are now soft and blurry, and I have changed the balance of the colours/tones. The darkest colour/tone now only covers about 30% of the helicopter, the lightest colour now only covers about 30%, and the mid colour about 30% (about 10% would be the blended or blurred edges, and 50:20:20:10 would probably be better, i.e. mid:light:dark:blurred). These are not, and do not have to be, exact percentages, the point is that the mid colour should be more dominant than the photo above, while the more extreme light and dark colours, which tend to stand out, should play a more-or-less equal or preferrably secondary (but nevertheless important) role. Ideally, the top of the helicopter should also be a bit darker, and underneath light (counter shading). I do appreciate that the tail rotor needs to stand out for safety, I just wanted to make a point. 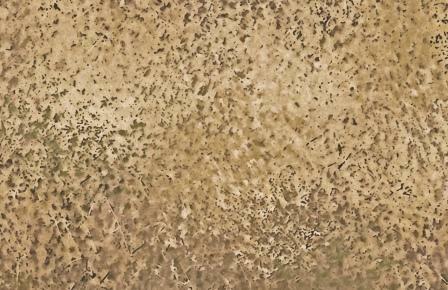 Iraqi helicopter – improved camouflage by David Clode. DIY camouflage tutorial. 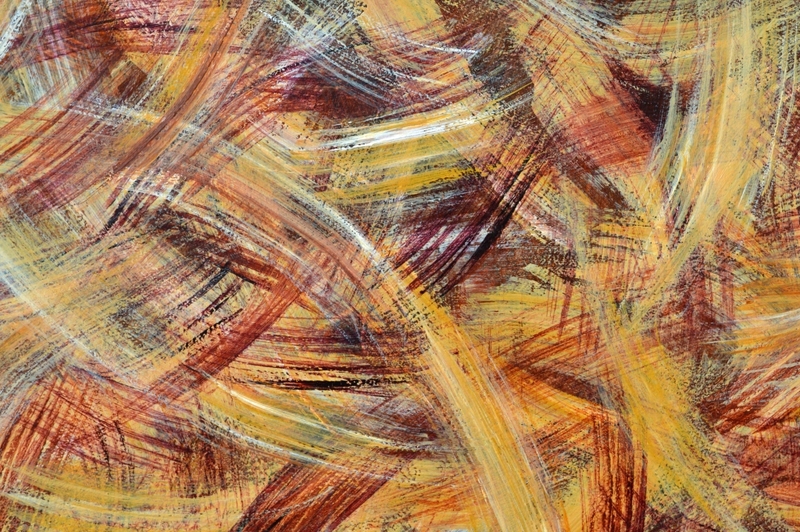 Mostly original colours, with disruption, dithering and touches of light and dark. 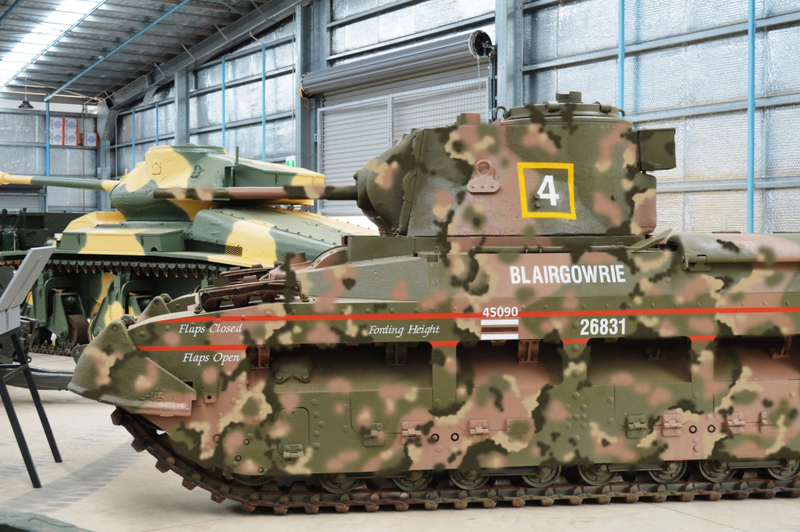 Photo: An Australian British-made Matilda mk 11 infantry tank, Australian Armour and Artillery Museum, Cairns. Photo and camouflage demonstration done in photoshop by David Clode. See the page “DIY camouflage tutorial – vehicles”. As can be seen in the photo below, British MTP clearly works extremely well in the green zone in Afghanistan, but is perhaps too green for the dry zone, and dusty villages. 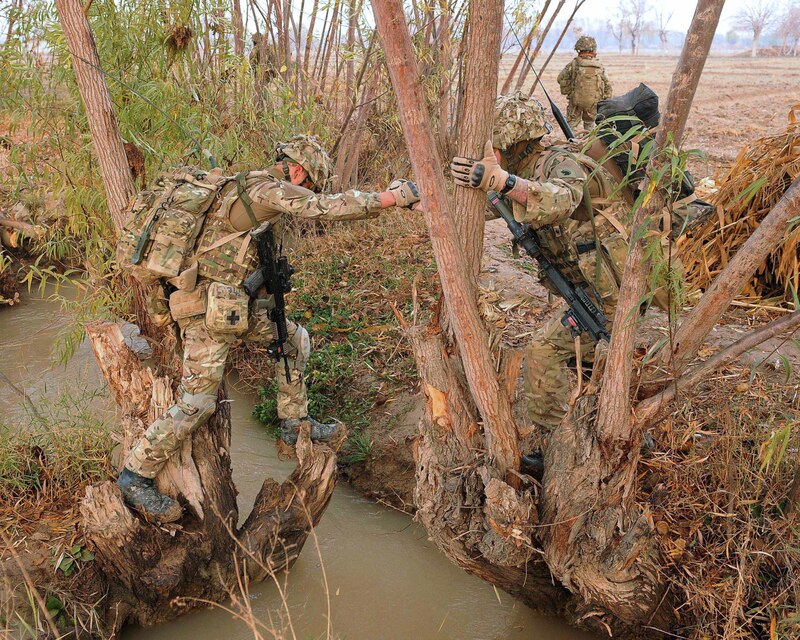 Royal Marines of Bravo Company, 40 Commando cross an irrigation ditch while on patrol through local farmland in the vicinity of Torghai, Narh-e-Saraj, Central Helmand, Afghanistan. Photo: Military.wikia.com. British MTP is a multi terrain pattern which works particularly well in rough grassland. Photo: Allan Osment. 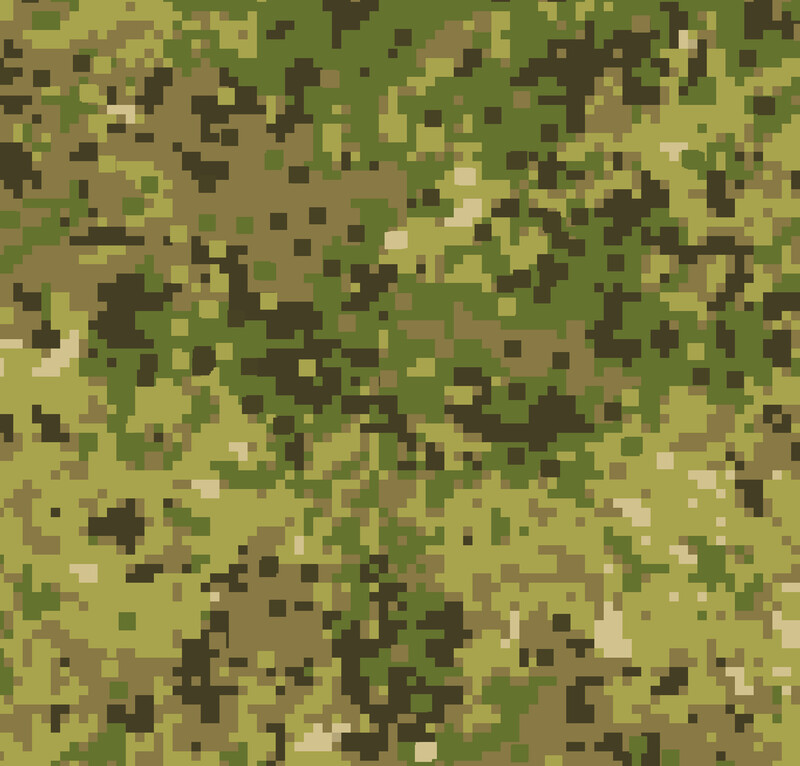 In the camouflage design above, if a soldier was standing, the band of darker green would help to match the forest in the background (and would appear more or less randomly on a uniform), and help to break up the shape of the body. Two versions of British DPM in a deciduous forest (the New Forest) in England. The design works reasonably well in relatively light deciduous forest, through to dense, dark jungles. Photo: Allan Osment. See the “Allan Osment Camouflage” page, where, in my opinion, British MTP has been surpassed! There is a snake in the photograph. Try finding it before you read on. 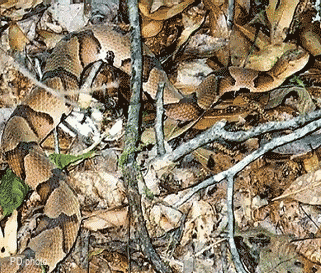 A Gaboon viper camouflaged among leaves (bottom left) with its light coloured head on the left. South Africa. Photo: Sareptiles.co.za. This venomous species of snake has the longest fangs in the world (up to two inches long – imagine those stabbing into your leg) and would be easy to step on – fortunately they generally avoid humans and have a quiet and peaceful nature (if left in peace). 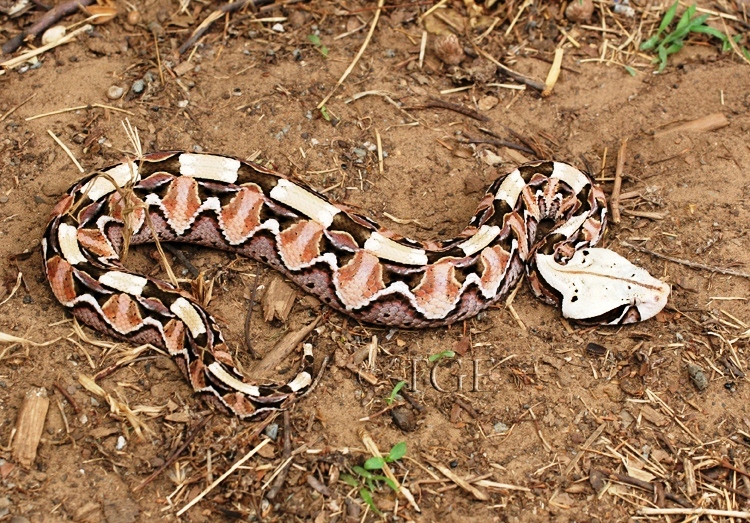 East African colour form of the Gaboon viper (or Gaboon adder), Bitis gabonica. Photo: Echitobplusicp.org. The North American Copperhead snake is another snake which has excellent camouflage in fallen leaves. This one is relatively easy to see. Photo: http://www.adventureclassroon.org. 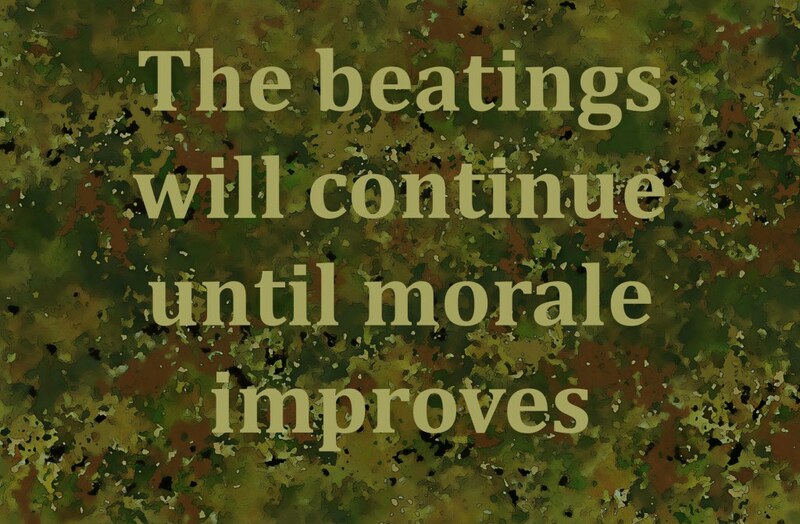 See the Military Motto page for more. Camouflage resources: camouflage web sites, books etc. Under construction, and hopefully more sites and links to be added. 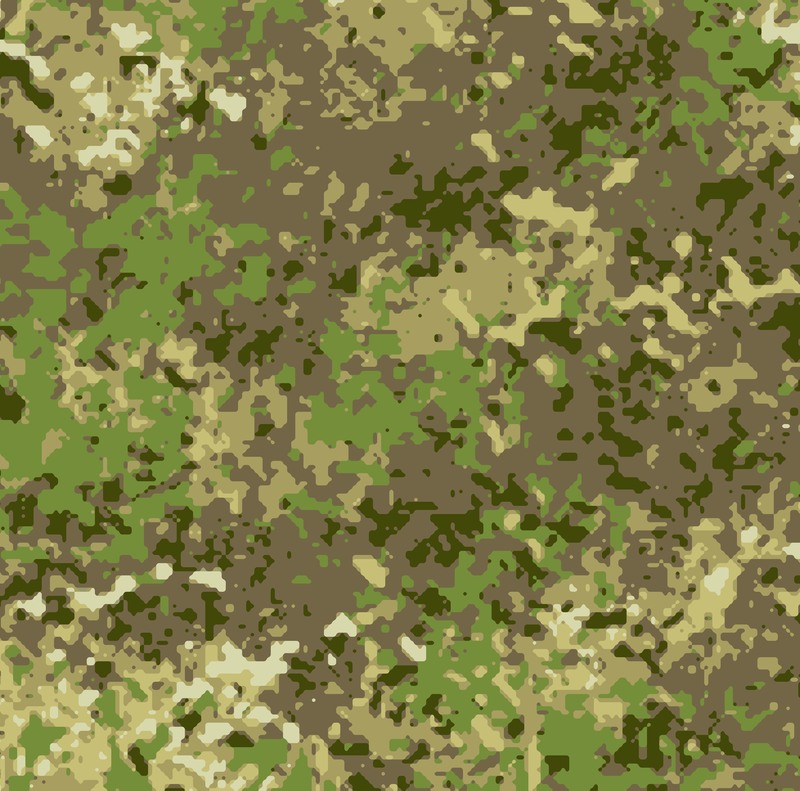 I have made a point of including and providing links to sites that design/sell camouflage patterns – I am in favour of healthy competition, and wish them well. Hidden Success. Book cover. Author: Matthew Dermody. See the “Ghillie Suit” page for more on Matthew Dermody. Deception by Design. DVD. ABC Arts. Jonnie Morris Director, Kate Pappas Producer. Newark, Tim. 2013. The Book of Camouflage the Art of Disappearing. Osprey Publishing. ISBN 978 1 78200 831 6. Newark, Tim. 2007. Camouflage. Thames & Hudson Ltd. ISBN 978-0-500-28710-1. Camopedia.org. Excellent! Aside from the images, I also greatly appreciate the “short histories” about the various countries. 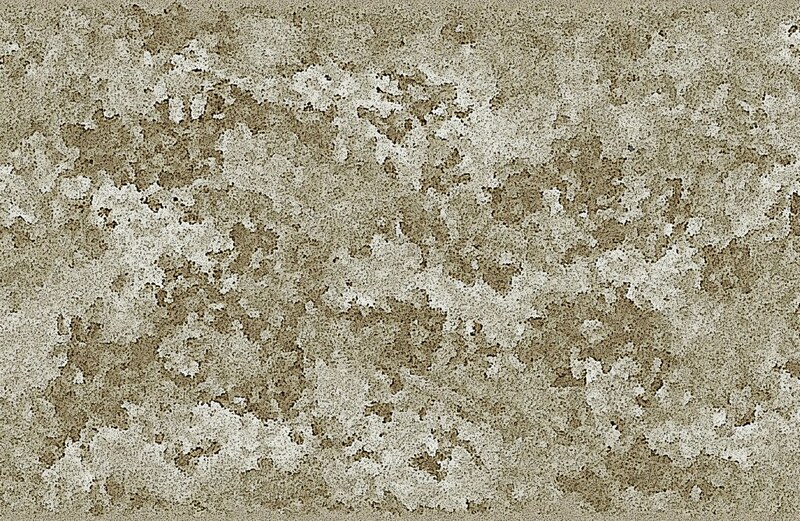 Thanks to Eric H. Larson for giving me permission to use some of his excellent photos of camouflage tiles from this site. Strikehold.net. Congrats to the webmaster, especially the very thorough coverage of “21st century camo”, and the clear explanation of digital camouflage. http://www.hiddensuccesstactical.com/ . 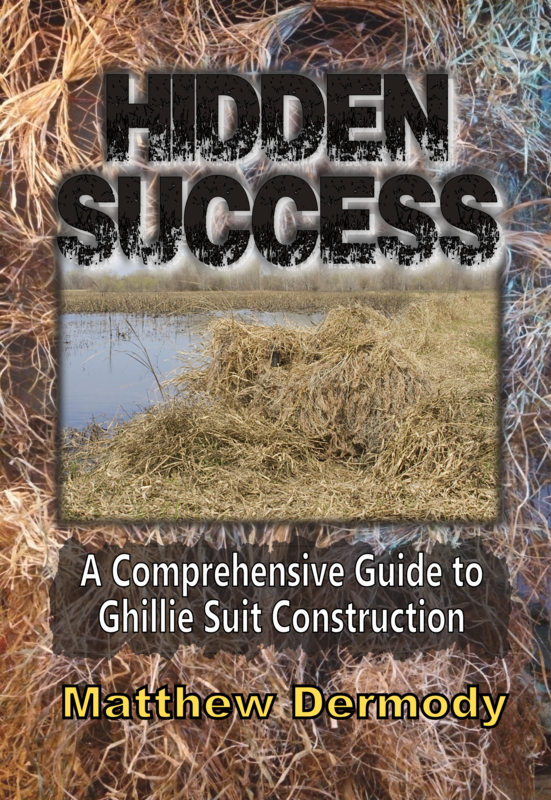 Matthew Dermody’s site is the site for Ghillie construction. A-TACS AU . Probably the best urban camouflage design in production to date. Multicam. Genius! 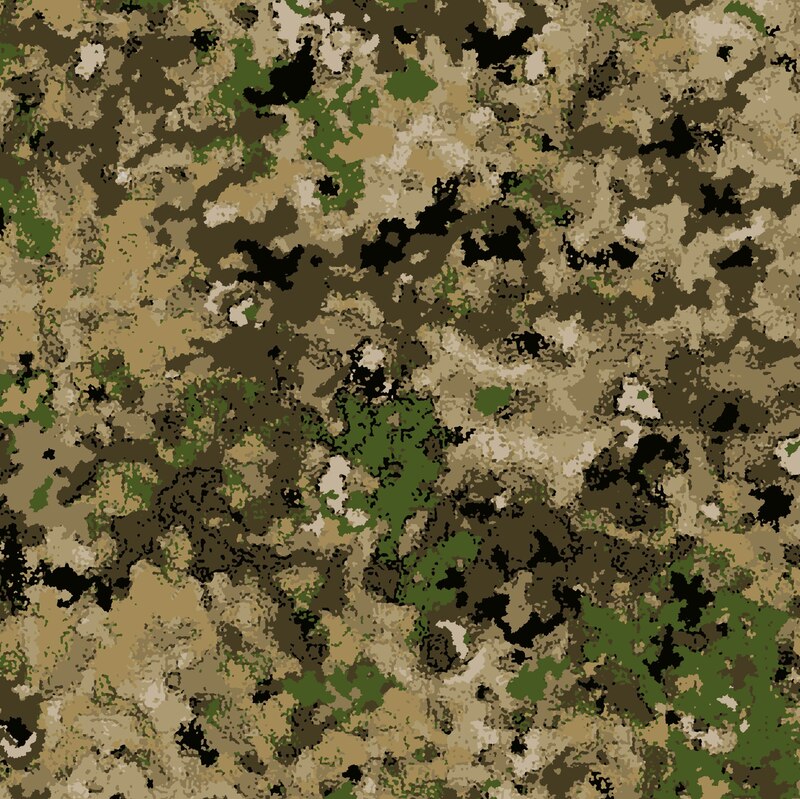 Generally considered to be the best multiple terrain camouflage by many in armed forces, particularly special forces, around the world. Used by Denmark, and variations in use by Australia, the UK and Montenegro. The similar Scorpion design may come in to use by the USA. Brookwood. Not surprisingly, did well in Natick testing. Hyperstealth. An amazingly comprehensive range of patterns for just about any application. The light and dark edges in US4ces (which enhances the optical illusion of depth and disruption) is a significant advance in digital camouflage design, as is combining blurred or faded effects with the hard edges of digital rectangle/square shapes (Deceptex). Realtree, Mossy Oak, Treflage etc. Hunting camouflage. Photographic style, specific habitat/vegetation designs, mainly for hunting, and mainly aimed at North American terrains. These generally work extremely well in the specific terrains/vegetation types for which they were designed. In my opinion, companies that provide hunting camouflage should produce designs suited for hunting in other countries, e.g. licenced big game hunters in Africa, feral pig and goat hunters in Australia, etc., as the designs for North American terrains do not work well in Acacia-dominated grassy woodland in Africa, or Eucalyptus-dominated grassy woodland in Australia. Hunters can play a part in conservation by controlling the numbers of introduced pest species, such as goats and pigs in Australia, and controlled licenced big game hunting can and should fund conservation. 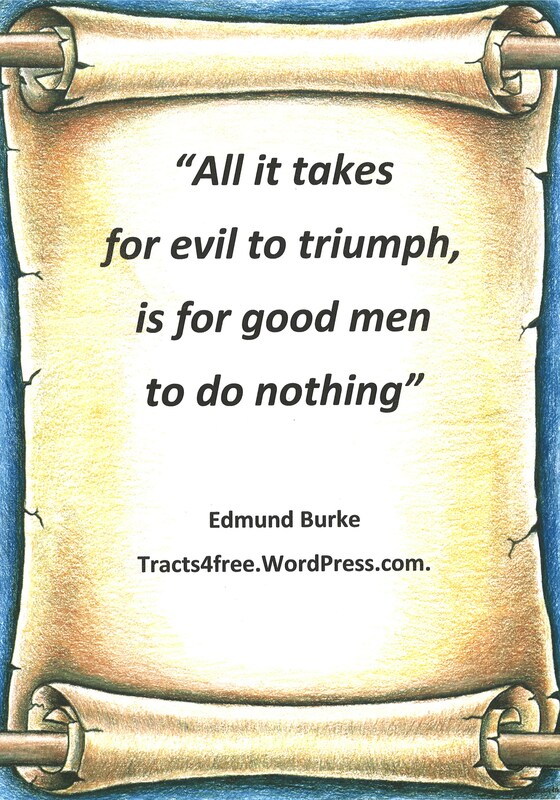 “All it takes for evil to triumph, is for good men to do nothing” Attributed to Edmund Burke. “Lest We Forget”. ANZAC War Memorial poster, Cairns. Esplanade Australia. ANZAC stands for Australian and New Zealand Army Corps. This poster by David Clode is free to download, copy and share.